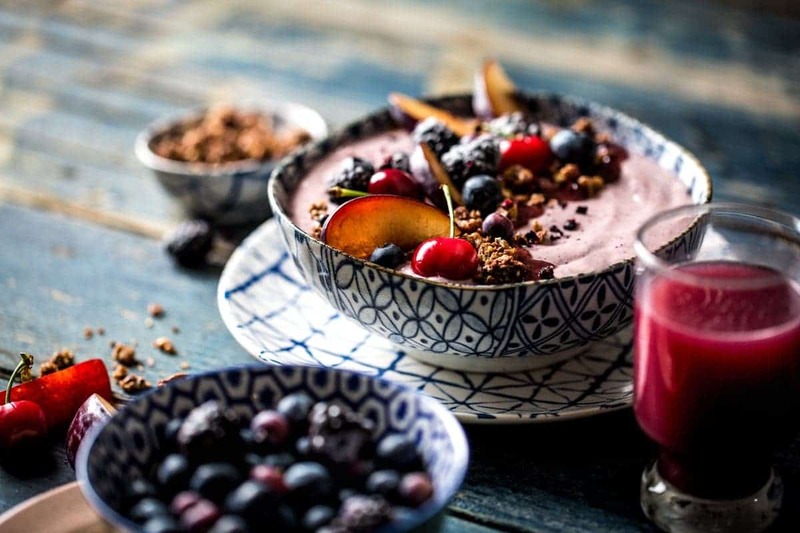 Who doesn’t love a good smoothie bowl? 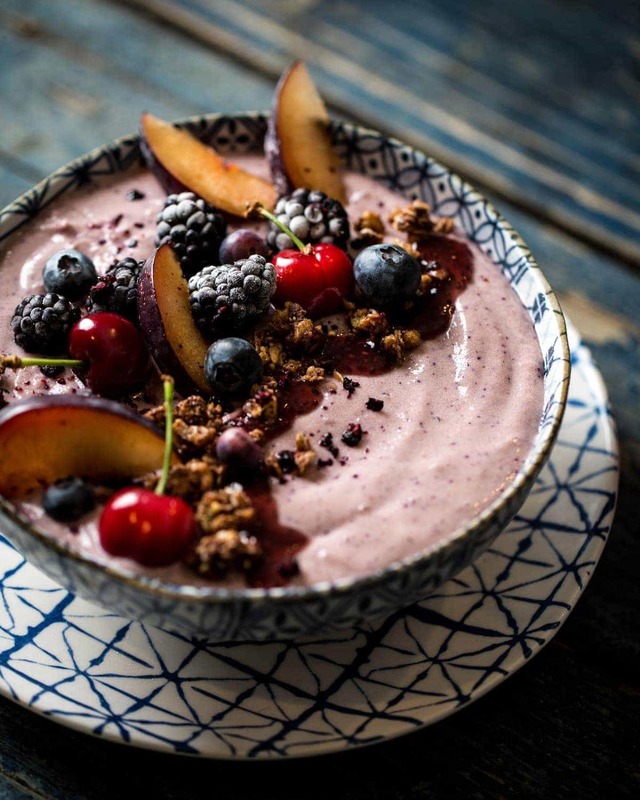 Who doesn’t know what a smoothie bowl is? 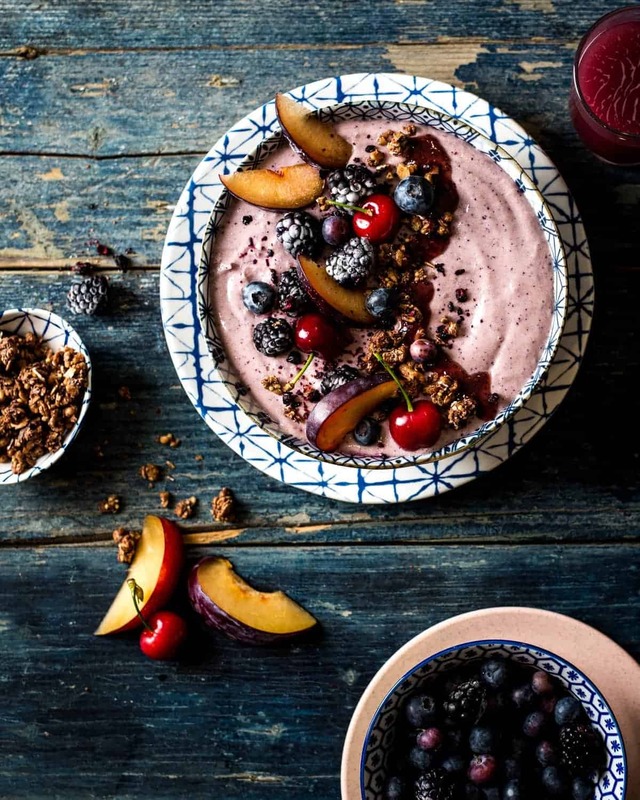 Well, if a smoothie and a bowl of yogurt with fruit and toppings had a baby, it would look like a smoothie bowl. Creamy greek yogurt is combined with frozen fruit, ice and cherry juice in a blender and pureed until smooth and thick. The mixture is transferred to a bowl and topped with assorted toppings. Any number of toppings can be used. 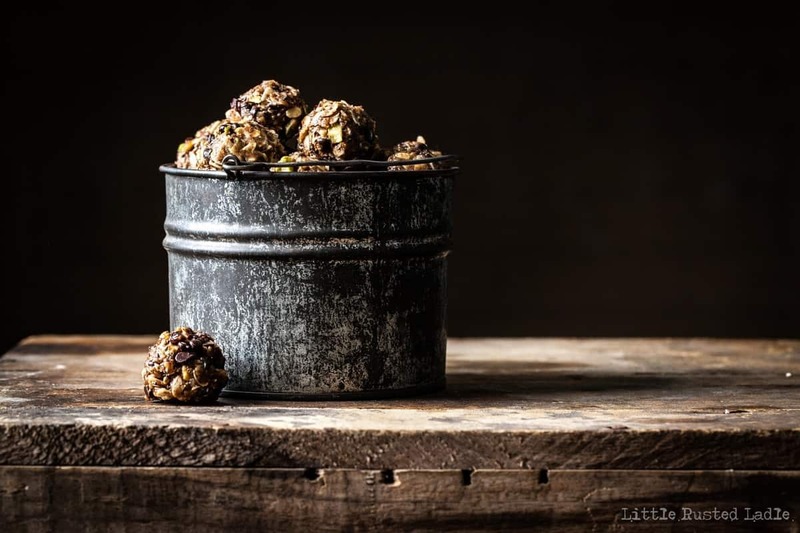 They can be healthy toppings such as flax or chia seeds, unsalted nuts, raw coconut, granola or fruit, or not so healthy items such as chocolate, broken cookies or even candy bar bites. We decided on a more healthy approach. We combined Noosa Vanilla Bean Yogurt ( feel free to substitute plain yogurt) with tart cherry juice, frozen tart cherries, frozen blackberries and blueberries and a few ice cubes. The toppings chosen were bing cherries, fresh plum slices, more frozen blackberries and blueberries, gluten free granola, some crushed freeze dried blueberries and a drizzle of pomegranate syrup which was simply pomegranate juice reduced in a saucepan to a thickened syrup. 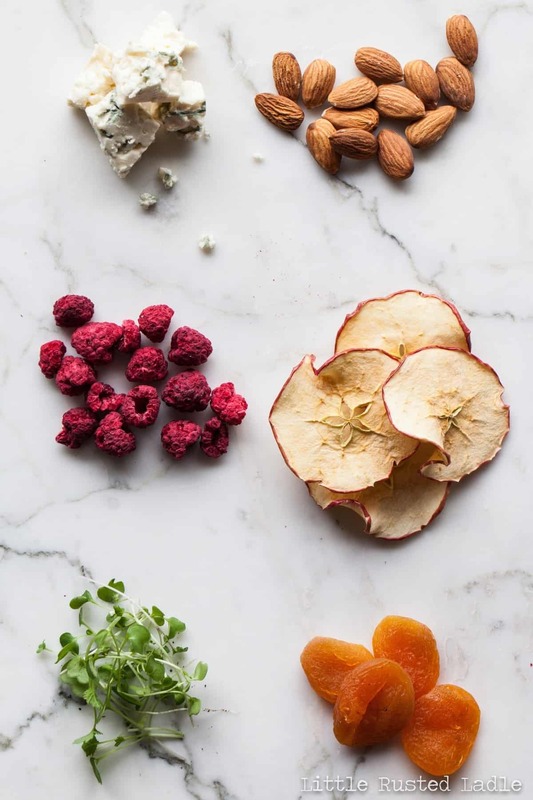 The key when deciding what to use for your toppings is to use fruits that are in peak season. Combine them with different textures, shapes and colors. 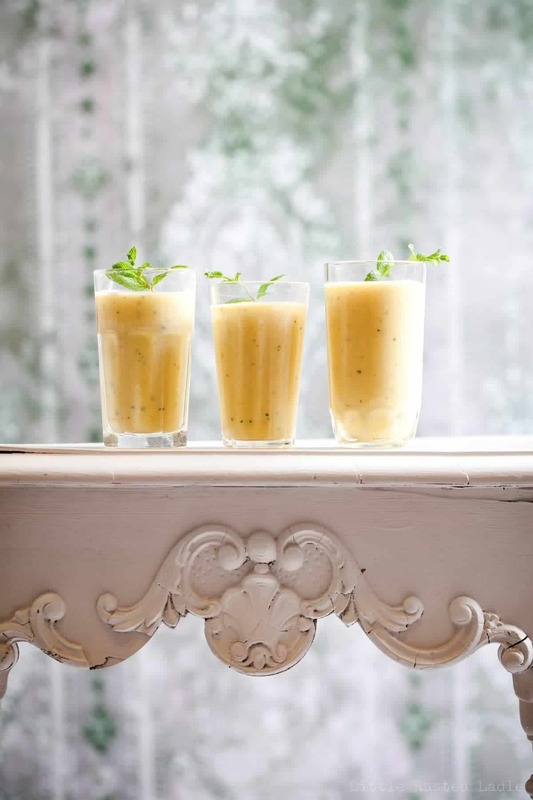 Adding a crunch element to the cold creamy smoothie will give your tastebuds a wonderful surprise. I think that’s what I like about smoothie bowls versus plain smoothies or plain yogurt. 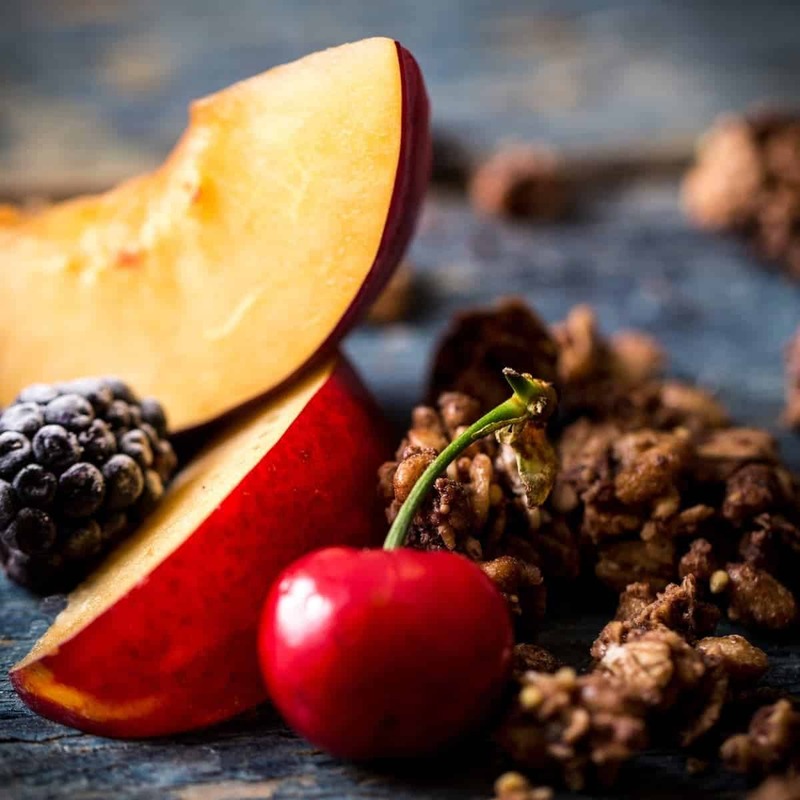 The flavors and textures of both combined really takes fruit to a new level. I am looking forward to trying this combo made with decadent, full fat ice cream and maybe a few broken brownie bites and glazed nuts. Yum. Well, we hope you enjoy making your smoothie bowls as much as we enjoyed ours. We’ll be back soon. If you’ve enjoyed our photography and Instagram, please vote for us on Saveur’s Food Blog award nomination page. Jena and I would really appreciate your help in helping us win the award for best photography and Instagram. Have a great weekend and don’t forget to cook with love and live to cook. 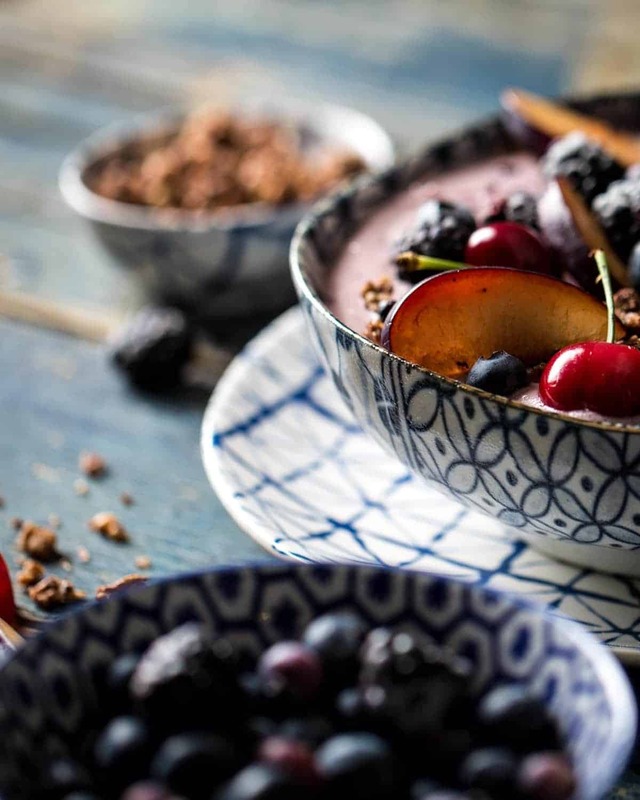 Creamy yogurt, berries and cherries join forces to make up a delicious way to start your day. 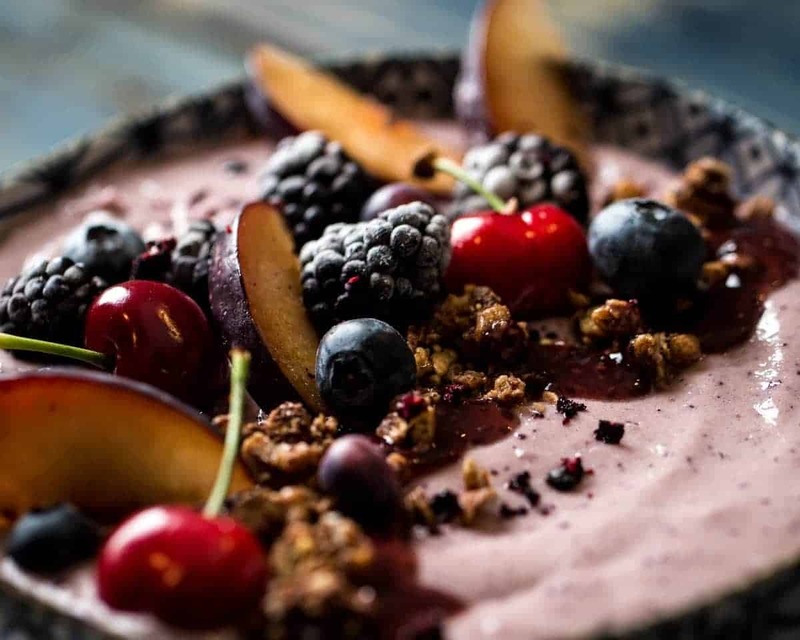 Granola, fresh plums, berries and a pomegranate syrup round out this tasty take on a classic smoothie. Pour pomegranate juice into a small saucepan. Bring to a boil over medium high heat. Reduce liquid to about 2 tablespoons. Set aside and cool to room temperature. Add the yogurt and the next 5 ingredients in a blender. Blend until smooth. Pour mixture into 2 bowls. Top each with remaining ingredients and serve. When it comes to Father’s Day, I can’t think of a food more dads desire than a big, juicy, mouth watering steak on the grill. After all, us hunters and gatherers are known for cooking our meat after a long hunt. I do realize that today’s dad is in no way similar to our neanderthal relatives. There are very few of us men left who go out hunting for our food and I’m no exception. In today’s world, we get our meat from butcher shops, grocery stores and even buy steaks online. So now that you know what dad wants to eat on Father’s Day, who’s fixing their man a big steak this year? What do you mean he does the grilling? What do you mean you don’t know how to cook a steak? On Mother’s Day, mom usually wants to be pampered. As husbands, we take mom out for brunch or cook mom breakfast in bed. After all, mom knows that a day named after her means she gets to relax and be taken care of. At least that’s what us men should be doing for mom. So why would dad want anything different? Truth is, we do like to be pampered on our day too. Steaks can sometimes be difficult to make. What cut of steak?, what grade of meat?, what do I season it with, how to cook it? These are a sampling of questions many women ask when trying to tackle preparing steak. Well, today I’m going to answer all your questions about how to make the perfect steak for dad and do it so easily, he may not want to take the job back. There are a few key things to consider when planning on preparing a steak for dinner. What cut of meat to buy. The quality of the meat. How to season it and how to cook it. The first item on the list is what cut of meat you’re buying. If you want a steakhouse quality, melt in your mouth tender steak, then you have only a few options. A filet, a ribeye, or a strip steak. Those 3 cuts of meat are on every steakhouse menu for a reason. They are the best. I prefer a nice strip steak, but if you pick any of those cuts, you’ll be fine. If you’re wondering why I didn’t mention a t-bone or a porterhouse, it’s because a t-bone or porterhouse steak is made up of both a strip steak on one side and a filet on the other with a bone in between them. They cook a little different than the others because of the bone, so I’m leaving those out. So your hopefully at the best butcher shop in town and you’re looking at the large case of meat and you’ve decided on a strip steak, but there’s one sign that says choice strip steak, one that says grass fed strip steak and one that says prime strip steak. Which one do you choose? 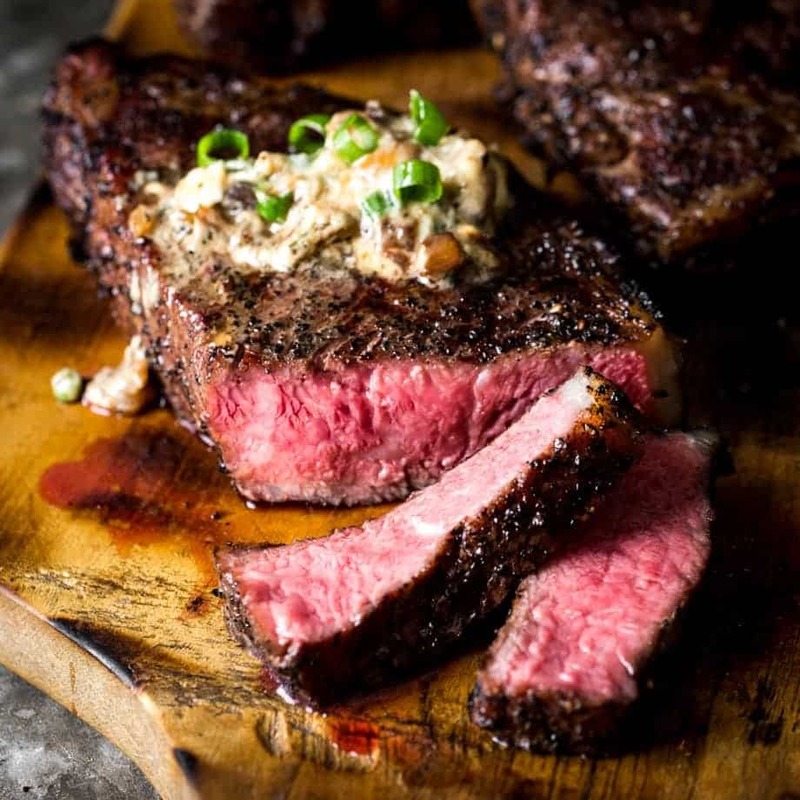 You choose the prime strip steak and here’s why. Because a prime strip steak is the ferrari of steaks. Only 1.8 % of all beef processed in the states is graded as prime. Prime is to steaks what flawless is to diamonds. And, just like a flawless diamond, a prime steak will be the most expensive steak in the meat case. They are also the only ones the best steakhouses in the country use. So why are prime steaks so good? Because of the marbling. All steaks have a certain amount of fat in them. Tenderloin has the least amount, which makes them very tender, but often means you get less flavor. Fat means flavor, especially when it’s marbled into the meat. 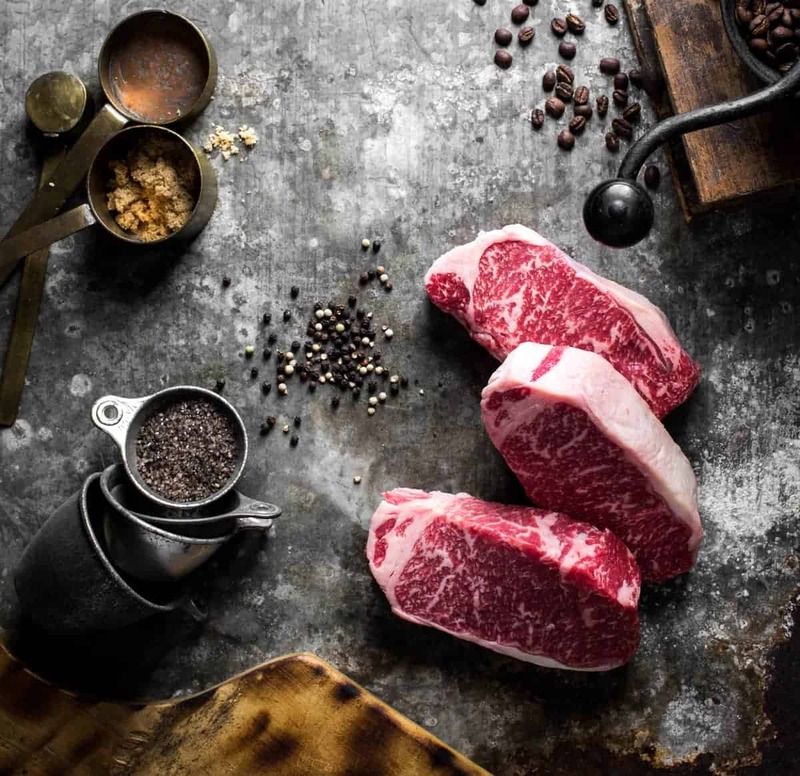 Prime steaks are extremely well marbled, which means the fat is woven through the lean muscle. When those steaks are grilled, the fat melts, keeping the lean muscle around it juicy and giving it more flavor. The raw steaks in the photos are all extremely well marbled prime strip steaks and are all about 1.75” thick. I think I paid about twenty four dollars a pound for these babies at a wonderful store called Brennan’s Market in Oconomowoc, WI. They carry only prime beef in their store, which is extremely rare, pardon the pun. How does that compare to other steak prices? Well, take a look at these wagyu beef strip steaks available for overnight delivery on Amazon. They are $995.00 for 4 / 18 oz. steaks! Sure, the marbling is off the charts, but I’m guessing that you don’t want to spend $250 for a steak that you have to cook. Why not buy the choice steak or the grass fed steak? Choice steaks are below prime. Choice is good, but about 38% of beef is considered choice, so it doesn’t compare to prime. As for grass fed versus corn fed goes, remember that cows are fed corn for one reason. It makes for bigger, and better beef. Grass fed steaks will ALWAYS be tougher and you will almost never find grass fed prime steaks, because they aren’t as marbled. 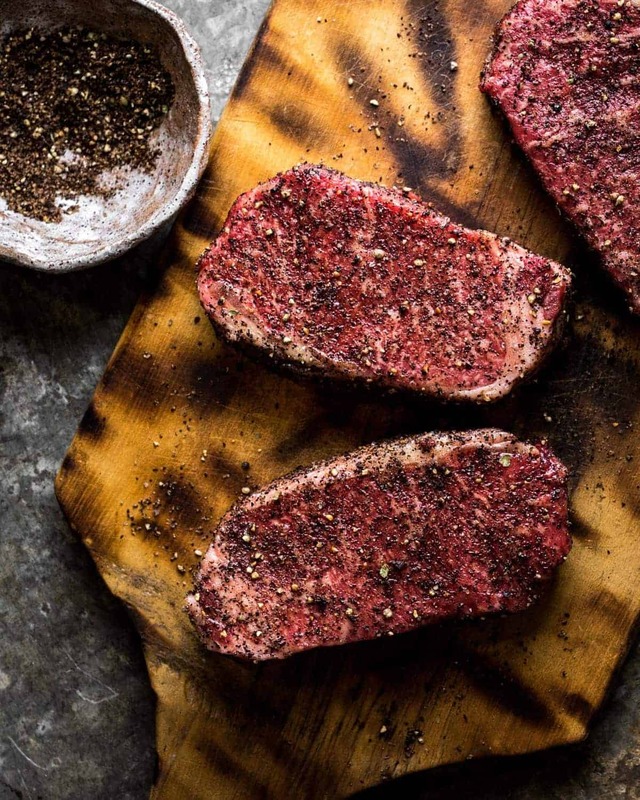 Grass fed may be trendy, but it’s not good for high end steaks. Leave it for flank, skirt or round steak. Alright, you’ve confidently walked out of the store with your thick cut, prime strip steaks, you put them on the counter and now what? Let’s start with seasoning the steaks. My favorite seasoning is a coffee, black pepper, brown sugar and rosemary blend which tastes wonderful with a great steak. Just rub it all over the steak, then let the steaks sit at room temperature for about 20 minutes. Why let it sit out? Well, cold meat will tighten up when it’s subjected to high heat, and we don’t want our twenty-five dollar steak to tighten up. We want it relaxed, which brings us to our cooking method. The options for cooking the steaks are grill them or pan sear them and finish them in the oven. But wait, why not sous vide the steaks? Sous what? Sous Vide, which sounds like (sue veed), is all the rage now. It is basically placing food in resealable or Foodsaver style bags and removing the air from the bag. The bag is then submerged in a water bath that is kept at a constant temperature, cooking the food perfectly and keeping it at that temperature for extended periods of time. 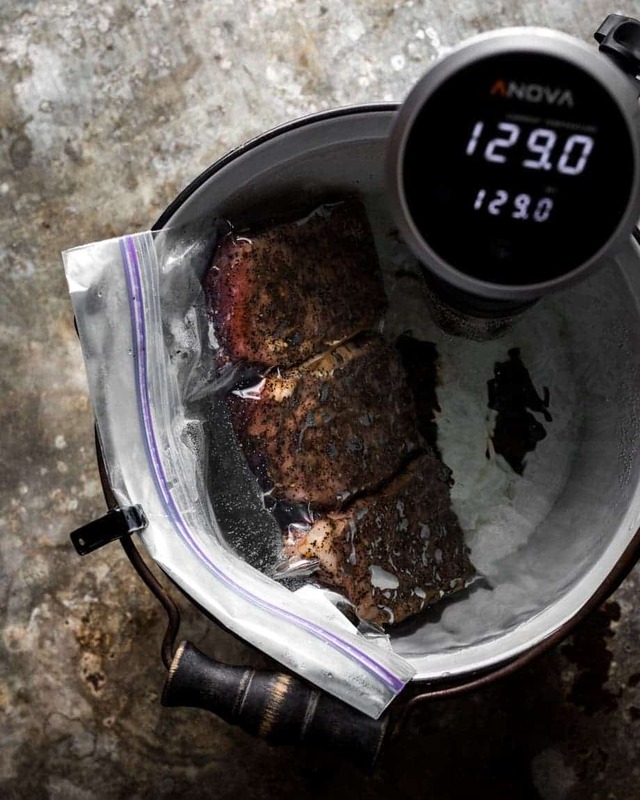 It takes about an hour to cook a steak using a sous vide cooker. The best thing about sous vide cookers is that you don’t have to watch them. Put the food in the bag, put it in the water and set the timer. 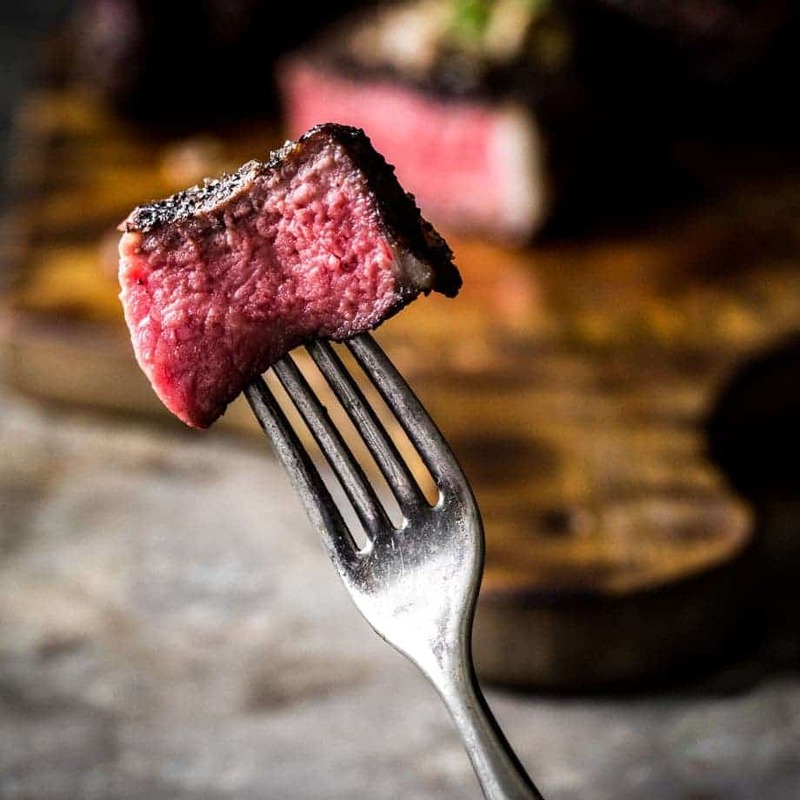 Once done to the temperature you want, a quick sear on a hot grill or in a hot pan for one minute per side will give you a perfectly cooked steak every time. I have an Anova Sous Vide Cooker, which I love. There are a few other versions available and the cost is a lot cheaper than that grill you were looking at. About $100 for a basic one. The best part is you place it in the container of your choice. 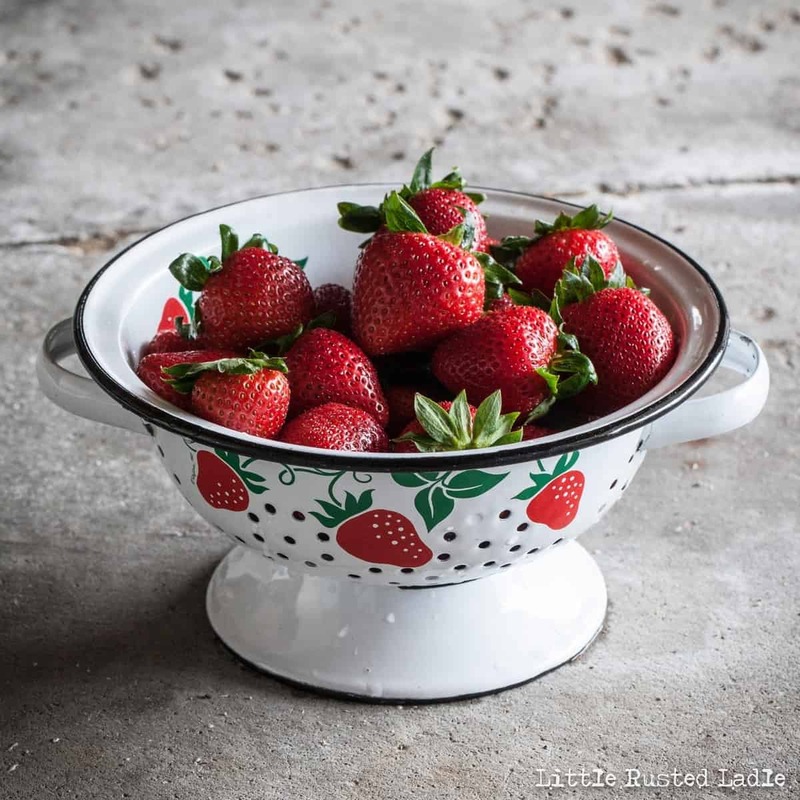 A plastic container, a dutch oven, or even an old cooler can work well. You just put it in the container of water, plug it in and turn it to the temp you want. There’s a simple app that gives the temp to set it at and the time it will take. That simple. They cook a lot more than steak too. Seafood, vegetables, chicken, even desserts. Or, infuse your booze with unique flavorings in minutes rather than days or weeks. Trust me, once you’ve tried one, you’ll love it. 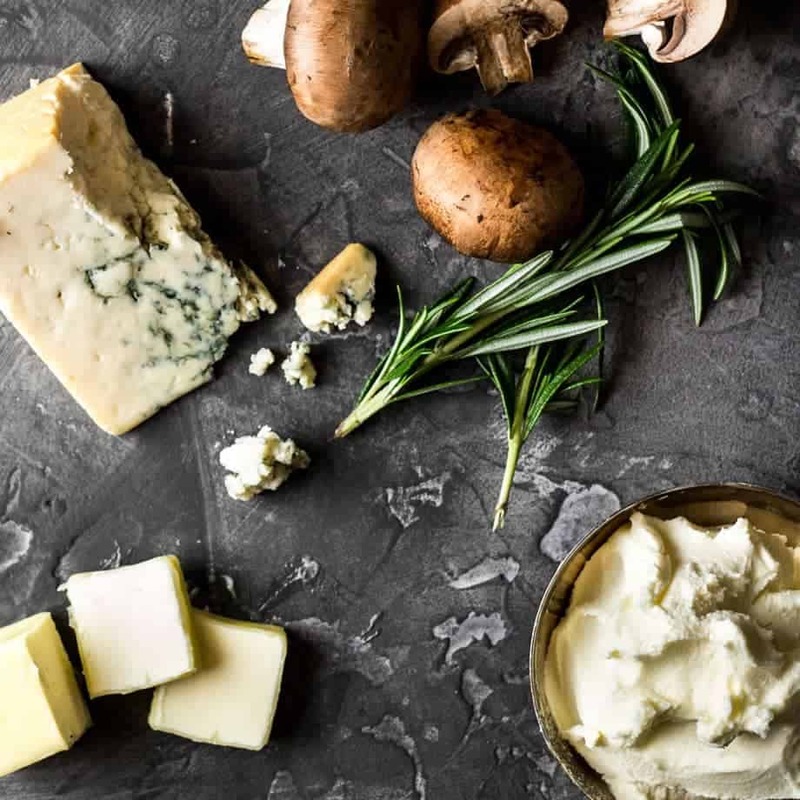 For that gourmet steak house touch, top it with a decadent smokey blue butter made with a Wisconsin smoked blue cheese called Moody Blue by Emi Roth Cheese. Roth is the cheese company that won the world cheese championship last year for their Grand Cru, so they know how to make fabulous cheese. Wow, my mouth is watering already. So, hopefully these tips on buying steaks will help take the confusion about what to get dad this year. If you’re not up for buying dad a sous vide cooker, and you don’t really want to take a chance on grilling steaks, just put a bow on those prime steaks and hand them to dad. Chances are pretty good he’ll have a big smile on his face. Good luck, and Happy Father’s Day to all you dad’s out there. Enjoy, and remember to cook with love and live to cook. 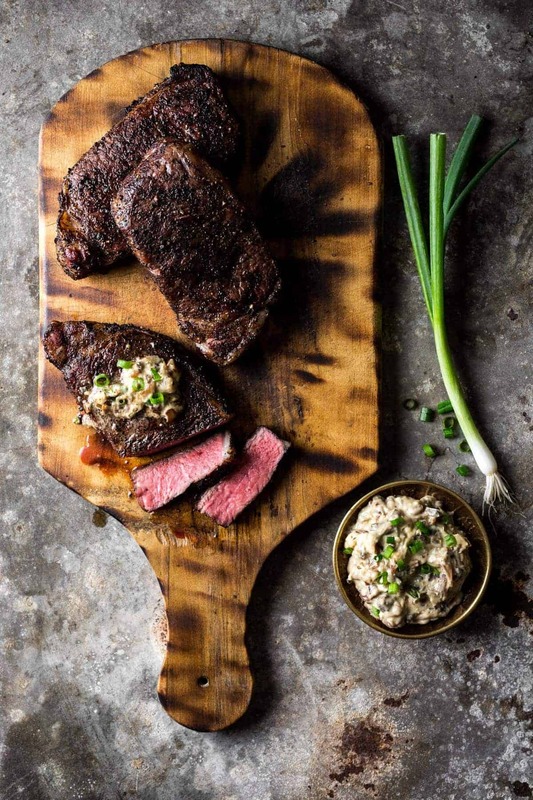 This recipe is about as good as it gets when it comes to creating a perfect steak. Thanks to prime steaks, a robust coffee rub and cooking it by sous vide. Of course the smokey blue butter with it just makes it that much better. In a small bowl, combine coffee and next 3 ingredients. Rub on all sides of steaks and let steaks sit at room temperature for 30 minutes. 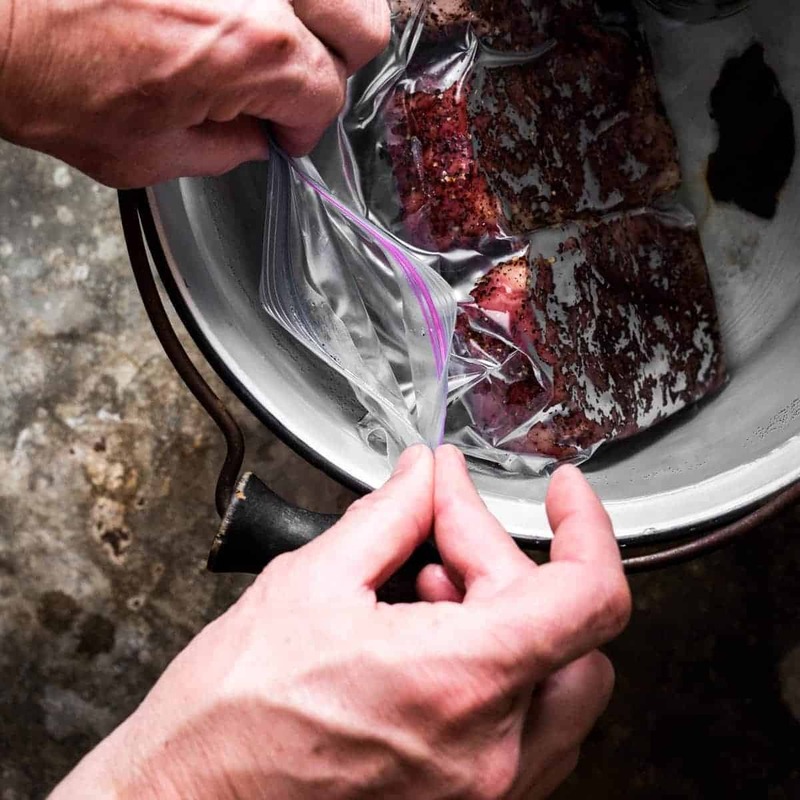 Place steaks in a one gallon re-sealable plastic bag. Fill a large container with about 2 gallons of water. Submerge bag of steaks in water just below the slide lock. Seal bag, removing as much air as possible. Transfer bag of steaks to a plate and set aside at room temperature while preparing sous vide cooker. Follow instructions for cooker and set temperature to 129 degrees. When water is set, place bag of steaks in the water. Cook for 1 hour. Remove steaks from bag and pat dry with paper towels. Transfer to a clean plate and set aside while preparing blue cheese butter. For butter, add butter to a large skillet over medium heat. Add mushrooms, onions and garlic. Cook for 15-20 minutes or until deep golden brown. Add bourbon off heat. Cook until bourbon is almost evaporated. Remove from heat and let cool. Transfer onion mixture to a bowl and refrigerate for 10 minutes. Add remaining ingredients and blend with a hand mixer until blended. To finish steaks, sear steaks on a very hot grill for 1 minute. Turn steaks over and grill and additional 1 minute. Transfer to plates and top with a dollop of blue cheese butter. Serve. 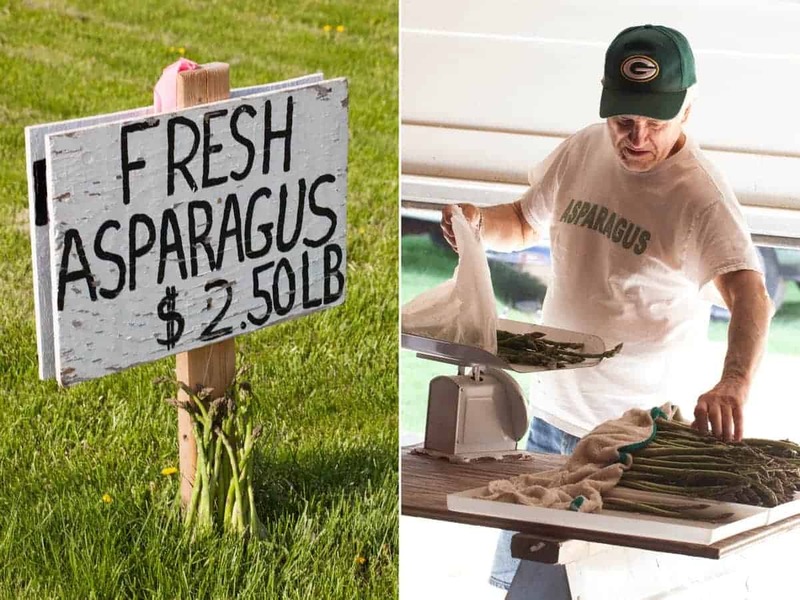 I know you can now get asparagus pretty much year round. And, it’s pretty good year round. However, like most fruits and vegetables, fresh is best, and local & fresh is king(or queen). That is the case with asparagus as well. If that were not the case, you wouldn’t have local farmers protecting their roadside land like guard dogs. 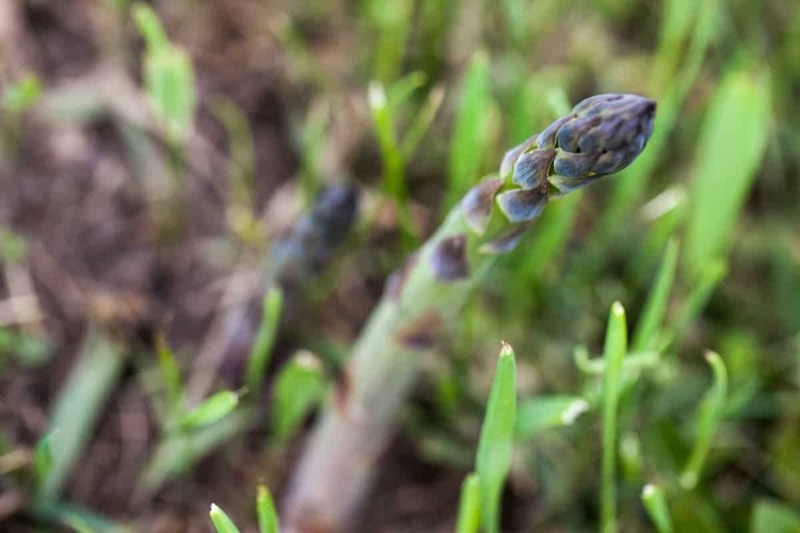 In most rural areas I know, if you have spots where wild asparagus is coming up in the spring, you keep your mouth shut and pray that you get to it before anybody else knows it’s there. It’s kind of like morel mushrooms, except instead of battling tree branches, prickly brush or crazed land owners, you can often pull over on the side of the road, cut your find and be back in the car before anyone knows you were there. What makes it tough is getting to it before the farmers, who always know where they are, and they get up reeeaaallly early. 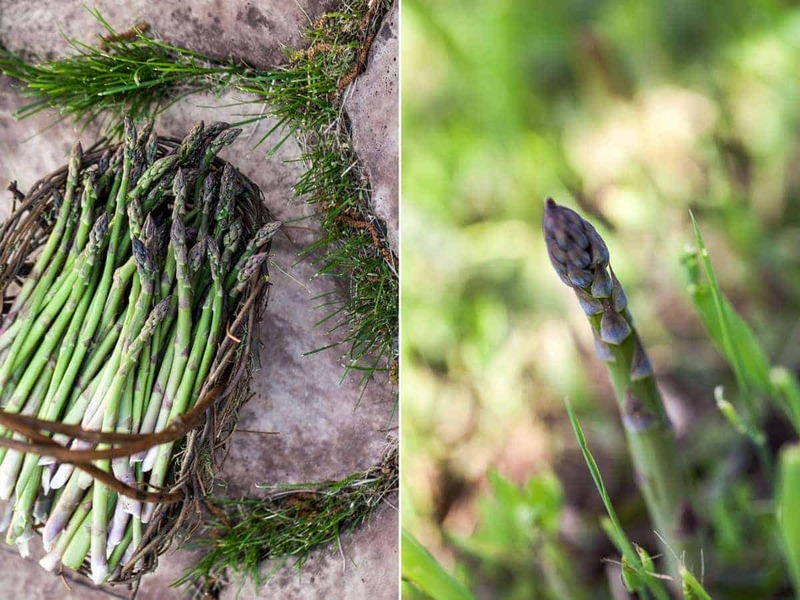 If you do find a patch, or are fortunate enough to know someone who sells wild asparagus, it is a treat. Everything that comes from the earth unspoiled by us is usually better. It may not be bigger, but it will taste better. Take for example the asparagus caprese salad that we made recently. 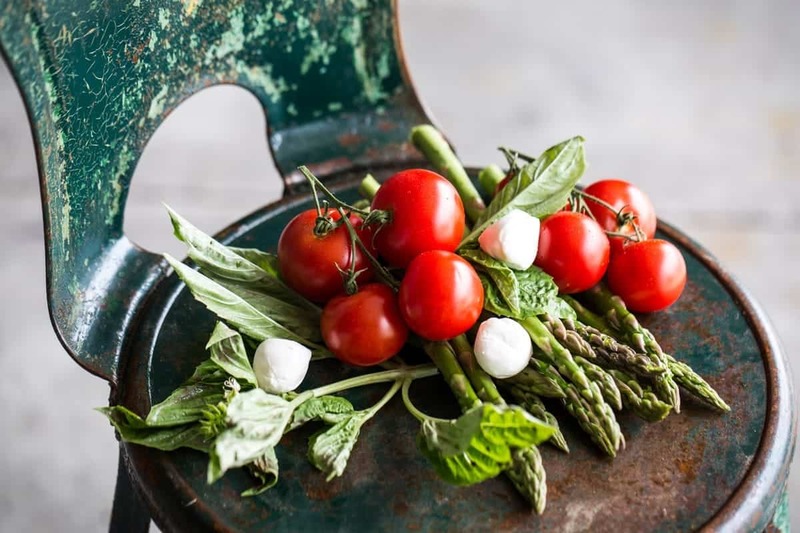 Fresh tomatoes, basil, fresh mozzarella and long curling strips of fresh asparagus drizzled with extra virgin olive oil and seasoned with some sea salt and fresh pepper. Yum. Also, like most vegetables, asparagus is really good raw and it’s pretty easy to peel with a vegetable peeler. I know, I know, asparagus may be in season, but tomatoes and basil are not. Not in Wisconsin anyway. Heck, those two won’t show up for awhile in my yard. 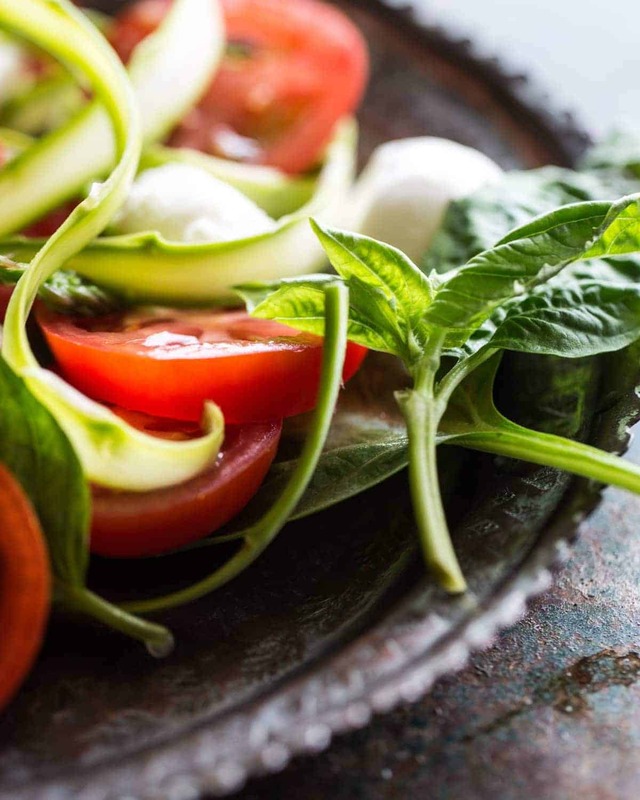 Thank goodness both can be readily found in the grocery stores these days, and unlike many vegetables, you can get pretty good vine ripened hot house tomatoes and fresh basil these days. They’ll never grow naturally together in the midwest, so sacrifices must be made. That may be the only sacrifice however, because the flavor is still wonderful. Give it a try. It’s beautiful, delicious and a creative new way to showcase this long vegetable that can get a little boring after a couple weeks of roasting it. Enjoy and remember to cook with love and live to cook. 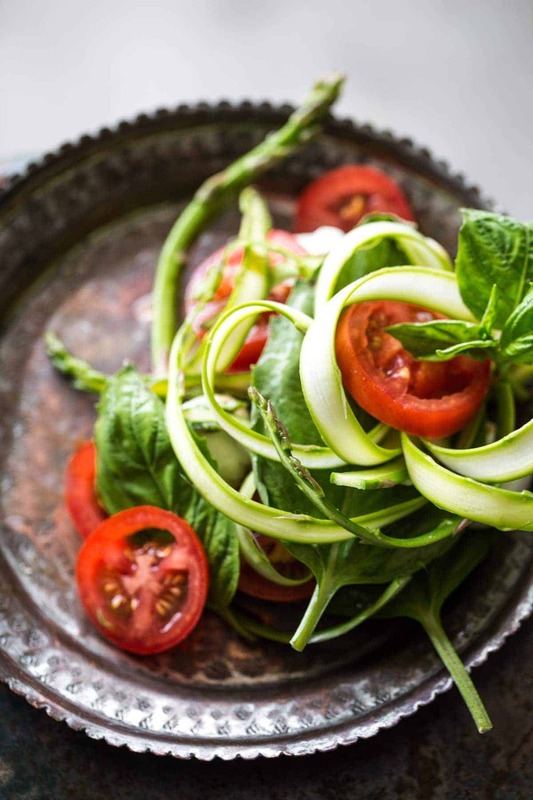 Fresh asparagus is rarely paired with the classic caprese salad. However, we gave it a whirl and found when the asparagus is peeled into ribbons, it adds a sophistication that is welcome and delicious. 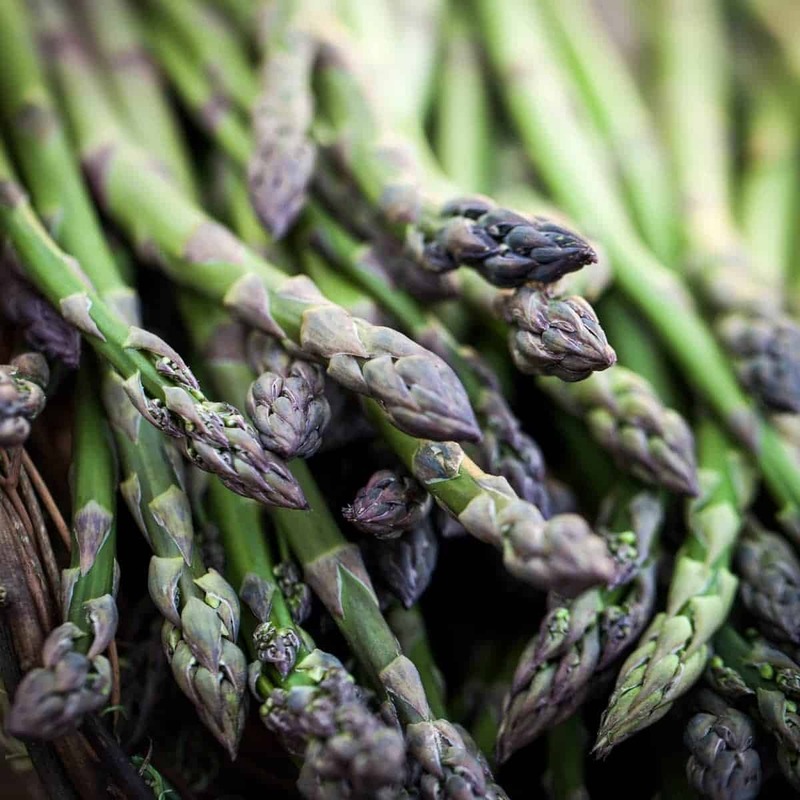 Layer asparagus and next 3 ingredients on a large plate or individual salad plates. Drizzle with olive oil, then season with salt and pepper. Serve. There is something truly special about planning your child’s 1st. birthday party. It’s a time when all those images you’ve thought about for years as a girl playing with dolls, having tea parties and playing house is now realized. When you can harness that energy into making your little boys 1st. birthday party something to remember. Maybe not for him. After all, they probably won’t remember any of it. But as a mother, it doesn’t matter. Creating special moments in time and making your kids happy at that moment is what is important. Letting them know how special they are and how much you love them. I know, I know, it was a year ago and Austin is now two! But reflecting back on that day still puts a smile on my face. Not everything went as planned. However, it was still a special day. Now that he is already two, I reflect back on that day and the wonderful smash cake I made for him. His cake was so good last year I may just do it again! Buried the lead here… You can see all of the darling images, games, and crafts from Austin’s first birthday party on Martha Stewart! If you’re wondering how I made this cake, it was really pretty easy. Jim and I did an article in 2015 called “Wildberry Poundcake with Mascarpone Yogurt Creme”. You can read the article here. That cake was a buttery pound cake colored with three different colors of batter and made in tin cans. It was so good, that I thought it would be a great base for Austin’s cake. After all, the “natural” cake mixes you can get in the store nowadays are really similar to that cake as far as ingredients go, so why not really know what’s in the cake and make it myself? Instead of making it 3 colors, I decided on just one color, blue. I used 6″ cake pans instead of the tin cans, because I wanted to give Austin a special surprise when he dove head first into the middle of it. Blue pound cake may not be “healthy”, but an all natural cake filled with fresh berries is definitely an improvement from a boxed mix and canned frosting. Adding fresh blueberries to the cake mix also added some nutrition as well as give great color to the cake. So how did I get the fruit in the middle? 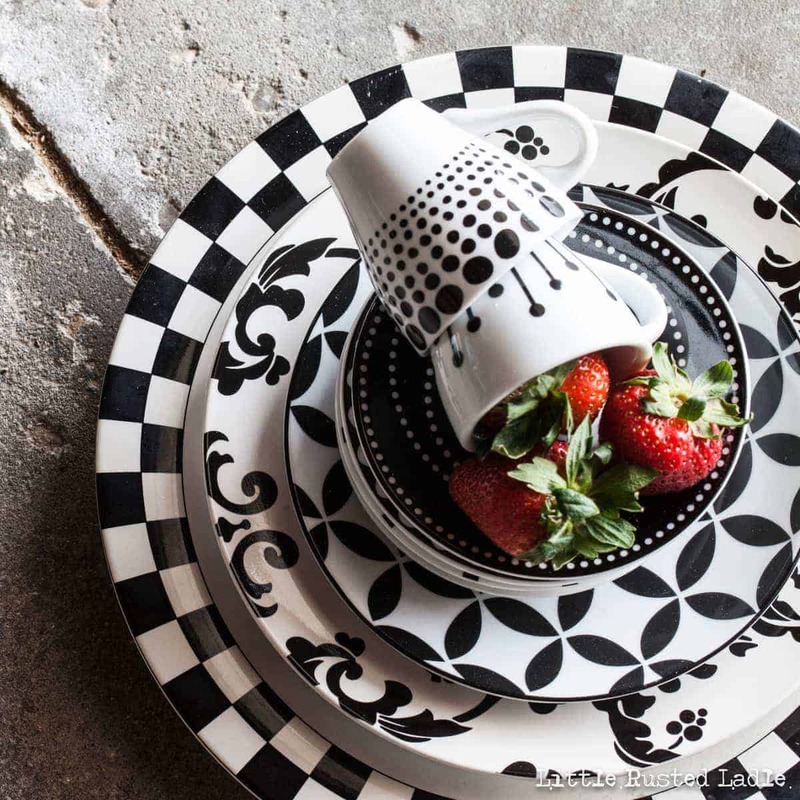 Thanks to the creative genius of Amanda Rettke, a friend of ours and fellow food blogger, it was really easy. 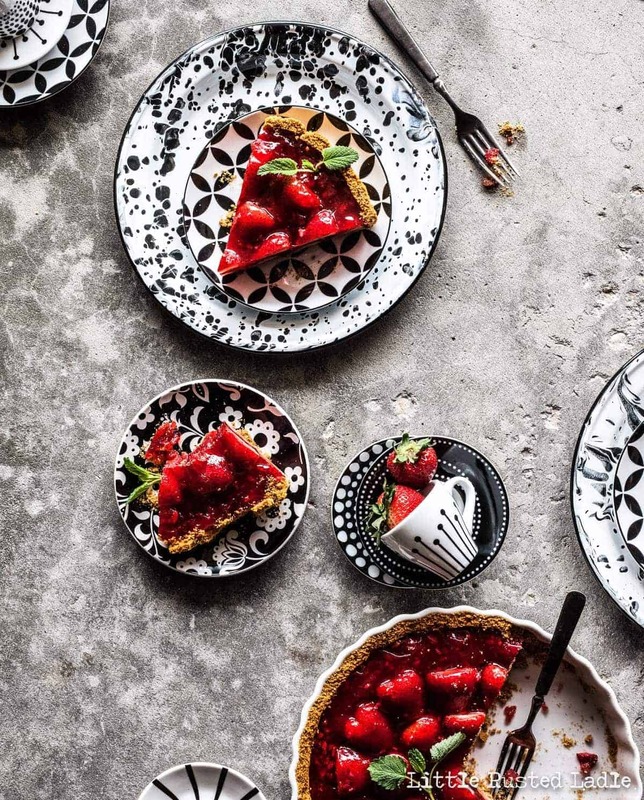 If you like cake, her blog “I Am Baker” is for you. To get the cavity in the center of the cake, all you need to do is cut a circle out of the two layers of cake when you cut them into layers. I used the top of one of Austin’s sippy cups for the template. Why not, it was the perfect size and it was right there with the the half a dozen other soppy cups and kids spoons that I see every day. 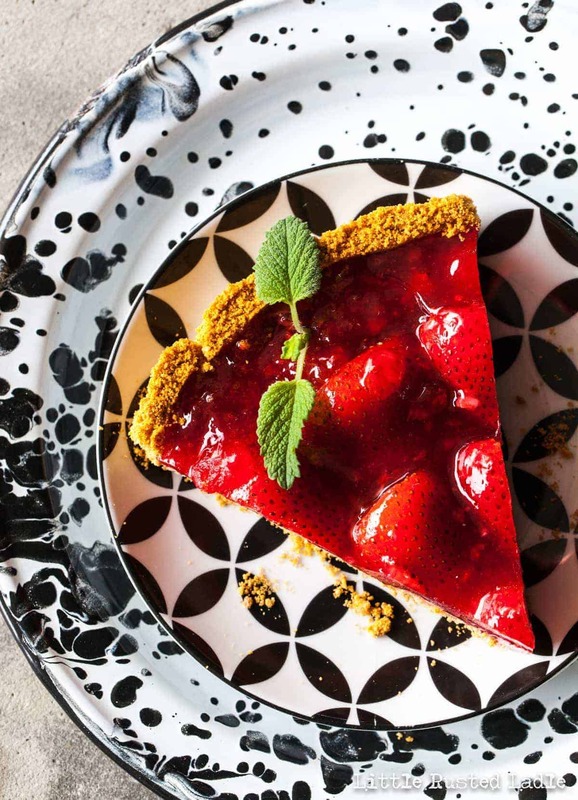 Simply place a round object about an inch or two smaller than your cake in the center of your two middle layers and cut around it with small, thin knife. Remove the center and safe it for later when everyone goes to bed and you need some me time with a bowl of ice-cream. Trust me, you’ll thank me later. 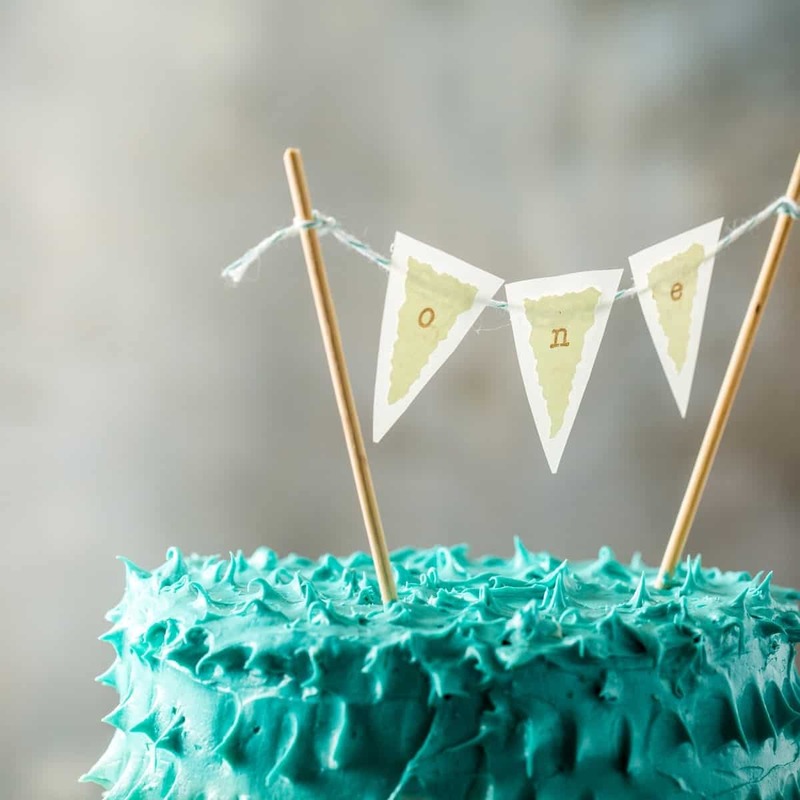 To assemble the cake, place one layer of cake on a serving plate, top with a layer of frosting, then place a layer of cake with a hole cut out over on top. Top that layer with frosting, then add the other layer of cake with the hole in it. Frost that layer, then add fresh fruit into the cavity. Top with the remaining whole layer and frost the entire cake. I used a sugar free frosting recipe I found online at An American Housewife Barbie. It uses Xylitol, which is a plant based sweetener, instead of sugar that was used in the original recipe, because I wanted a healthier option that would hold up better on the sides. To give the frosting that multi-colored look, I made three different shades of frosting, then frosted the cake from bottom to top starting with the lightest color. The colors blend when you run a spatula around the whole cake when you are done. 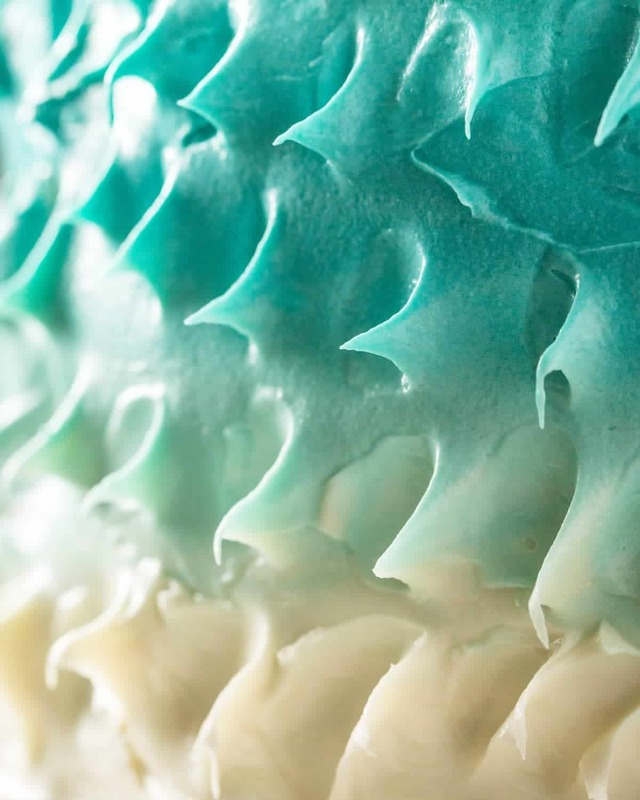 A simple pressing a spoon into the frosting to create little peaks gave it texture. Of course, a 1st. birthday wouldn’t be complete without a 1st. birthday cake topper? In the end, Austin got to dive into a delicious, homemade cake that was filled with fresh fruit and the love that went into making it. I can’t believe it was a year ago. I guess it’s time for another cake. Enjoy. When your baby turns 1, everyone anticipates the moment when they shove handfuls of cake into their mouth for the first time. This smash cake is all natural, buttery good and filled with lots fresh berries to offset the sweet cake. The frosting is sugar free too! 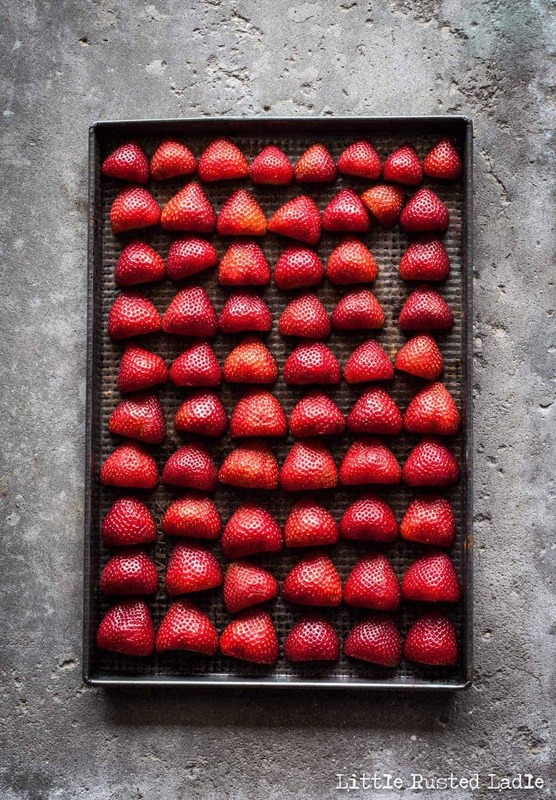 ½ cup fresh strawberries, stems removed, quartered. Preheat oven to 350 degrees. Line two 6" cake pans with parchment paper cut to fit on the bottom. Spray generously with non-stick spray. Dust with flour and set aside. In a large mixing bowl, combine butter, sugar, salt, vanilla, and baking powder. Beat together until light and fluffy. Add flour and beat until it resembles a thick paste. Add eggs one at a time, scraping down bowl until very light and fluffy. Color batter with food coloring to desired color. Transfer cake batter evenly into pans. Place pans on a baking sheet and transfer to pre-heated oven. Bake for 30-35 minutes or until a toothpick inserted into the center comes out clean. Transfer cans to a cooling rack and let cool completely. While cake is baking, make the frosting. In a saucepan, place the water and Xylitol. Heat over medium high until it comes to 240 degrees. With normal sugar this would be soft ball stage but because Xylitol and Splenda do not thicken, you cannot test this by traditional soft ball stage. As you are heating the sugar substitute and water, mix the egg whites in a large mixing bowl. Beat the egg whites until soft peaks form. With the mixer running, pour the hot Xylitol mixture down the side of the bowl in a thin stream, mixing into the egg whites. Beat approximately 7-10 minutes on high until the egg whites resemble a thick and glossy meringue. Start to add the butter in chunks, about a tablespoon at a time. Keep the mixer running and whip the mixture about 7- 10 minutes more. If the mixture breaks up when you first add the butter and it looks like cottage cheese, no worries. Just keep whipping until it's smooth again. Once the frosting is smooth, add your vanilla and whip again for a few minutes. If it's a really warm or humid day it might get too warm to work with. Just refrigerate it for about 7 minutes, whip again. The cooler temperatures will cause it to harden up again. Transfer half of the frosting to 1 bowl and then divide the remaining frosting into the other two bowls. Leave one bowl white, then tint the bowl with half the frosting the shade of color you want the top and layers to be. Tint the last bowl a shade in between the white and the darker shade. Set frosting aside while preparing cakes. Cut the tops of the cakes off to create flat cakes. 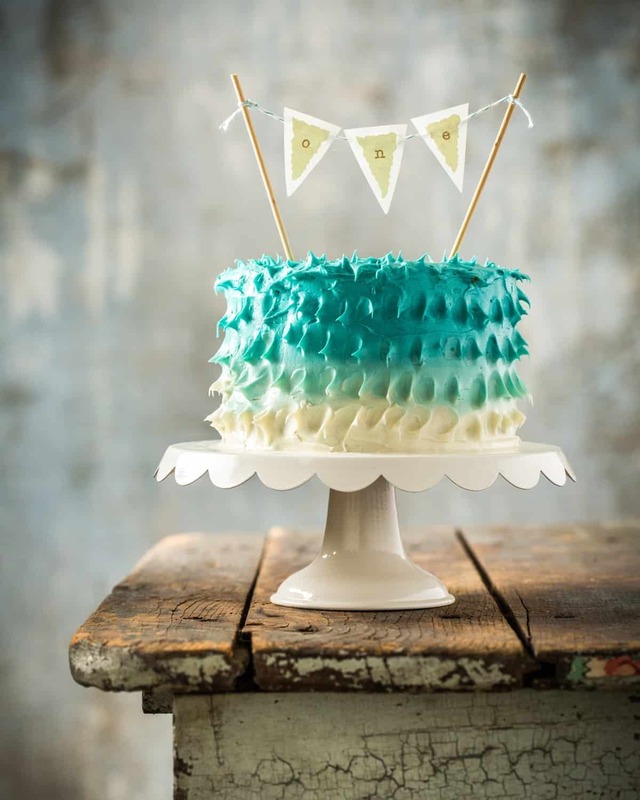 Cut cakes in half horizontally using a long serrated knife. You should have 4 cake layers. Set the bottom two layers aside to use for the top and bottom. Using a 3"- 4"round lid(or sippy cup lid), cut a round out of the center of the two remaining cake layers using a thin knife. Place one of the bottom layers bottom side down on a serving plate. Frost top with a thin layer of the darkest frosting. Carefully place one layer with a hole in it on top of the first layer. Frost top with the same frosting. Place second cake layer with the hole in it on top. Frost with the same frosting. Fill cavity with raspberries and strawberries. Place remaining bottom layer cut side down on top of fruit filled cake. Starting with the reserved white frosting, using an offset spatula, spread a 1-2" wide band around cake, being careful not to frost anything else except the bottom. Next, using the reserved medium shade frosting, repeat frosting process with the middle section of cake. Finish the top section and top with the remaining darkest frosting. Run the spatula around side one more time to blend colors. Smooth top. Using a small spoon, create small peaks by pressing the back of the spoon into the frosting , then pulling it straight out. Repeat that around the entire cake and on top. Chill cake until ready to serve. To serve, place in front of your child and enjoy the fun. 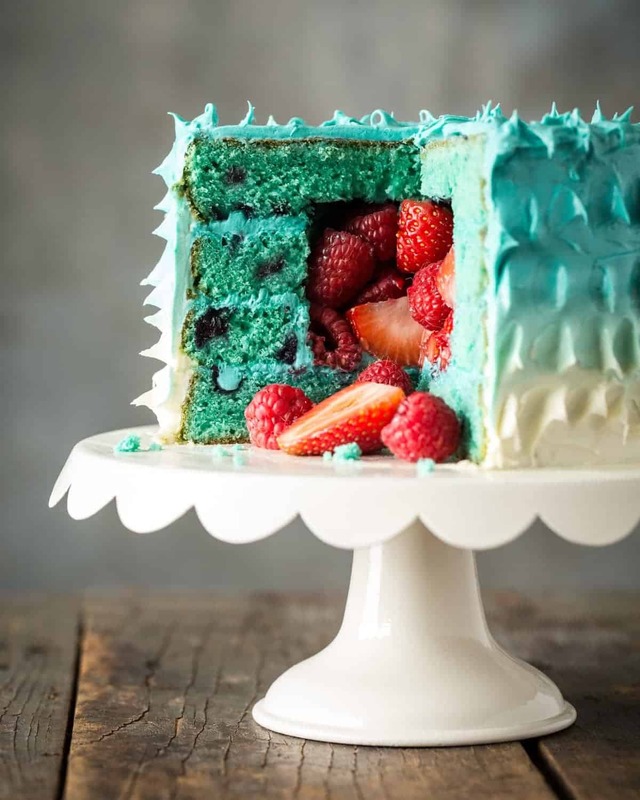 This cake was colored blue and filled with fresh berries. Feel free to make the cake without coloring and filling it with apples, bananas, melon grapes or any other fruit your child may enjoy. The beet has a reputation not unlike politicians. You either love them or you hate them. They are a gorgeous vegetable with a very unique flavor that some would describe as earthy, while others would say they taste more like dirt. 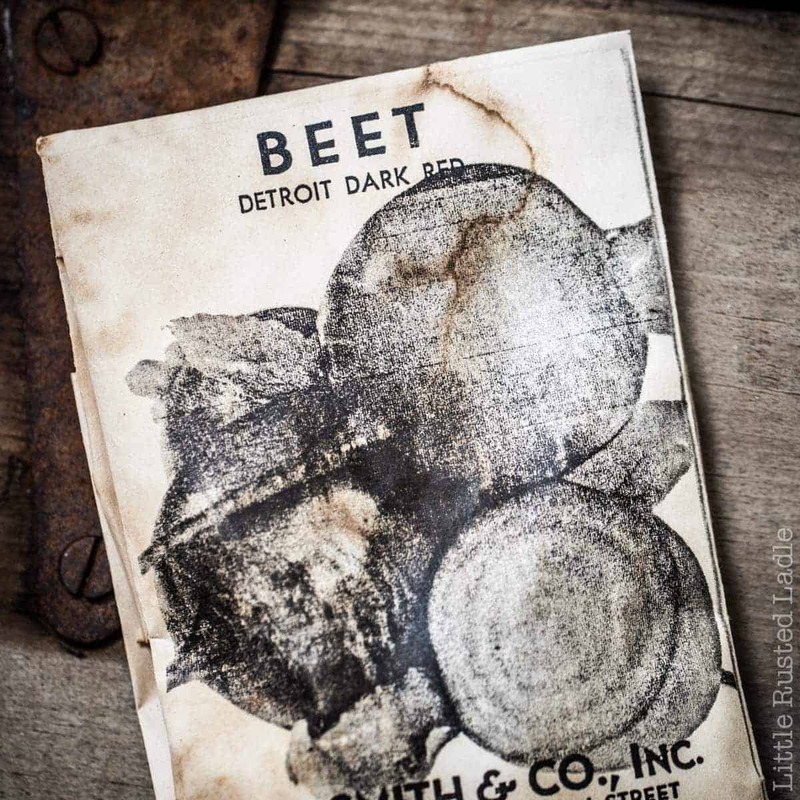 Well, regardless of which side of the beet your on, beets need to stop taking a beating from beet haters and start getting some well deserved credit. Beets are extremely good for you. They are loaded with phytonutrients which give them their deep purple color. 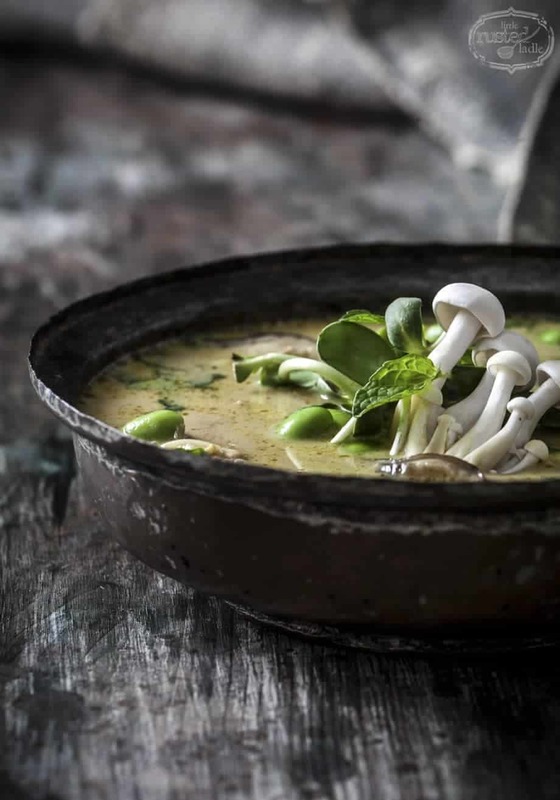 These nutrients are known to help fight cancer by slowing the growth of tumors. 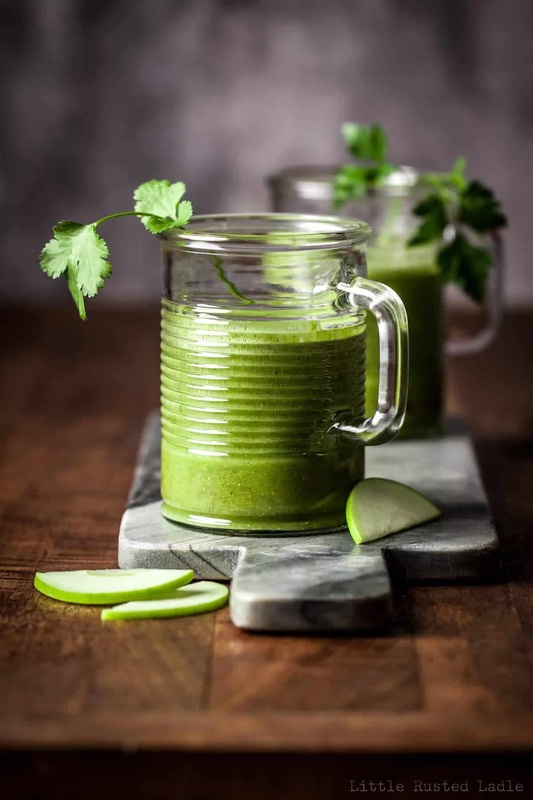 They are also known to have exceptional detoxifying benefits and are helpful at reducing inflammation, which these days it seems everyone is trying to accomplish. But wait, there’s more. Beets are also good for boosting mental health, helping with digestion and lowering blood pressure. They are loaded with vitamins and minerals including iron and potassium. Back when I was a kid, you couldn’t get me to choke down a beet. Then, as I grew older and started actually TRYING new foods, I realized that beets weren’t so bad after all. They are great in salads with goat cheese and nuts, and there are very few vegetables that can match their beauty. Red beets, yellow beets, or my favorite chioggia beets, which are white, with red circles going through them, are all beautiful and each has a different flavor. Jena and I thought they would all taste good together in a recipe, so we decided to try a tart version of a beet and goat cheese salad. 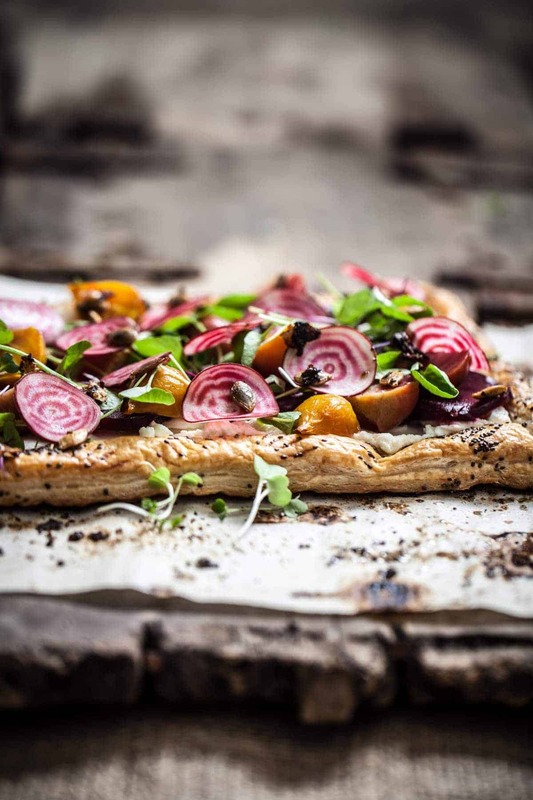 This tart is loaded with flavor and beets galore, so if you don’t like beets, this is not the recipe to try to learn to accept them. It actually has 4 kinds of beets. Cooked roasted red beets, roasted yellow beets, roasted pink beets and raw slices of chioggia beets. 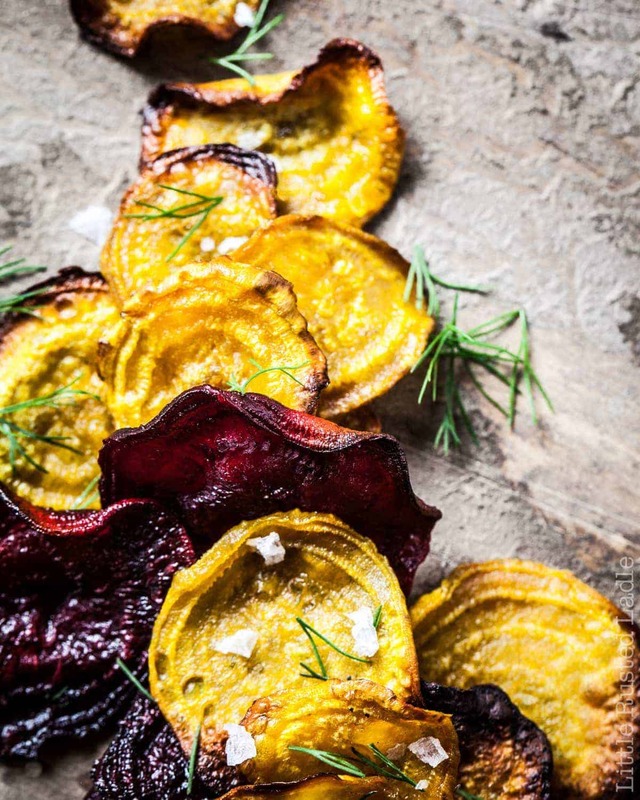 We added these beets to a puff pastry shell topped with a goat cheese spread made with fresh dill. Peppery watercress, micro greens and toasted pumpkin seeds are sprinkled on top making this the most stunning tart we’ve ever seen. The bonus is that it tasted so good, we decided to put it in our cookbook Herbs For Flavor, Health and Natural Beauty. If you don’t like beets, don’t make the recipe, but don’t forget to buy our book. 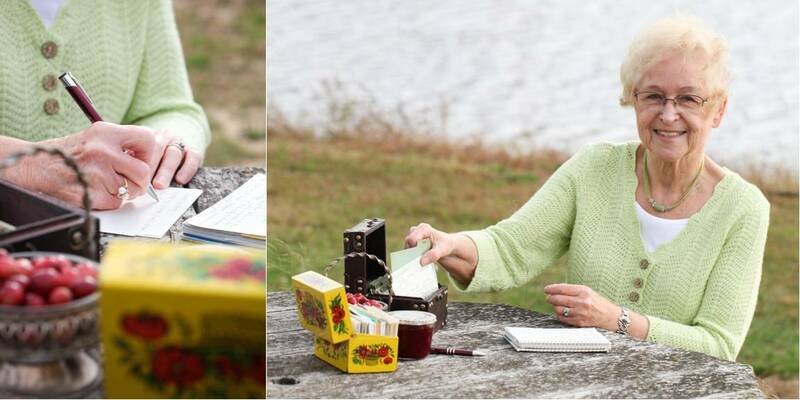 It makes the perfect Mother’s Day gift. Especially if mom likes beets! You can buy it on Amazon or Barnes and Noble online, or through Jim’s website Rude On Food. Enjoy and remember to cook with love and live to cook. 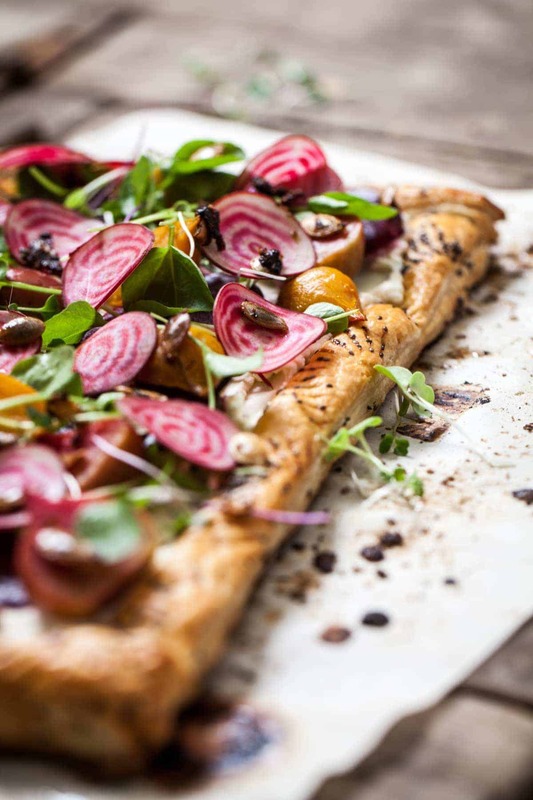 Beets are the hero in this beautiful tart, but the fresh flavors of goat cheese, watercress and pumpkin seeds add layers of flavor, while the buttery puff pastry gives it that rich flakiness that makes this a crowd favorite. 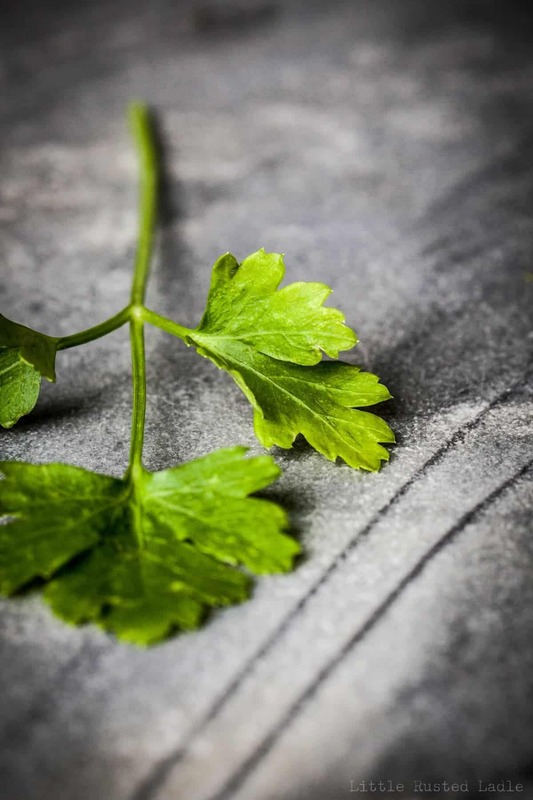 You can find the recipe in our cookbook Herbs for Flavor, Health and Natural Beauty. For Tart Shell Pre-heat oven to 425 degrees. Unfold puff pastry onto a parchment lined baking sheet. Cut ½” wide strips from all 4 sides of puff pastry and set aside. Brush remaining sheet of dough with egg white. 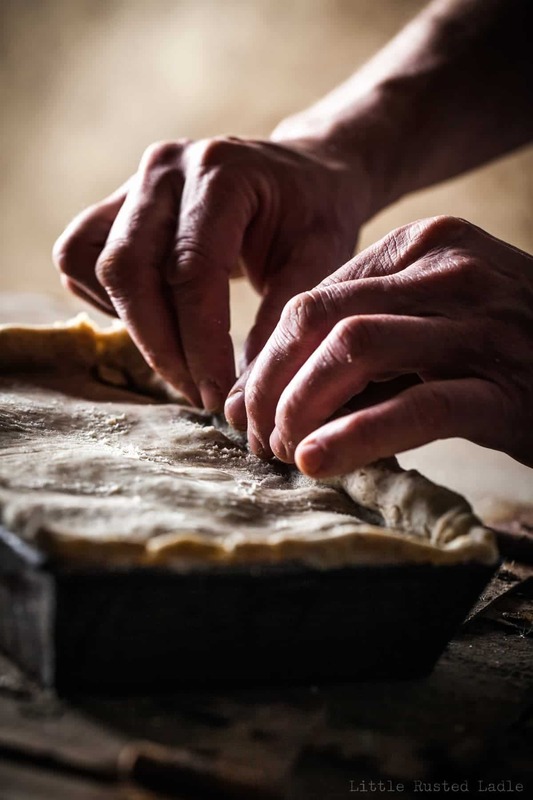 Place reserved strips of puff pastry along edges on top of pastry sheet, creating a border. Press to seal. Brush edges of pastry with egg white. Using a fork, poke center area of puff pastry all over to prevent pastry from rising too much. Sprinkle sesame seeds along edges. Bake for 20-25 minutes or until golden brown. Remove from oven and let cool completely. For Cheese Spread In a medium size bowl, combine goat cheese and cream cheese. Season to taste with salt and pepper. To Assemble Tart, Spread mixture over cooled puff pastry. Sprinkle dill over cheese mixture. 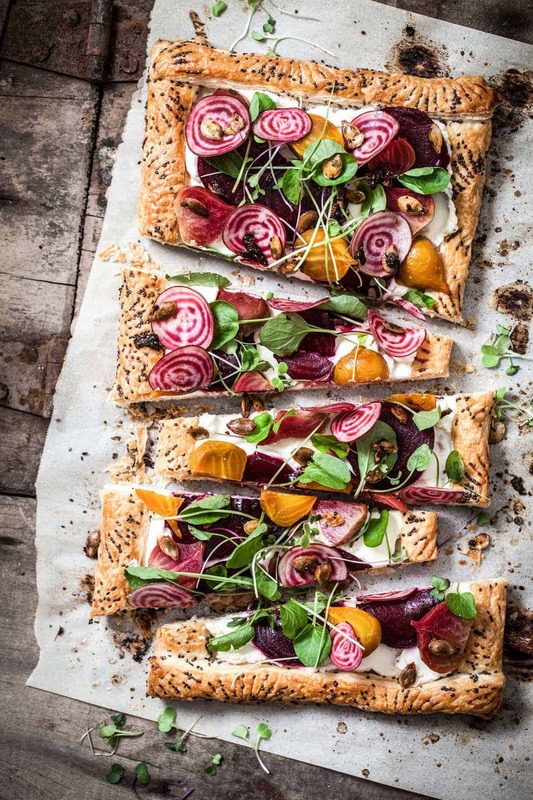 Place beet slices, watercress and micro greens evenly over cheese. Sprinkle with pumpkin seeds if desired. Cut into squares and serve. 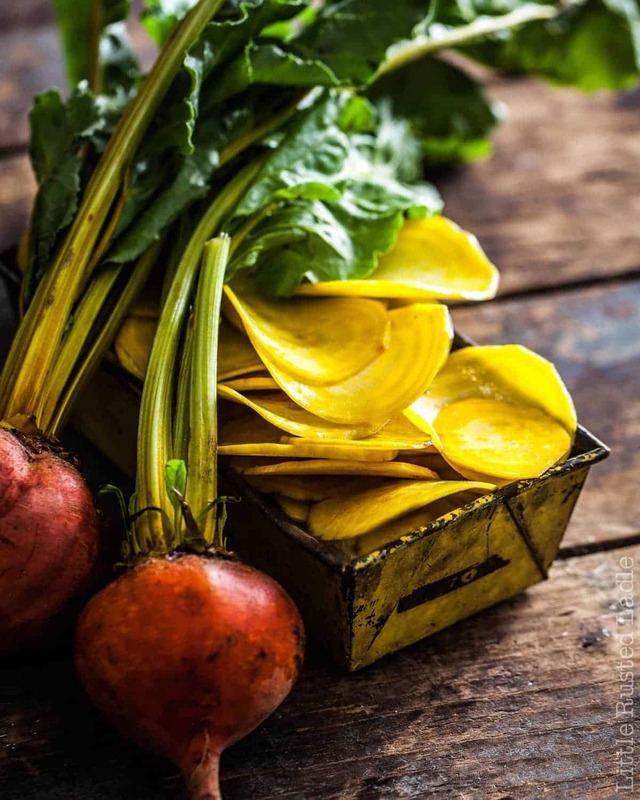 If yellow, pink or chioggia beets are not available, you can use red beets. Cheese is as much a part of a Wisconsinites everyday routine as any food available. When it is in melted form, it only increases its desirability. Batter or bread it and deep fry it, and you have what almost every restaurant and bar in the state would be crazy not to have on the menu. 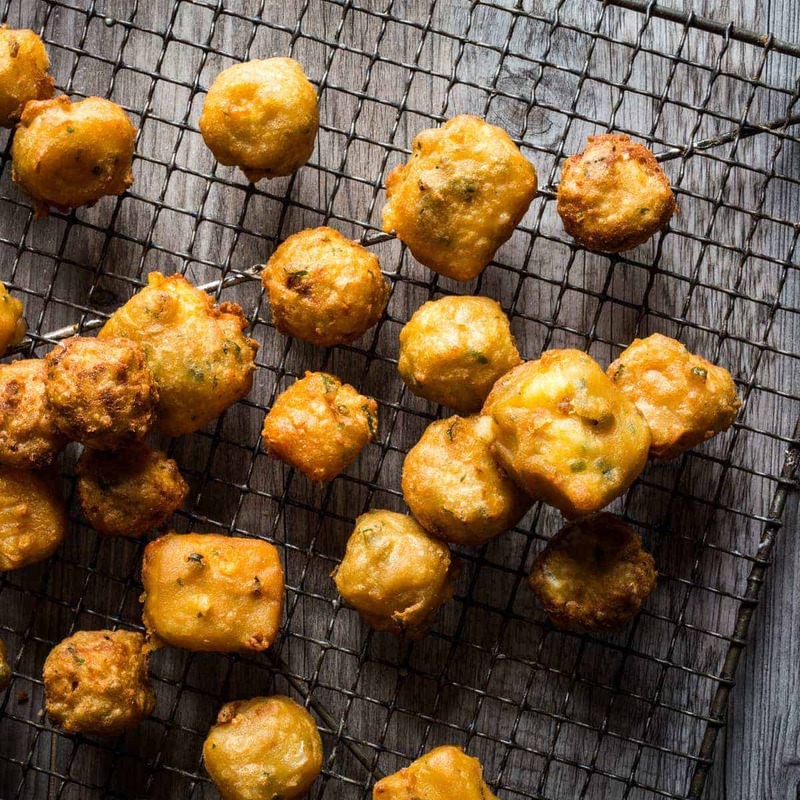 Fried cheese curds are salty, gooey, savory, crunchy, and extremely delicious. 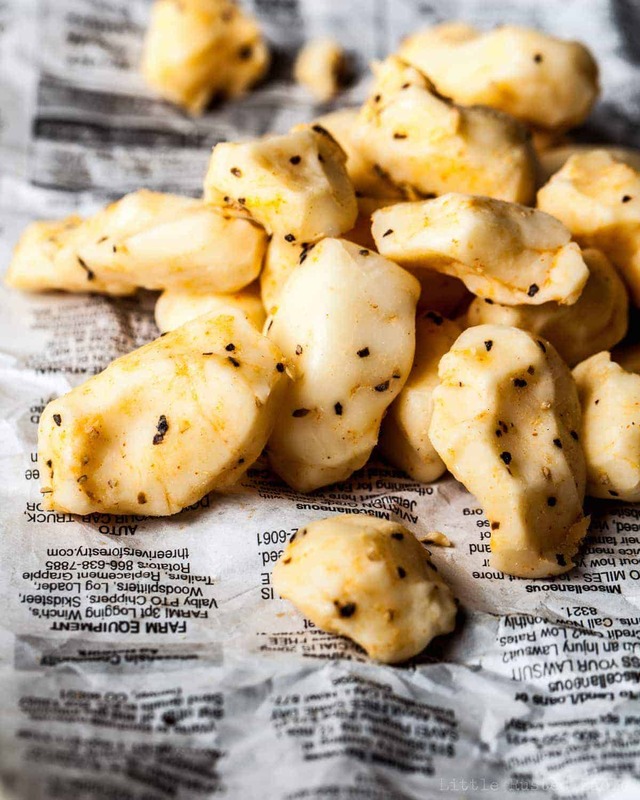 Cheese curds are indeed gooey pillows of yumminess. However, it occurred to me that other than curds and of course mozzarella sticks, there aren’t many other flavors of fried cheese available. Yet there are hundreds of delicious Wisconsin cheeses even tastier than the simple curd. Why not cut some of these many delectable cheeses into cubes and batter them as well? That is the purpose of this article. When trying to decide what cheeses to use, a few important things are needed. If you are going to batter cheese, it must be able to be battered or breaded. It can’t be too soft and it can’t be too hard. If it’s too soft, it can’t be coated. If it’s too hard or aged too long, it won’t melt very well. Flavor is also important. If you fry a cheese with too strong a flavor, it is less than pleasant to eat, especially in any quantity. So, a semi-soft or firm, meltable cheese with good flavor is what is needed. The cheeses chosen for this grand experiment were very different. One of my favorite wisconsin cheeses is a fenugreek gouda. It’s sweet, salty and very meltable. Blue cheese is very soft and very strong in flavor, which would normally rule it out as an option. However, when combined with cream cheese, it’s flavor is just right. Form the mixture into small balls with scoops, then freeze them and they are able to be battered as well. Horseradish and chive havarti is very creamy and full of horseradish that cleans the sinuses. Ghost peppers are very popular right now. When they are added to cheese, it makes the cheese much hotter than any other cheese. Call it torturous, but it sounded like a tasty option. The last cheese chosen was a smokey cheddar swiss combo. It’s combination of flavors seemed perfect choice for frying. What about the batter? 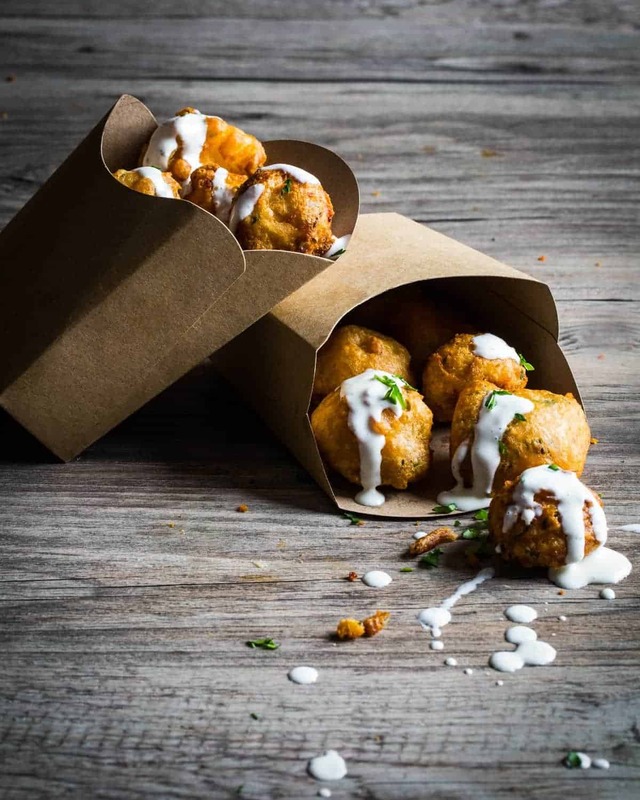 A standard beer batter would normally be the choice, but a lighter batter is a better choice so the cheese doesn’t get dominated by a thick coating. A tempura style batter gives a crunchy but light flavor. Instead of all-purpose flour, rice flour was used. 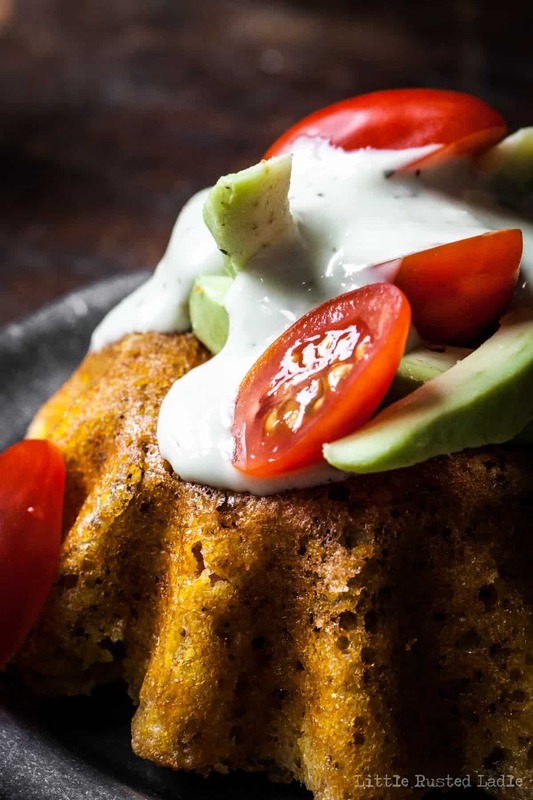 It eliminates the gluten as well as making for a tasty alternative. The recipe is very similar to the fried sage bundles that are in our new cookbook called Herbs For Flavor, Health and Natural Beauty. It’s available for pre-order on Amazon here. Instead of ice water, I did use beer, but a light one. Any pilsner or ale will do. To add extra flavor, fresh herbs were added to the batter. Parsley, chives and thyme was used, but feel free to use whatever herbs you prefer. The last detail was coating the cheese with plain rice flour and freezing the cubes so when they are fried, the cheese doesn’t melt too quickly. All that’s left is to batter the cheese, fry it and eat it up. 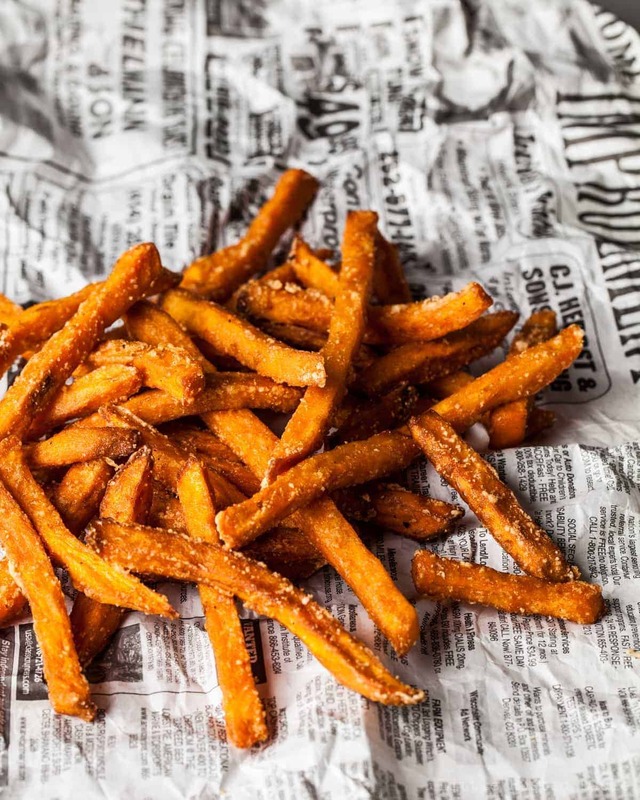 Be sure to use a good electric fryer and do your frying outside. Otherwise, your house will smell like a fried food stand, which may be fine now, but won’t be as pleasant when the feast is over. All the varieties of cheese were great. I mean come on, bad melty cheese, Really? The only negative was that the ghost pepper cheese was hard to pick out of the pile, so if you picked the wrong piece, you were greeted with a blast of molten fire. Kind of a russian roulette kind of choice. 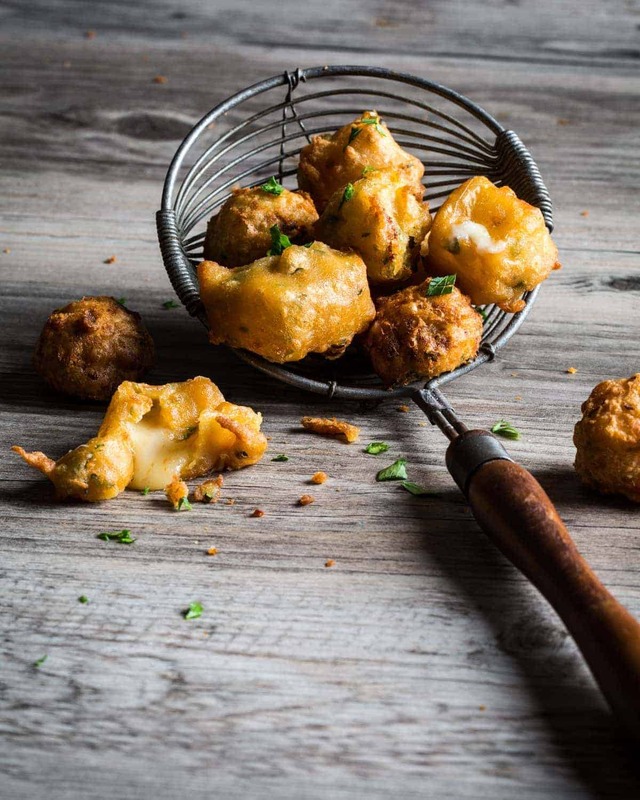 So tomorrow, when you’re trying to decide what to make for the big game, maybe some fried cheese is a good way to start the show. Pick any cheese you like. If it doesn’t work, you can always eat it cold. Either way, you’ll be eating cheese. Preferably from the dairy state. The recipe will be posted tomorrow. Until then, cook with love and live to cook. Pillows of gooey cheese, enrobed in a crunchy batter. Pre-heat 1 gallon of vegetable oil in a large electric fryer and pre-heat to 375 degrees. Combine 2 cups of the rice flour and the next 5 ingredients in a medium bowl until smooth. In a small bowl, combine the cream cheese and blue cheese. Scoop the mixture into 1" balls with a small scoop and transfer the balls to a foil lined sheet pan. Freeze for 2 hours or until firm. Transfer remaining ½ cup flour into a resealable plastic bag. Add frozen blue cheese balls. Roll around balls until well coated. Set aside. Add remaining cheese cubes to the bag. toss in the bag until cubes are well coated. Set aside. Transfer 4-5 pieces of the reserved cheese balls and cubes into the batter. Stir them around to coat them completely. Using a wooden toothpick, transfer cubes one at a time into the hot oil. Fry for 2-3 minutes or until golden brown and cheese starts to melt out. Transfer to a plate lined with paper towels to drain. Serve with a side of ranch dressing. 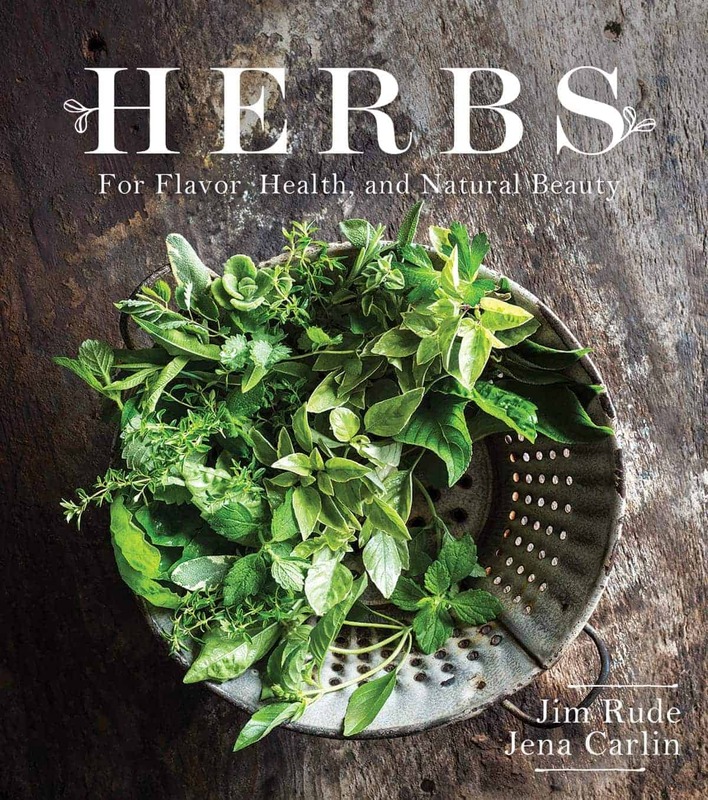 In a little more than a month, LRL’s new cookbook titled Herbs for Flavor, Health and Natural Beauty will be hitting the shelves of bookstores near you and websites like Amazon and Barnes & Noble. We are really excited about it, because it will be our debut as co-authors. The entire book was written, developed, styled and photographed by Jena and I, and we did it in less than 4 months. Now don’t get me wrong, this wasn’t by choice. It had everything to do with spring and our desire to have it available for the coming herb season. After all, we’re going to be ready for the new growing season and all the fresh herbs that will go with it. 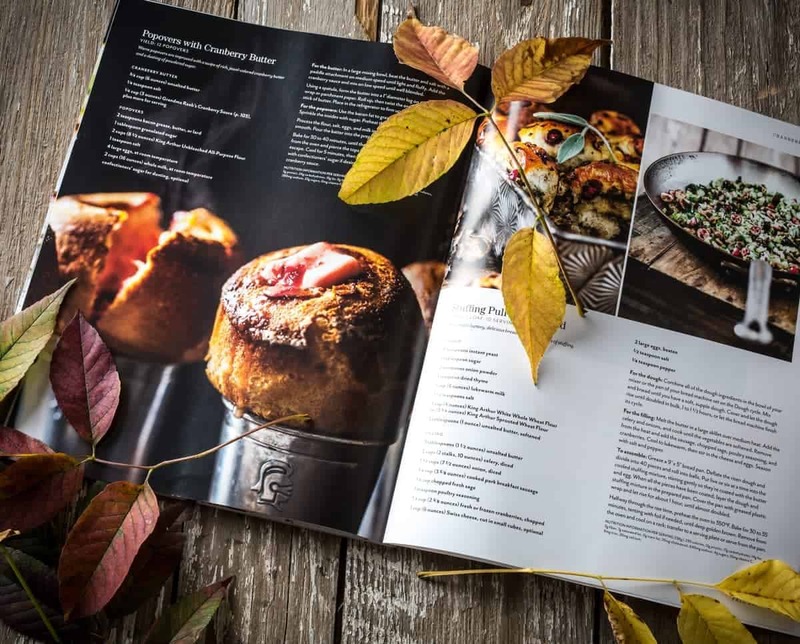 Why not enjoy some beautiful, delicious herb recipes while you’re waiting for those wonders of nature to start popping? 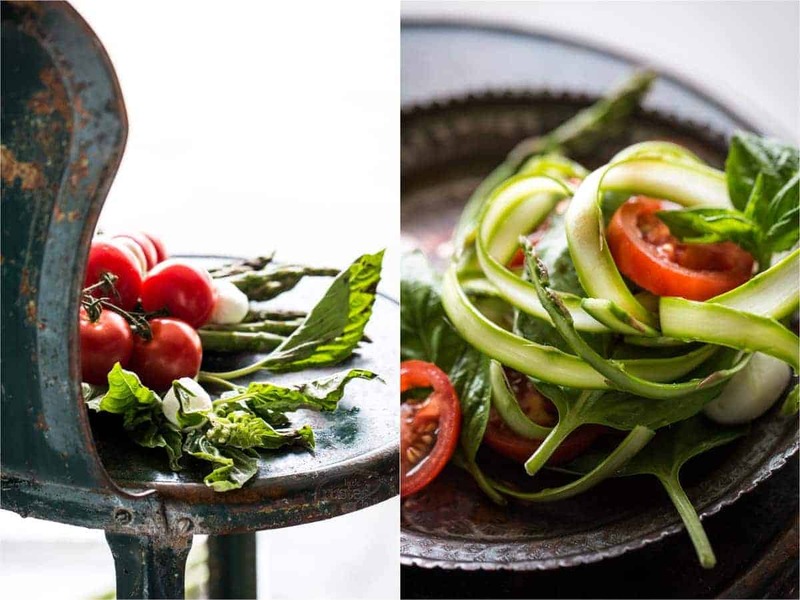 To get your mouth a watering, Jena and I decided it was a good idea to give everyone a sample recipe and a few photos to go with it to show why we are so excited about our debut book. Since it’s still January and there are still a good two months left here in Wisconsin before we will have temperatures warm enough to start thinking spring, and another two months after that before those delicate herbs will be able to be safely planted, why not tempt you with one of my favorite recipes from the book. 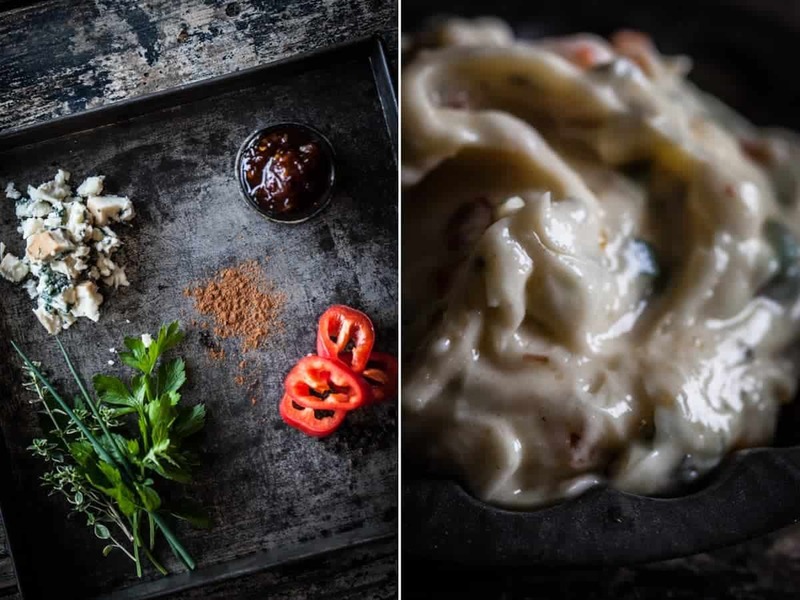 Rosemary Mac & Cheese. This outstanding version of the classic mac and cheese recipe, uses rosemary in more than one form. 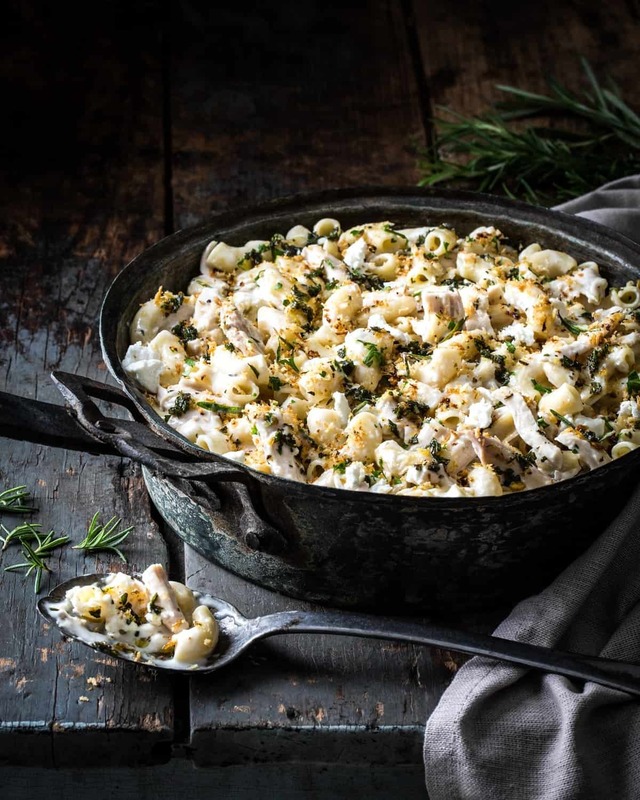 First we cook large macaroni noodles and make the sauce right in the pan using chicken broth, gobs of goat cheese and of course rosemary. Then, we fold in some juicy rotisserie chicken and top it all off with an incredibly flavorful rosemary panko crumb topping. 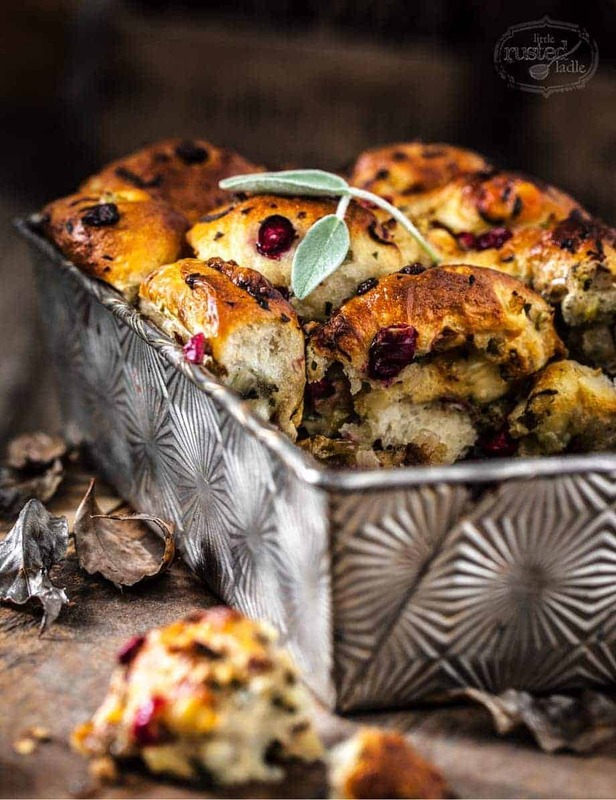 It’s loaded with rosemary flavor and really easy to make. What better way to get through the cold and snowy days of winter than with a cheesy, gooey bowl of homemade mac and cheese? We will be taking advance orders for our book very soon, so be sure to keep an eye out for the notice. There is a limited run of books, so make sure you get your copy early. 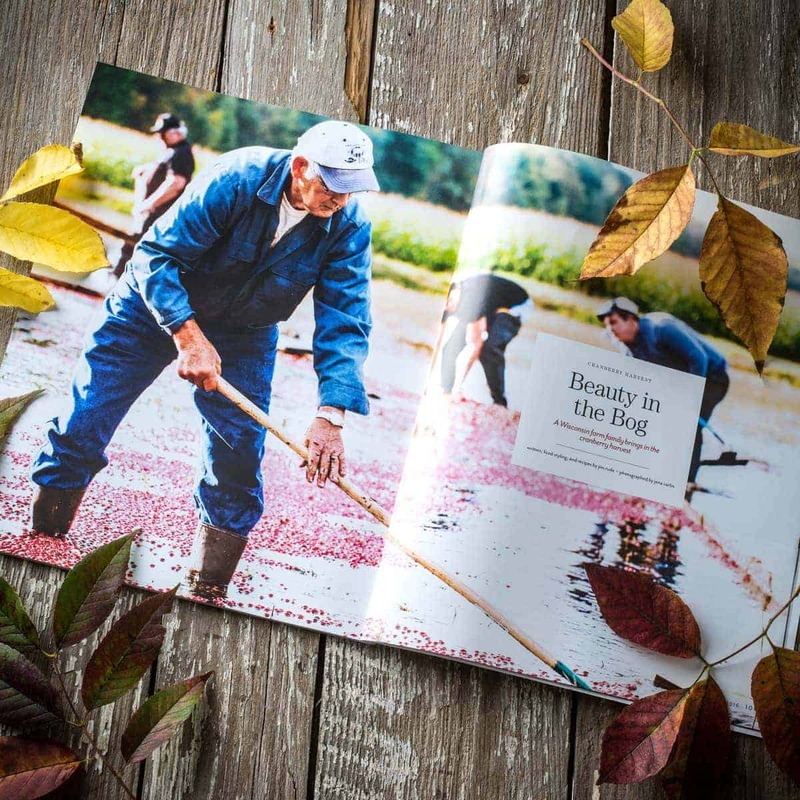 The book contains over 225 full color pages. 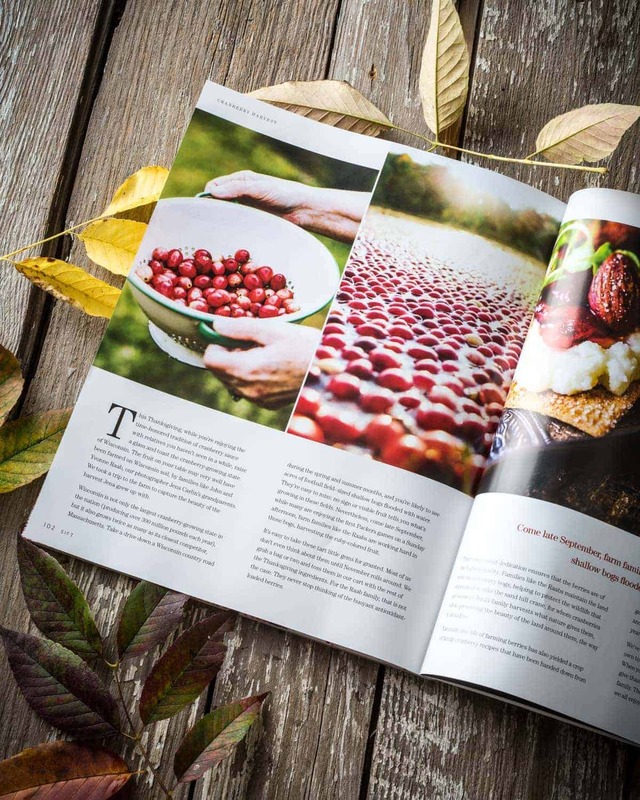 Each recipe and herbal beauty project is displayed with Jena’s beautiful photography. 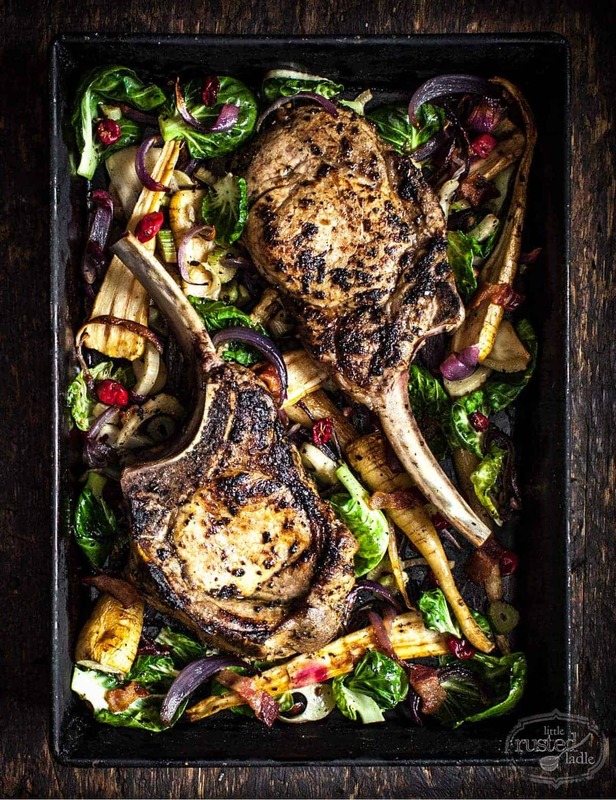 We hope you enjoy this teaser recipe while you wait for the book to arrive. Don’t forget to cook with love and live to cook. 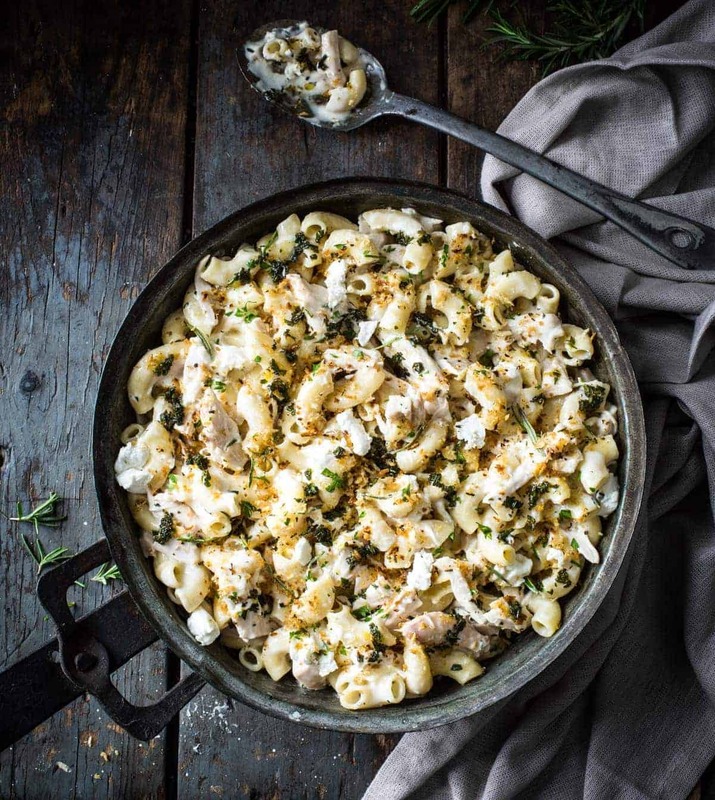 This grown up version of the classic Mac & Cheese is loaded with the fresh flavors of rosemary, goat cheese, and rotisserie chicken. For Rosemary Oil Combine ¼ cup of rosemary and olive oil in a blender and blend on high for 1 minute or until rosemary is finely ground. Strain oil into a bowl with a fine strainer. Set oil aside while you make the pasta. For Pasta Pour chicken stock, water and cream into a large dutch oven or saucepan. Bring to a boil over high heat. Reduce heat to medium, then add macaroni. Stir with a rubber spatula to prevent pasta from sticking. Cook for 8-10 minutes, stirring mixture occasionally until pasta is al dente and liquid has thickened. Fold in chicken, goat cheese and remaining rosemary. Cook 2-3 minutes longer or until goat cheese has melted into sauce. Season to taste with salt and pepper. Turn off heat and let rest for 2-3 minutes. For Crumb Topping In a small skillet over medium heat, toast panko crumbs with 2 tsp. of reserved rosemary oil for 2-3 minutes or until crumbs are golden brown, stirring often. Remove from heat and let cool while you dish up mac and cheese. To Serve Spoon macaroni mixture into shallow bowls or large mugs. Spoon 1-2 tsp. of reserved rosemary oil over macaroni. Top with toasted rosemary crumbs. Serve. 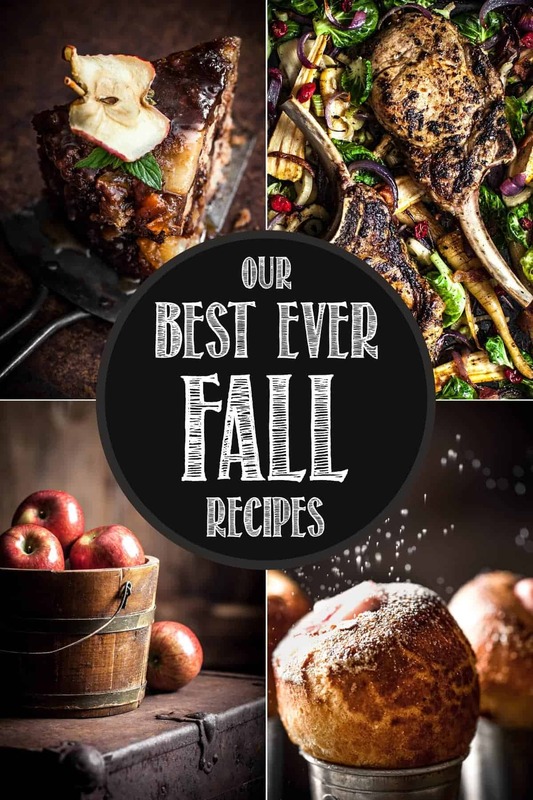 Our Best Ever Fall Recipes! The flavors of fall sing like the most talented choir. 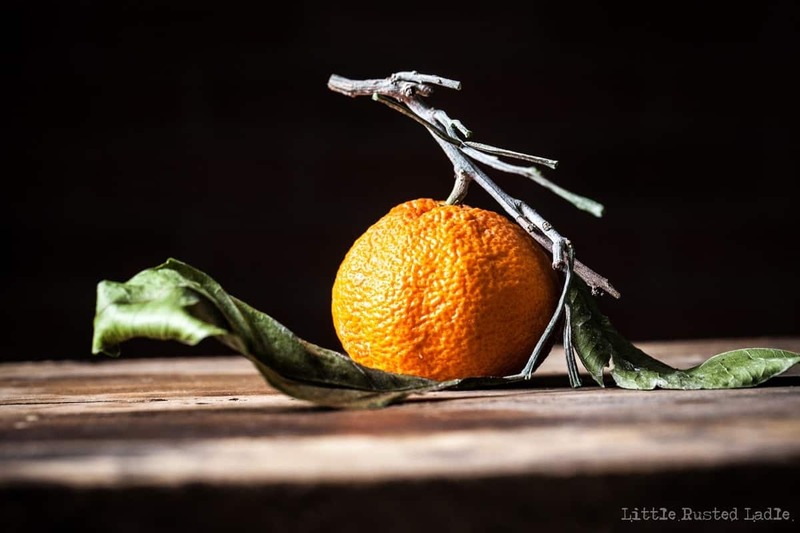 Nothing beats the anticipation of knowing that very soon we will be delving into all the incredible ingredients that mother nature provides for us this time of year. 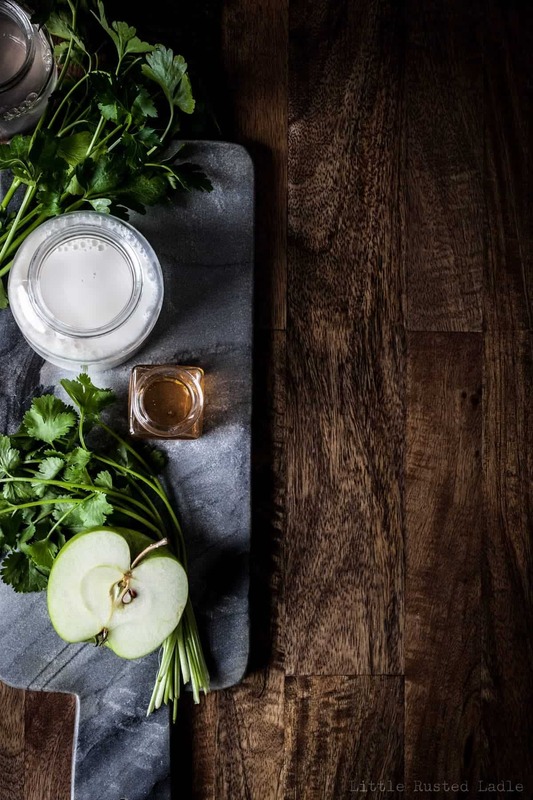 Ingredients that transform into delicious recipes. Fall recipes are searched more than any other season for a reason. It’s the same excitement that comes with all the other activities in fall. Leaves morphing into beautiful tones of orange, yellow, red and browns. The smell of burning wood. Football games every weekend and with them comes tailgating and football parties. But what links those events is food. Glorious fall food. 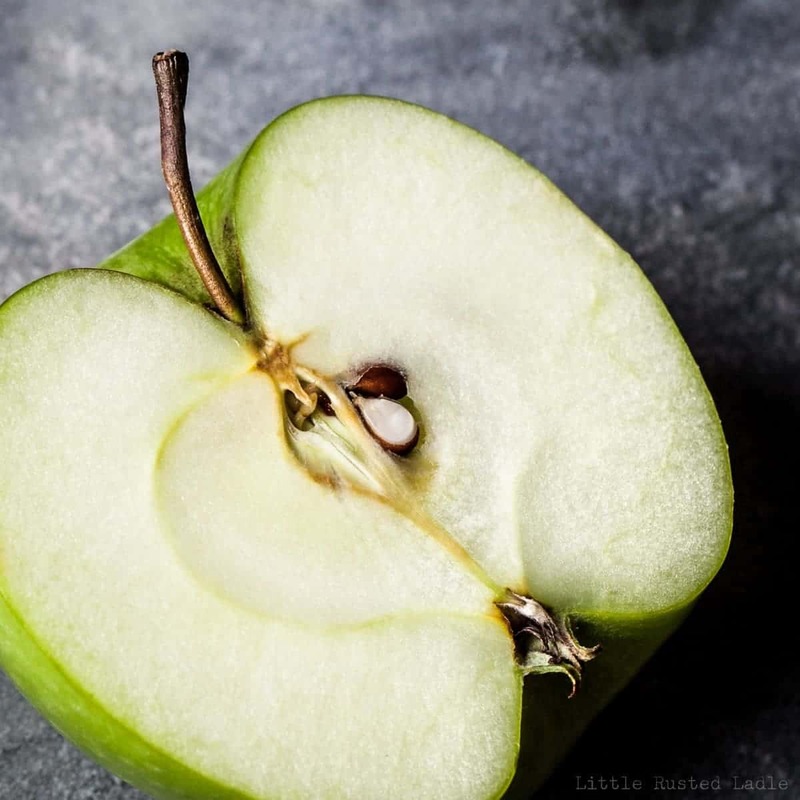 Can you imagine fall without all the incredible apple recipes like pie, cider, doughnuts, apple sauce, or caramel apples? 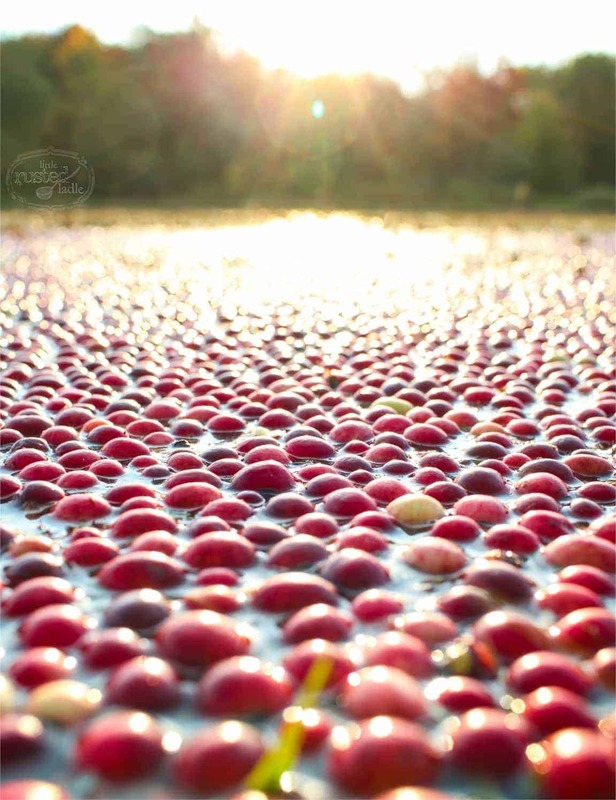 How about perfectly tart cranberries or the perfect bowl of chili? The thought of eating cheesy french onion soup on a crisp fall day makes me giddy with anticipation. Eating a creamy cheese spread while enjoying a Packer or Badger game with friends and family is as traditional as it gets. The smell of fresh baked bread just coming out of the oven waiting to be slathered with real butter. Fall vegetables like acorn squash, parsnips and brussels sprouts, roasted to perfection. 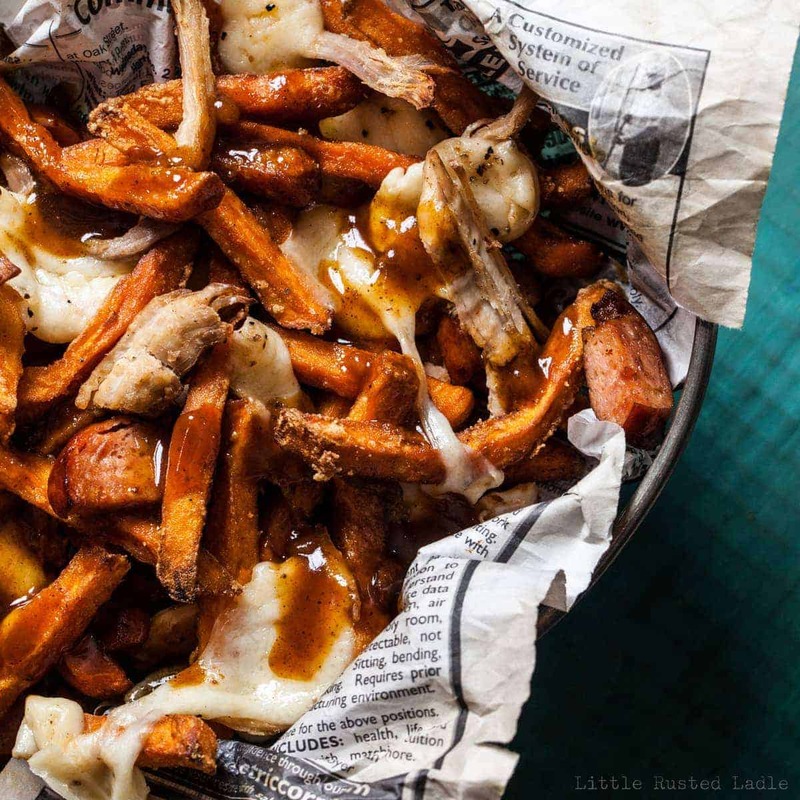 Yes, these are just a few of the reasons why fall is king when it comes to food. We may be sick of these flavors come next March, but right now, they are awesome! 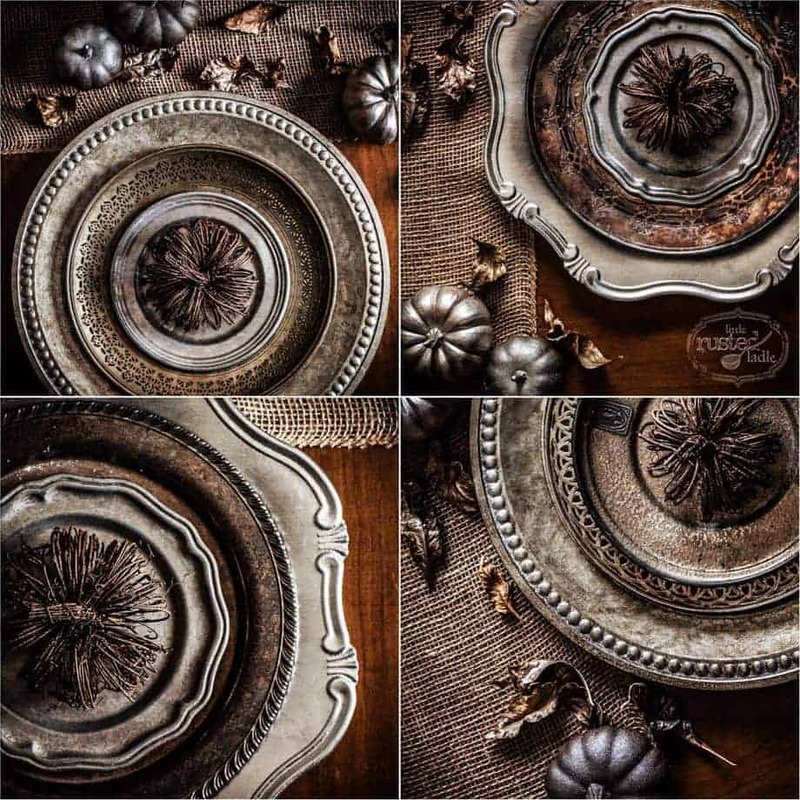 When looking back over the last three and a half years that Jena and I have been doing this, we realized how much we loved some of the fall food shots we’ve done. They bring back wonderful memories of the moments in which they were made. 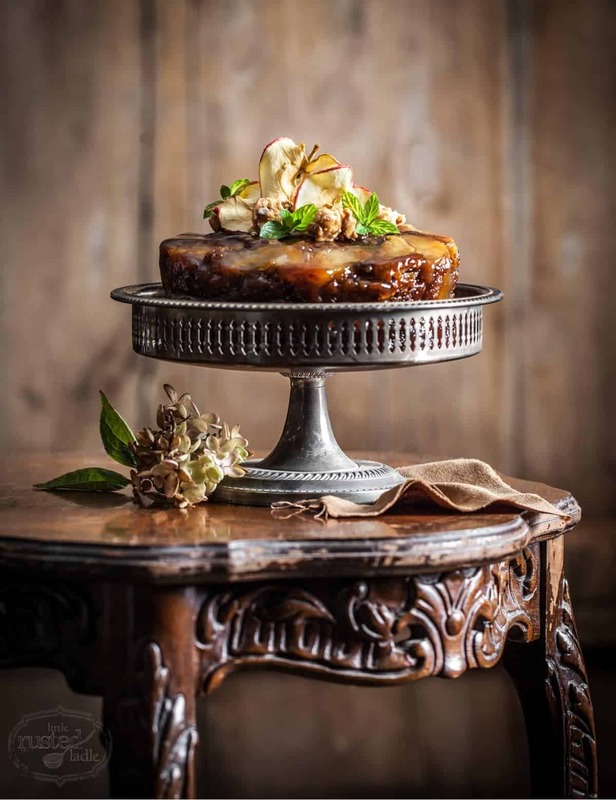 The apple article we did a couple of years ago and that incredibly delicious apple upside down cake. 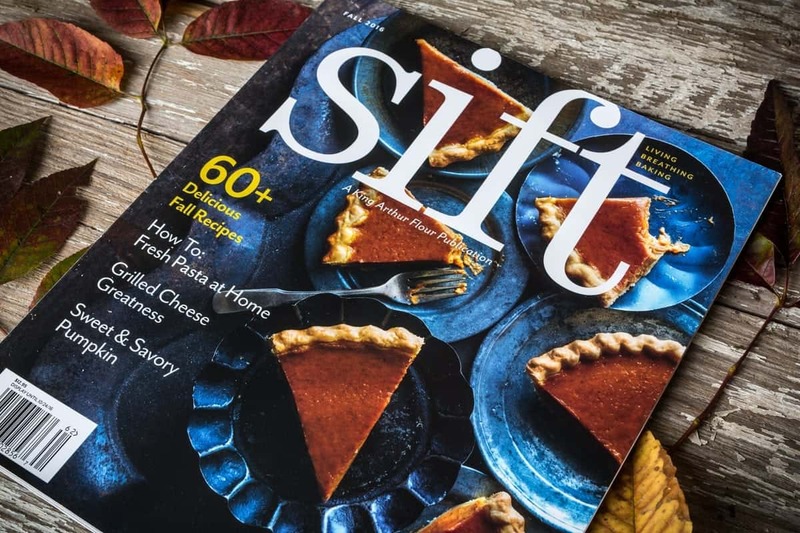 The wonderful cranberry article about Jena’s family that was recently featured in Sift Magazine showing off the popovers with cranberry butter, which is one of my favorite shots ever! 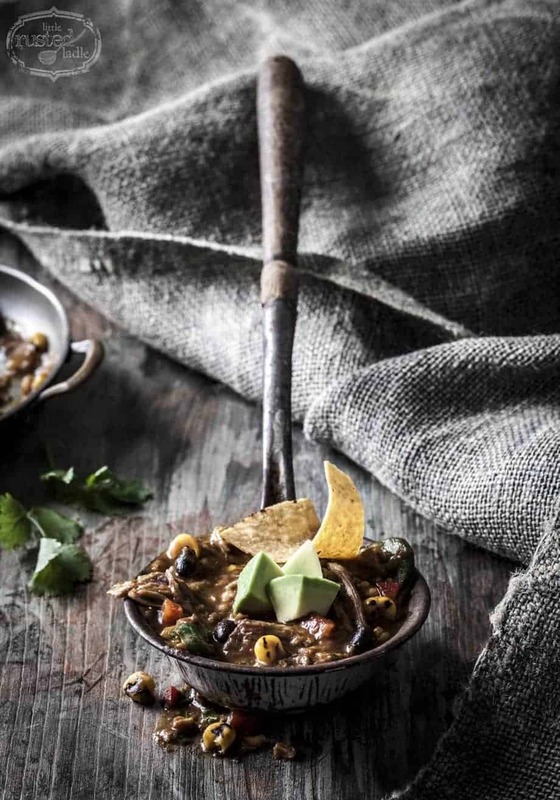 The Pork & Pumpkin Mole’ Chili. If you knew how incredible my kitchen smelled while making that, you’d run out to the store and make it tomorrow. The black and white series we did a couple of years ago for New Years Eve party featuring a German Onion Soup. We worked very late on the day we shot that, but it was worth it. The yummy Pull Apart Bread we did. I can still taste that one! 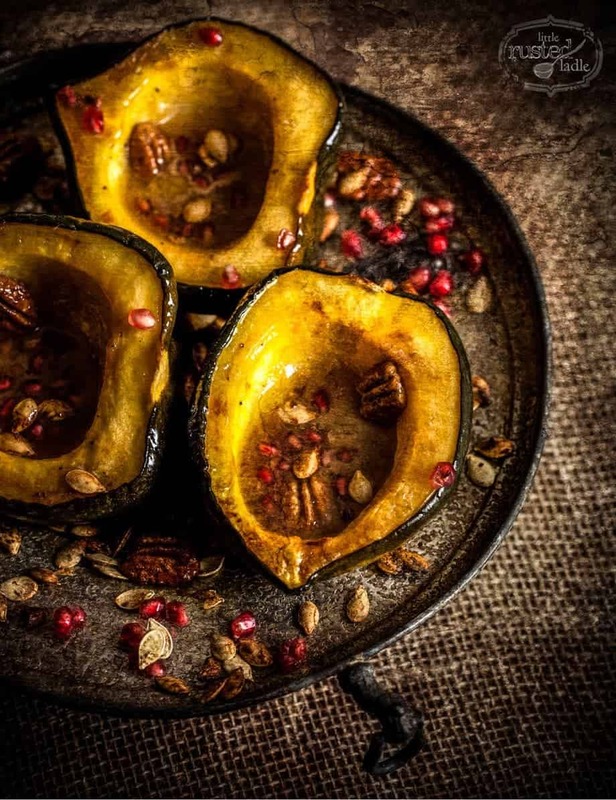 Our Sweet Pomegranate Squash with Spiced Squash Seeds among other tasty Thanksgiving recipes that we shot in Jena’s home. Her dinning room was the perfect backdrop for our Rustic Thanksgiving Feast feature. 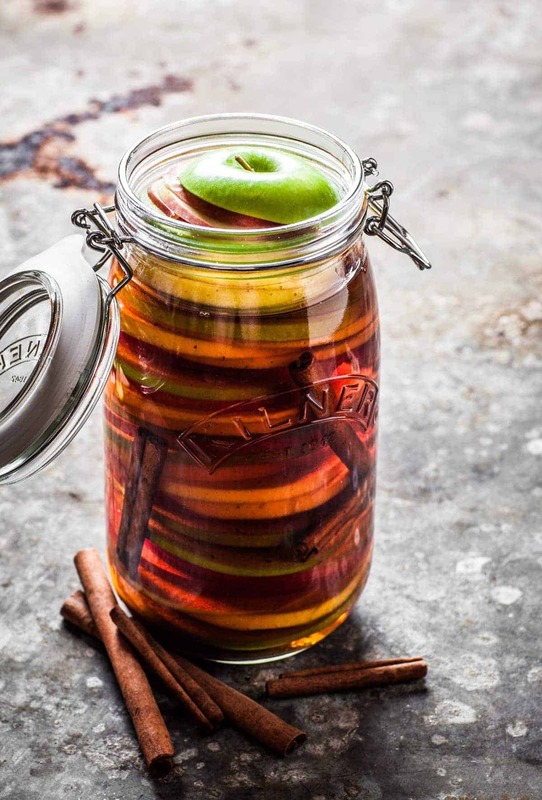 And what is fall without apple pie… apple pie infused bourbon that is! 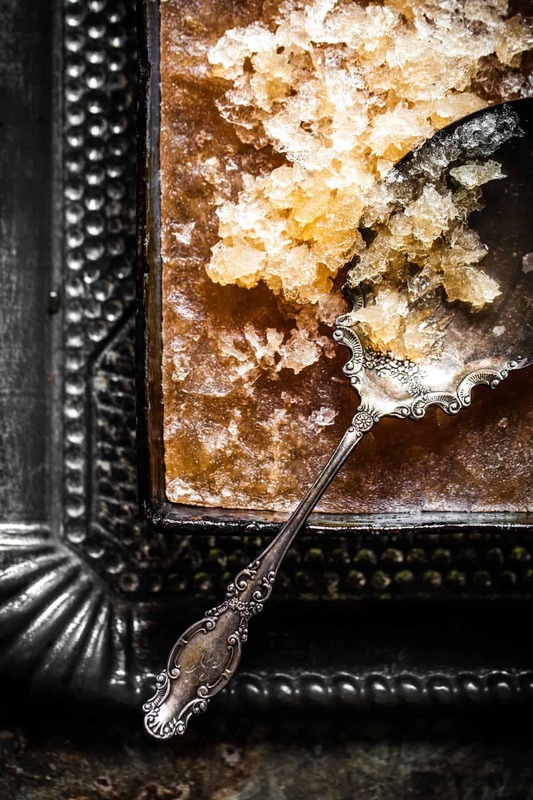 Here is the slush recipe to go along with that apple pie infused bourbon. Drink up! The Pork Chops we did as part of the apple series that took all of about fifteen minutes to shoot because they were so perfect right out of the oven! My girlfriend Judi still calls that meal one of the best I’ve ever made for her, and believe me, there have been quite a few. We decided to repost some of these shots to get everyone as excited for fall as we are. We hope you enjoy them as much as we did making them. We will try to create some more very soon. We would like to conclude this article with an apology for our infrequent posts. However, you may not be that disappointed because we’ve been very busy writing and photographing tons of new recipes for our NEW COOKBOOK! 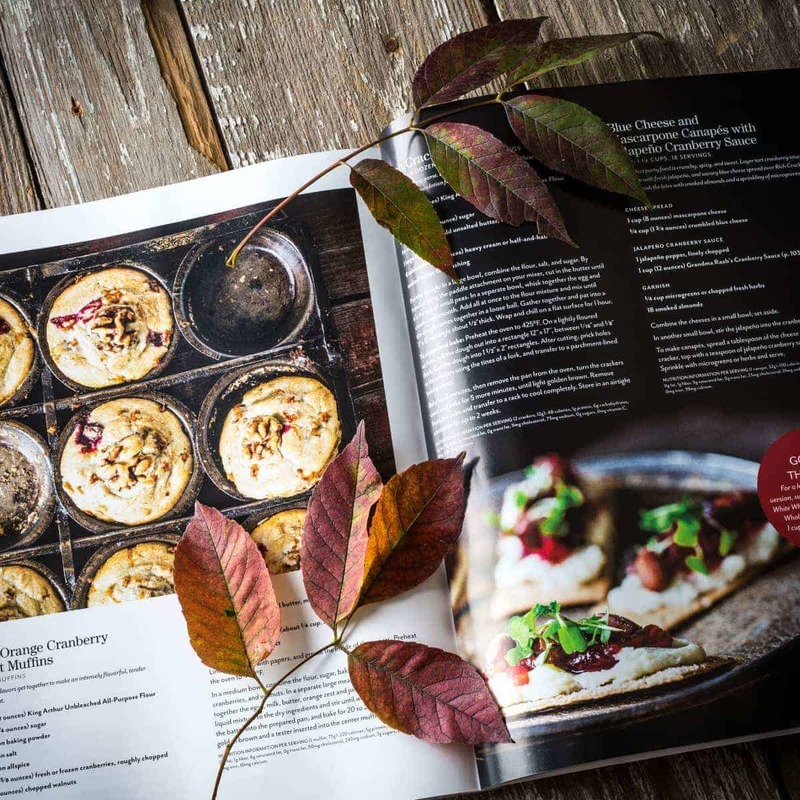 That’s right, we are thrilled to let our fans know that Little Rusted Ladle will have a new cookbook coming out next spring. We will be done with it in about a month, after which we will resume our articles. Stay tuned for how you will be able to order a copy or where and when it will be available. We are really excited about it and know you will be too. Enjoy fall, family and friends. Until next time, cook with love and live to cook. “Raspberry beret, the kind you find in a second hand store. Raspberry beret and if it was warm she wouldn’t wear much more. Raspberry beret I think I love her.” Come on sing it with me. Let me guess, you’re kind of wondering what the heck I’m singing a Prince song for? Well, Jena and I were working on a recipe shot for this little project we are doing. It’s top secret, so I can’t tell you, but we will let all our fans know very soon, so stay tuned. Anyway, while making a drink for the shot which had the herb known as burnet in it, Jena said “hey, why don’t we put raspberries in it and we can call it raspberry burnet?” Clever huh? So that is why I’m singing that song. You can’t help it, it just comes out of your mouth. It’s a very easy drink, and quite refreshing. Fresh raspberries, burnet, fresh lime juice, and sparkling water with a little lemon lime soda. What’s burnet you ask? Burnet is a very cool looking perennial herb that tastes a lot like cucumber. Since craft cocktails using cucumber are in vogue right now, I thought making a drink with an herb that tasted like cucumber would be a little different. That and we had to use it so we could sing that song while we photographed it. 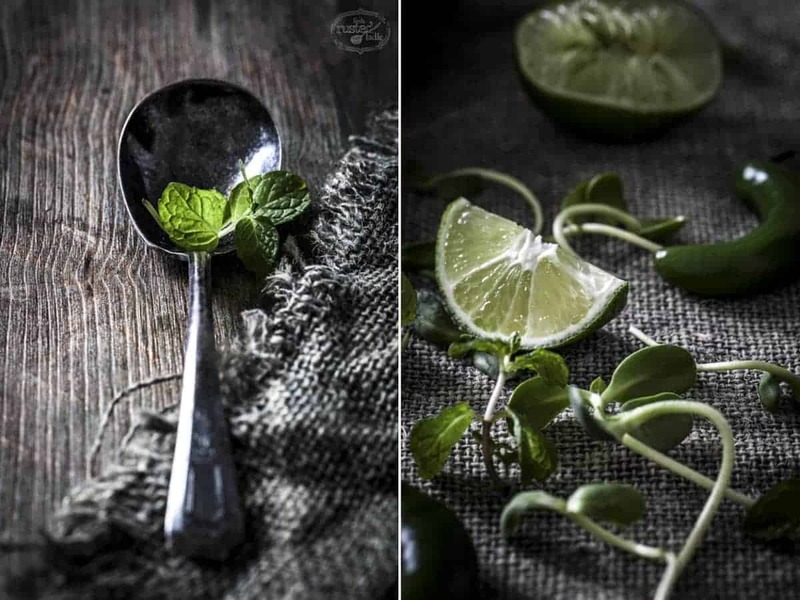 Think mojito without the rum and substitute the burnet for the mint. Prince was reported to not be a fan of alcohol, so Jena and I thought we would make the Raspberry Burnet Soda Pop non-alcoholic. Also, did you notice it’s called soda pop? That’s to allow for both sides of the age old question do you call it “soda” or “pop”? Everybody is happy. Besides, It reminds me of a time gone by. The old soda fountain, where they would add the flavoring and carbonation right in front of you before there was bottled soda. We both thought it would be good with vodka or even gin, but you can try that on your own. 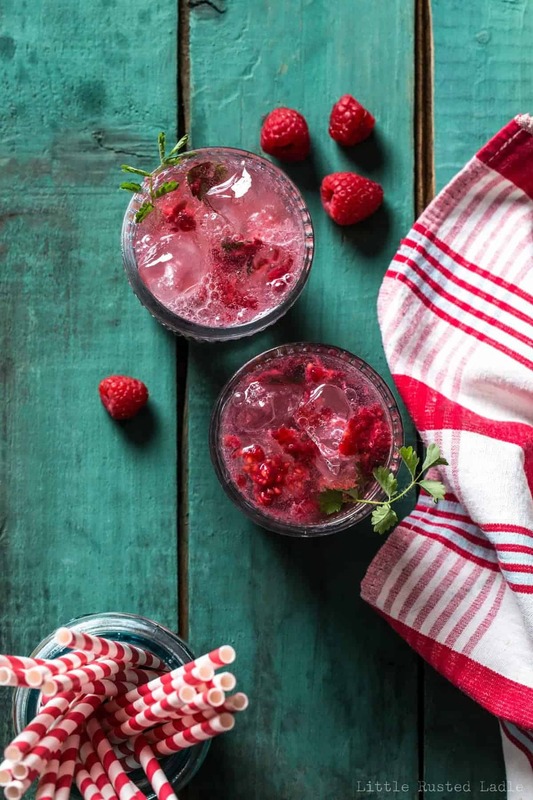 To make this soda pop, place about 4-5 fresh raspberries each in two rocks style glasses. 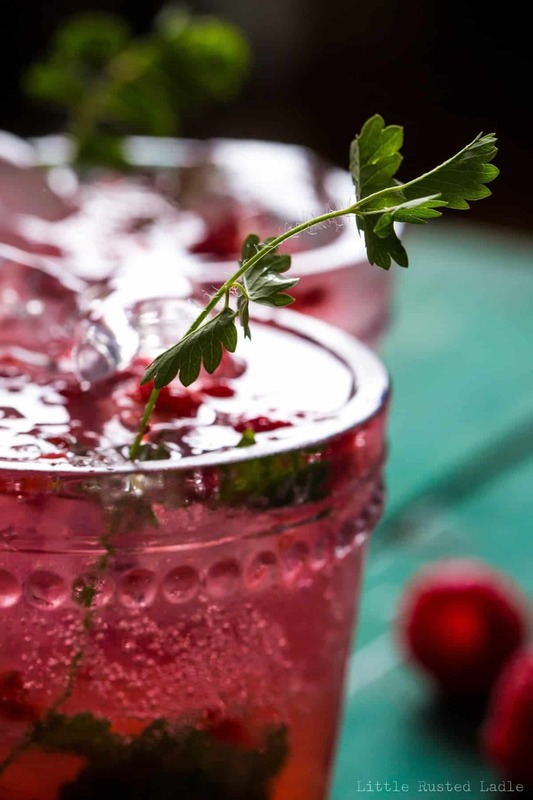 Add about two sprigs of fresh burnet into each glass, topped with a teaspoon each of fresh lime juice and a teaspoon of simple syrup. You can buy simple syrup at a liquor store, or simply combine one cup of water and one cup of sugar in a small saucepan and cook on medium heat until the sugar dissolves. Let it cool, then transfer it to a bottle or jar to use when you have a recipe that calls for it. 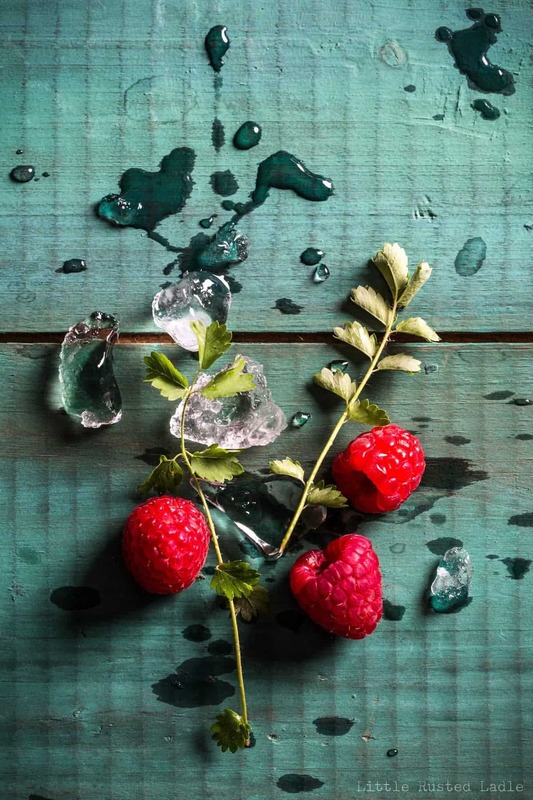 Muddle the raspberry burnet mixture with a muddler or the back of a fork. Add ice, then add sparkling water to three quarters full and top with lemon lime soda. Stir and serve. Enjoy your summer. P.s., don’t forget to play the song while you make it. You can’t help but be in a good mood afterwards. See you soon. Remember to cook with love and live to cook. 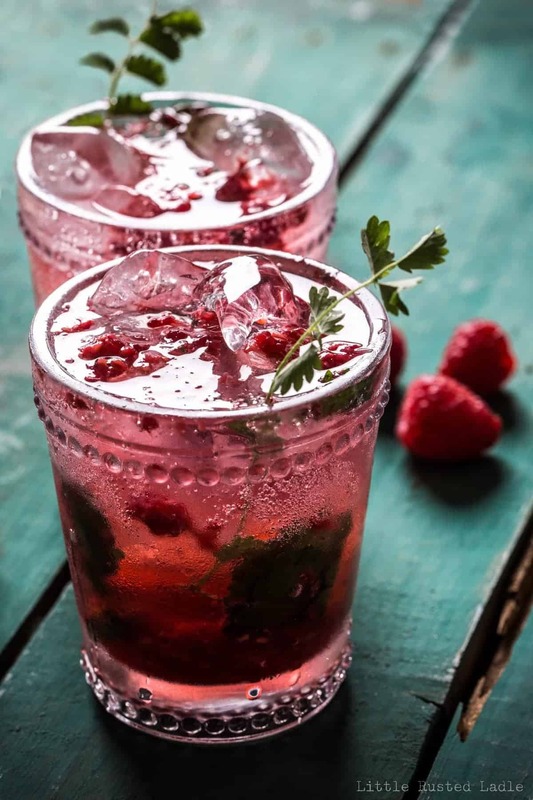 This simple and refreshing beverage has the tart flavor of raspberries and lime and the subtle flavor of cucumber that comes from the herb burnet. Prince would be proud. Divide raspberries, lime juice, burnet and simple syrup between two rocks glasses. 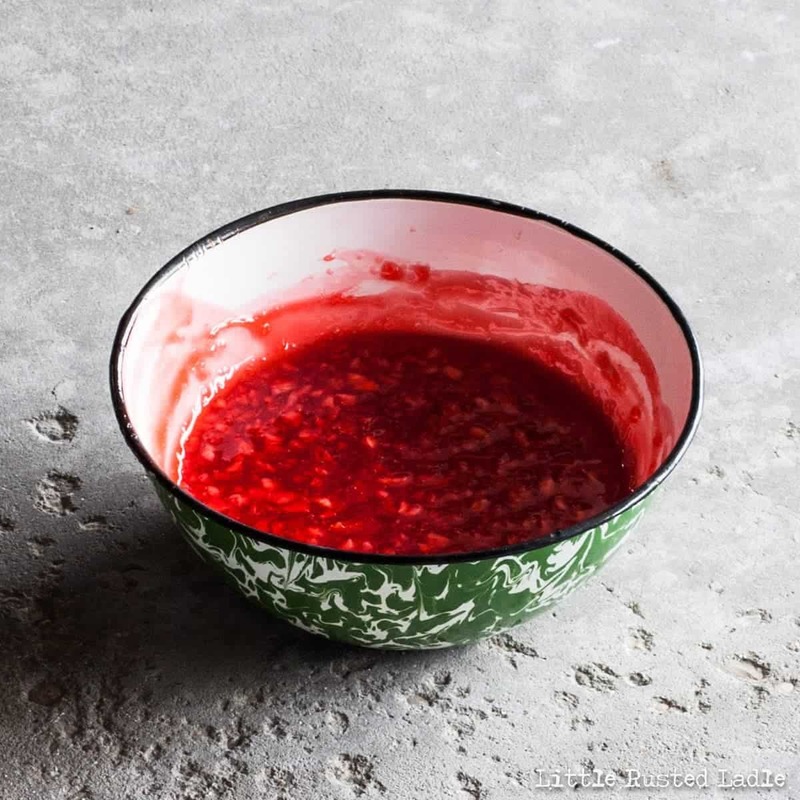 Muddle raspberries and burnet with a muddler or the back of a fork. Fill to halfway with ice. Add water and lemon lime soda. Stir and serve. Add a sprig of burnet for an elegant garnish. If you’re like Jena and I, every summer means having to come up with some appetizer or dish to bring to a friend’s party at the last minute. Sometimes that’s not so easy. 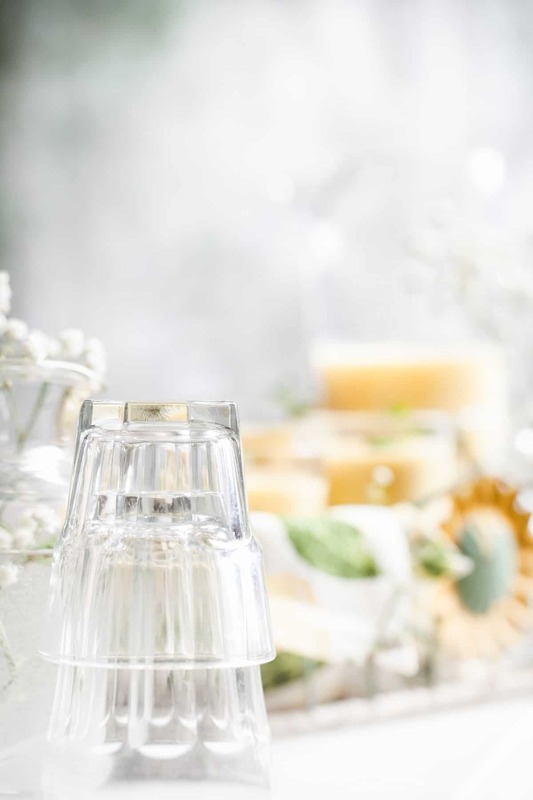 Between cutting the grass, planting flowers, getting kids to summer events, and the endless parade of weddings, graduation parties or family summer excursions, those dishes to pass can sometimes cause us stress. Forget about the concept of creating something people will remember, or trying to make it healthy as well. Until now that is. Jena and I were working on a project for a client that involved creating a shot of multiple kinds of appetizers on different trays. We thought we were getting many choices, but only had a couple, so I had to come up with some more options and do it quickly. We had many ingredients to choose from, but nothing that seemed to really add any kind of visual excitement. Sometimes when in that kind of situation, you have to just trust your creativity and go with it. We had some cool dried apple crisps on hand, which were nothing more than dehydrated apple slices that were cut very thin and were very flat. My guess is they were weighted down to prevent curling. In addition to these, we had an assortment of cheeses, various dried fruits, nuts, and some fresh herbs. No breads were available and crackers seemed mundane, Dips or spreads were not an option because they needed to be finger foods. That’s when it hit me. 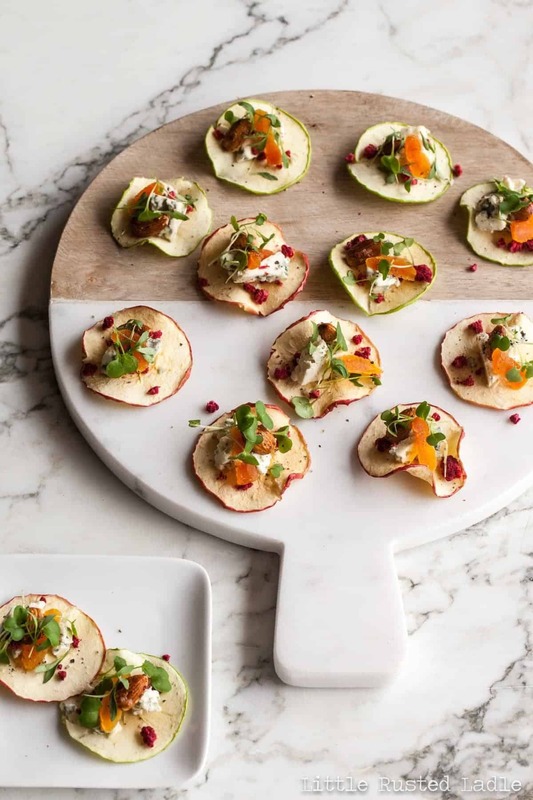 Why not use the apple slices in place of a baguette slice or cracker and make a healthy, gluten free bruschetta appetizer? Kind of a portable salad. 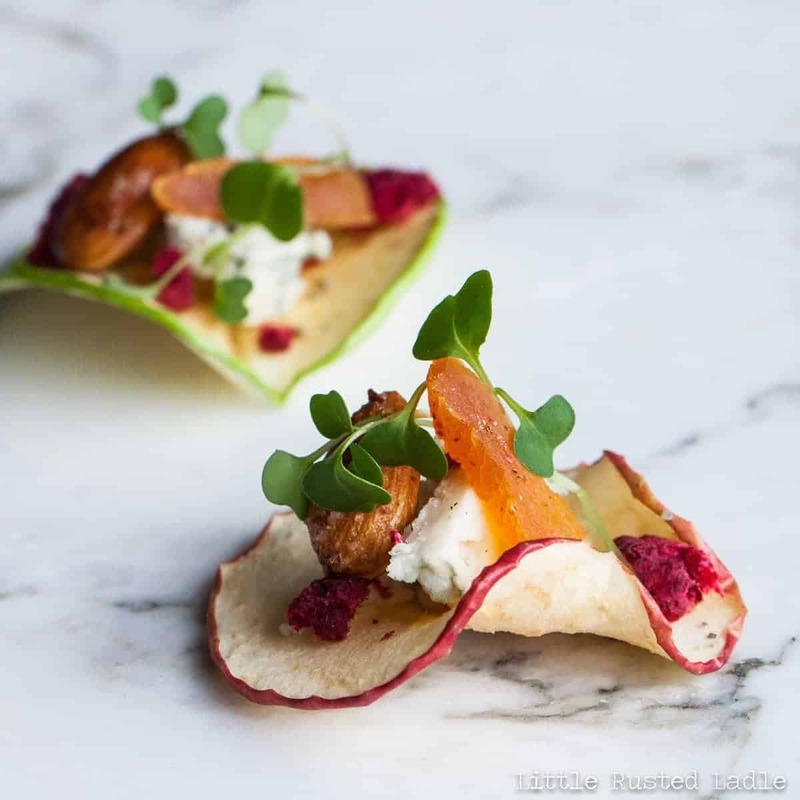 With the apple slice chosen as the edible canvas, we simply needed some color, texture and smell and flavor to give this canapé some life. What goes good with apples? Cheese. Blue cheese to be more specific. So do nuts and lettuce. 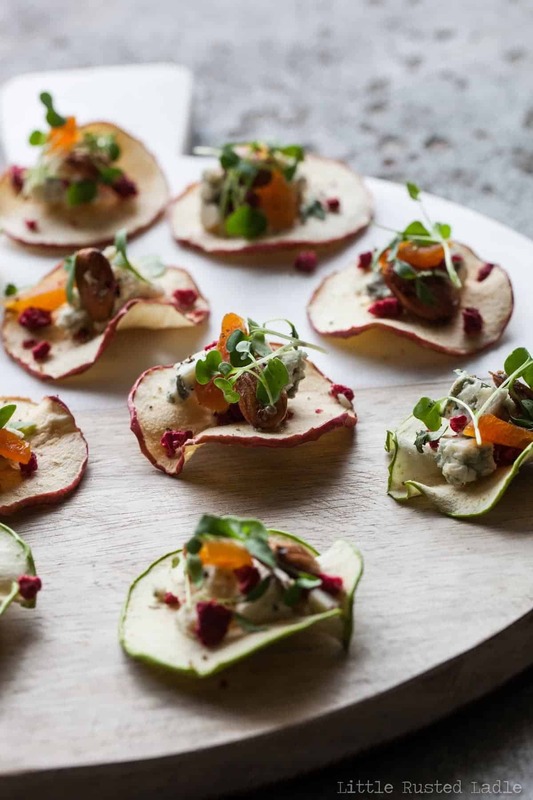 By putting a few crumbles of blue cheese on the apple slice, we added a big punch of flavor. 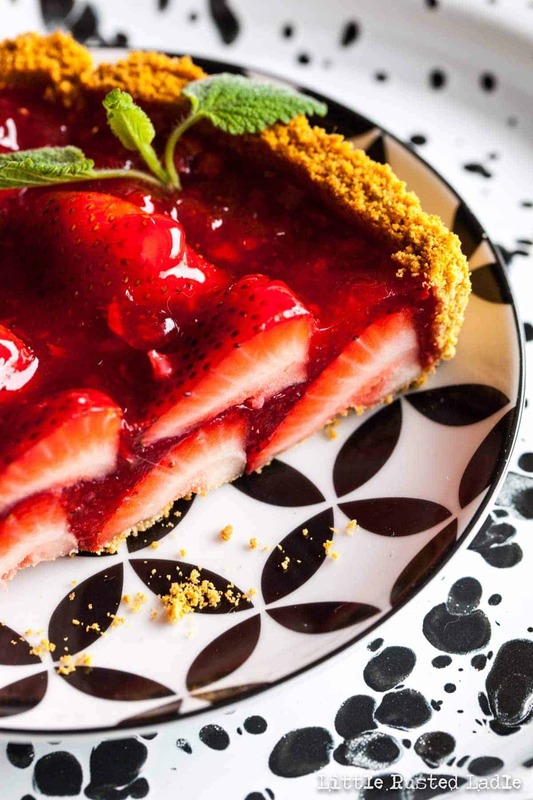 A whole almond added texture and a nice crunch, a few crumbles of freeze dried raspberries added great color and some tartness, a slice of dried apricot for more color and some sweetness, and a few fresh herb micro greens for the smell and splash of green to finish it off. What a great combination of flavors. Simple, fancy, yet achievable. In order to re-create them for this article, Jena dried some thin apple slices in the oven overnight, which only took about 10 minutes to prepare. All the other items we found in the grocery store or our gardens. The micro greens can be an easy find in the spring by simply planting a packet of fresh basil or cilantro seeds in a pot of soil and watering them everyday. Make sure they are in direct sun. When they start growing, you can use them as garnishes for cute appetizers like these. Feel free to substitute other chopped fresh greens or herbs for the micro greens if you want. Like everything we do here, there are no rules, so do whatever you want. Just think with your tastebuds about what each ingredient will taste like. 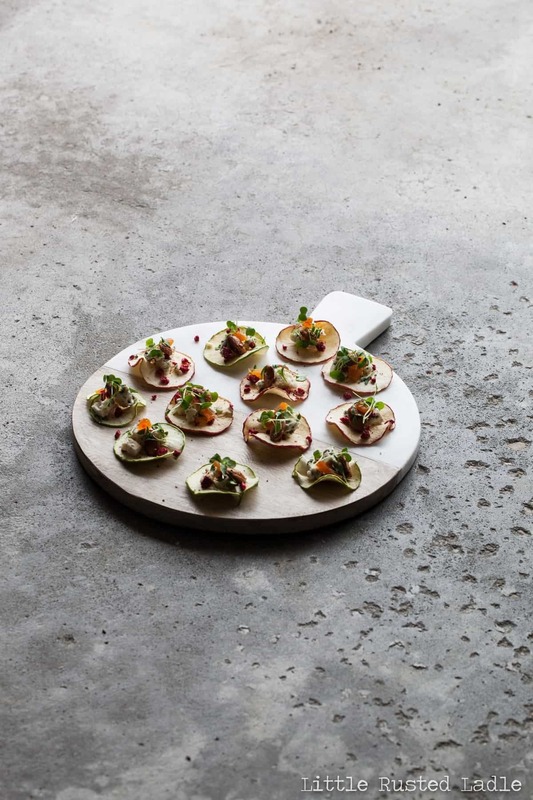 A platter of these simple but healthy canapés is a beautiful statement for your next party. Your friends will be asking for the recipe. Tell them you got the recipe from LRL, or tell them you came up with it on your own. It doesn’t matter. You’ll be happy you delivered a fun appetizer that is perfect for the last minute summer party when seven layer dip from the deli just doesn’t cut it anymore. Enjoy the summer and don’t forget to cook with love and live to cook. 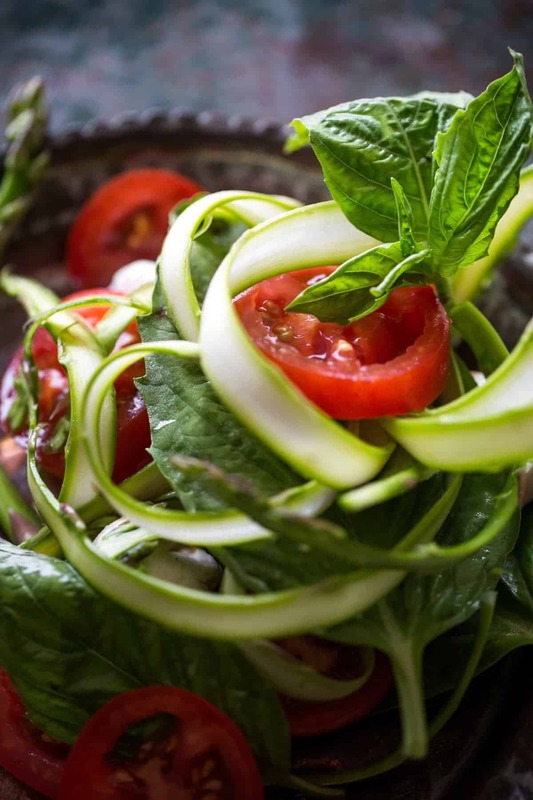 These tasty and healthy appetizers have all the elements of a memorable appetizer. Just pile the ingredients on and enjoy. 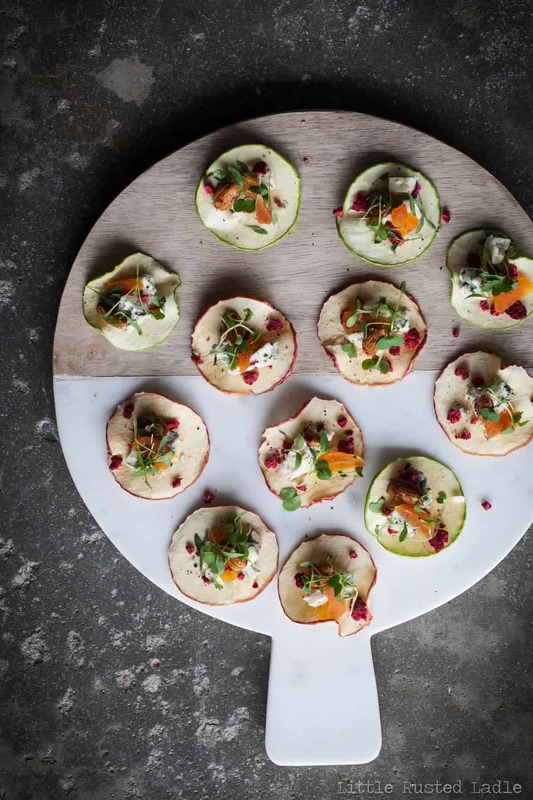 Place a piece of blue cheese on each apple slice and top with a small amount of remaining ingredients. Place on trays, cover and refrigerate until ready to serve. It’s that time of the year again. No, I’m not talking about the crazy love hungry birds chirping like crazy first thing in the morning, which now comes earlier thanks to that big glowing orb in the sky rising earlier every day. I’m talking about champagne mango season. With tulips blooming and the trees getting ready to explode with foliage, one can’t help but be happy. This winter was not a bad one for us midwesterners, but that doesn’t mean we aren’t ready for nature to pull out it’s full box of crayons and start coloring away the drabness of winter gray. A few years ago, we posted our article on champagne mangoes called Champagne Mangoes – Tis The Season, which of course I recommend you revisit. I often look back at our old articles for reference. I really liked that article because it was so beautiful. It was fresh, light and beautiful thanks to Jena’s ability to capture that perfect moment. Champagne mangoes lift my spirits because they are so wonderfully sweet and so beautiful. 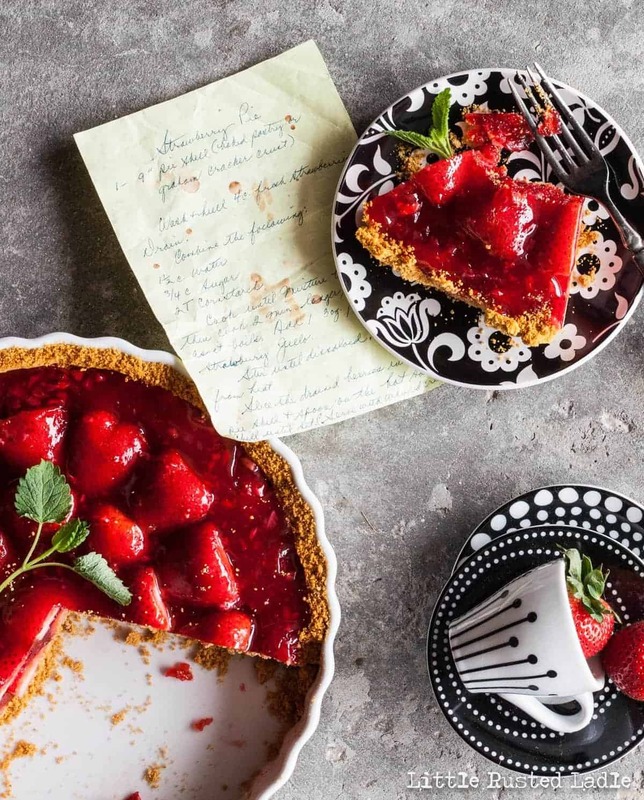 With Mother’s Day right around the corner, I thought we should offer up a quick recipe for you to try that mom just might enjoy on her special day. 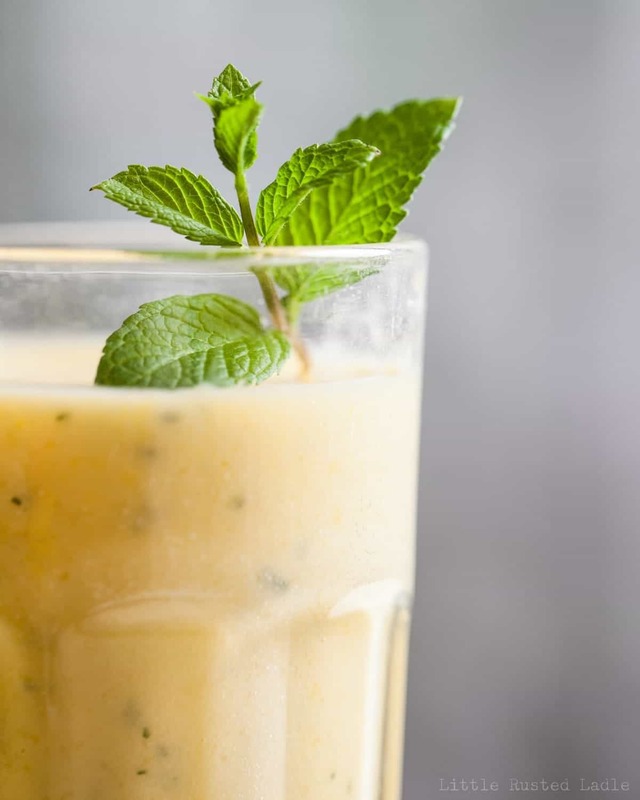 It’s called a Champagne Mango Mint Smoothie/Cocktail. Yes, you guessed it, this fresh and healthy eye opener can become an eye closer if you add rum or vodka. Not to say I recommend you get mom drunk on her special day, but let’s be honest, Mother’s Day usually involves mom still doing the lions share of work that day. So, she can have the healthy version in the morning when you make her breakfast in bed. Then make her the high octane version at night when she’s had enough of us and just wants a cool spring libation while reflecting on the headaches we caused her. So, go out buy some of these golden gems of spring. Put them in salads, smoothies, or add them to sauces. They are a great gift of nature. See you soon. 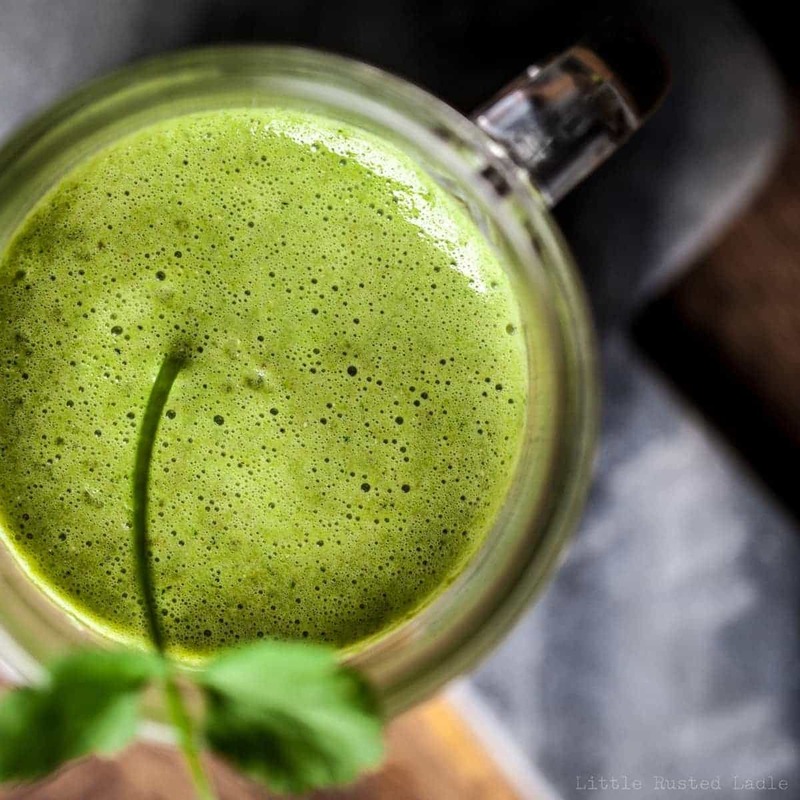 This light and beautiful smoothie is the perfect way to start the day. Combine all ingredients in a blender. Blend on high until smooth. Pour into glasses and serve. Garnish with a sprig of fresh mint. Top o’ the morning to ya and a Happy St. Patrick’s Day as well. Before I throw on me green attire and start eatin me Lucky Charms, I thought I’d give ya a little golden recipe known as the St. Patty’s Day Corned Beef Pot Pie. It’s filled with all the wonderful treats we Irish love so much. Corned beef, cabbage, potatoes, onions, swiss cheese, thousand island dressing and caraway seeds. Alright, alright, I need to stop this madness. First, let’s be honest, I don’t write with an Irish accent. Nobody does that. Heck, I’m not even Irish. I’m mostly British, which I found out a few years ago. I thought I was Irish and loved St. Patrick’s Day and all the traditions that went with it. Mostly the green beer, the food, the goofy old Irish songs and the talking like a leprechaun all day. Then I found out I wasn’t Irish. It kind of took the wind out of my sails with celebrating this holiday. Let’s be honest though, St. patrick’s Day is another holiday that Americans use as an excuse for consuming copious amounts of green colored beer, eating massive amounts of so called Irish food, while playing Irish sounding music, while wearing green colored clothing with shamrocks painted on their faces. People of Ireland don’t eat corned beef, and they would never dream of ruining their beer by putting artificial green color in it. They are more likely to celebrate this day eating pork than beef. In fact, it was us Brits (did I just call myself a Brit. ?, lol) that invented corned beef. 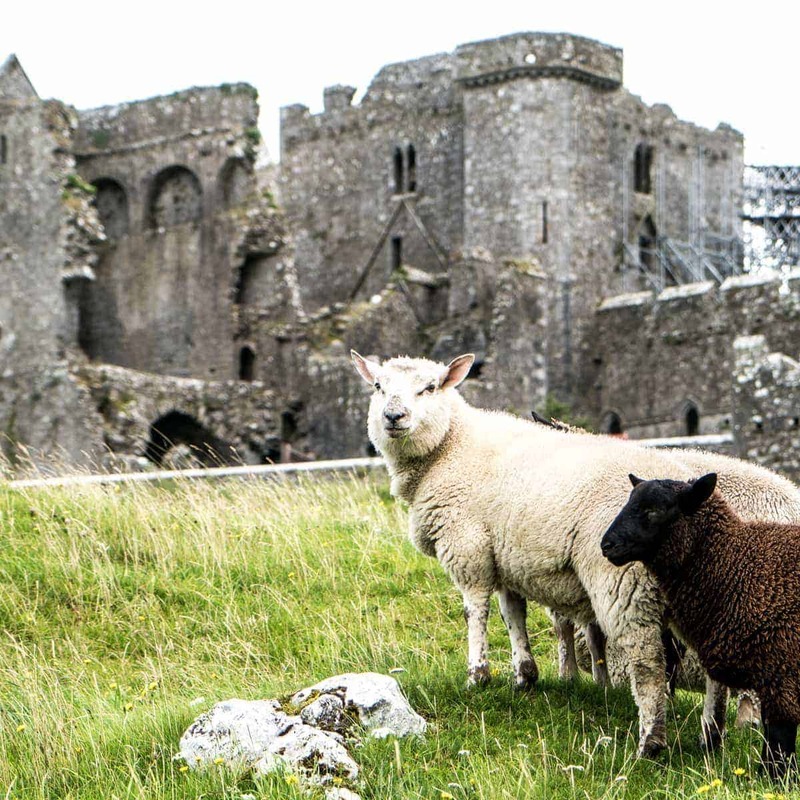 The Irish considered the cow sacred. Cows weren’t eaten unless they were no longer of any use in the fields. Ireland only started producing corned beef for Britain because their tax on the salt needed to cure the beef was one tenth of what it was in Britain. Imagine that, people working around high taxes by going somewhere else to get what they wanted cheaper. Hmmm, I think a certain country was started by this same concept back in the 1600’s? 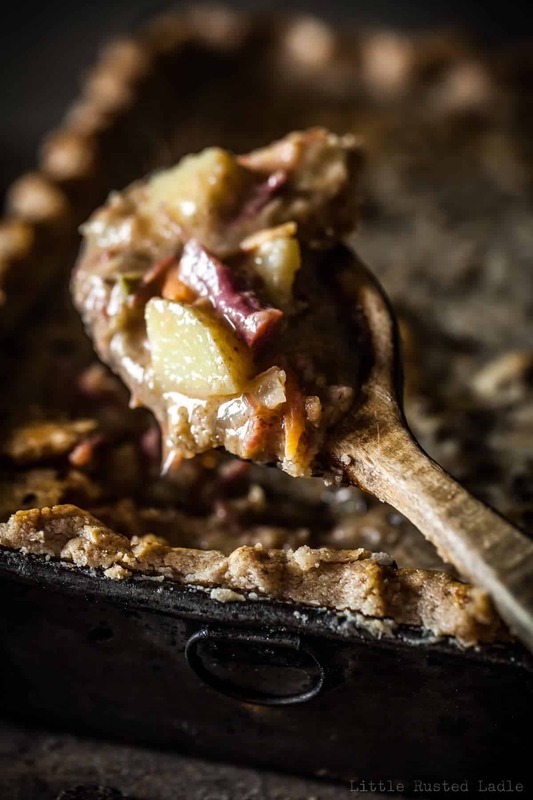 Well, you may not be Irish, and you may not like getting hammered while listening to Celtic music, but Jena and I think you’ll love this St. Patty’s Day Pot Pie. It’s a great way to use up the leftover corned beef and cabbage you’ll have in the fridge tomorrow. Or, you can make it your new tradition every year. Personally, I think it tastes better, but what do I know, I’m British. Until next time, remember to Cook with love and live to cook. 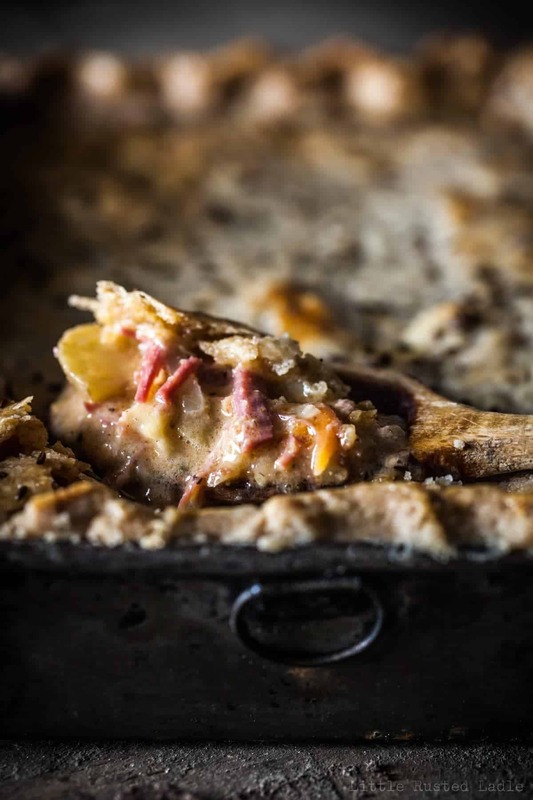 This pot pie combines all the flavors we Americans love to associate with St. Patrick's Day. Corned beef, potatoes, cabbage, thousand island dressing and swiss cheese enrobed in a flaky crust. 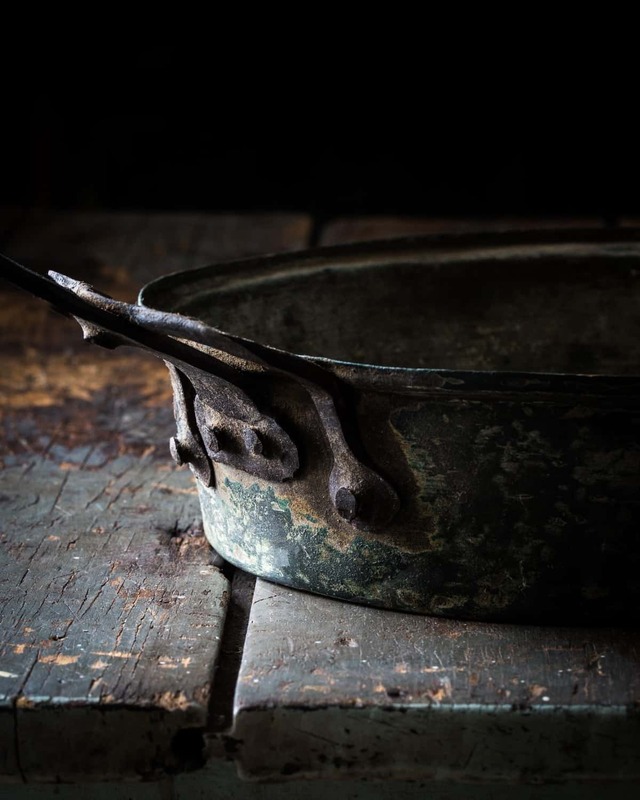 In a large saucepan or dutch oven, simmer potatoes in chicken broth until barely cooked through (about 10 minutes). Meanwhile, heat butter in a medium skillet over medium heat until melted. Add onions, carrots and garlic and cook until carrots are crisp tender. Add cabbage and cook an additional minute or until softened. Stir in flour and cook for about 4 minutes, stirring often. Add potatoes and broth mixture and stir until thickened. Stir in dressing, cheese and pepper. Cook until cheese is melted and mixture is thick. Fold in cooked corned beef and remove pan from heat to let cool. Transfer mixture to a container, cover and refrigerate for 1 hour or until completely cooled. Meanwhile, remove pie dough from refrigerator and let rest for 10 minutes. 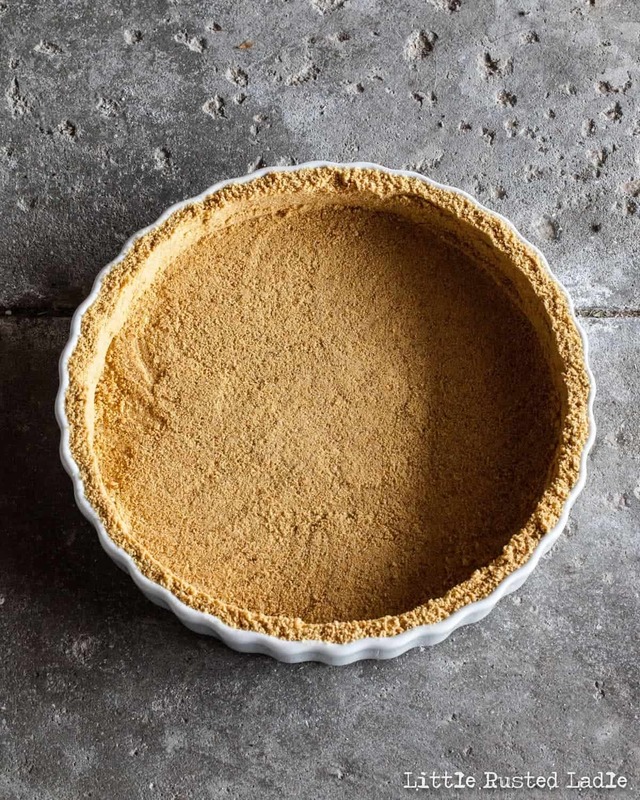 Sprinkle half of the rye flour onto a clean surface and unroll one pie dough over flour. Sprinkle with half of the caraway seeds, then roll pie crust out until circle is about an inch bigger. Place in pie pan and trim edges to about a half an inch hangs over the edge. Sprinkle remaining flour on surface and unroll remaining pie dough over flour. 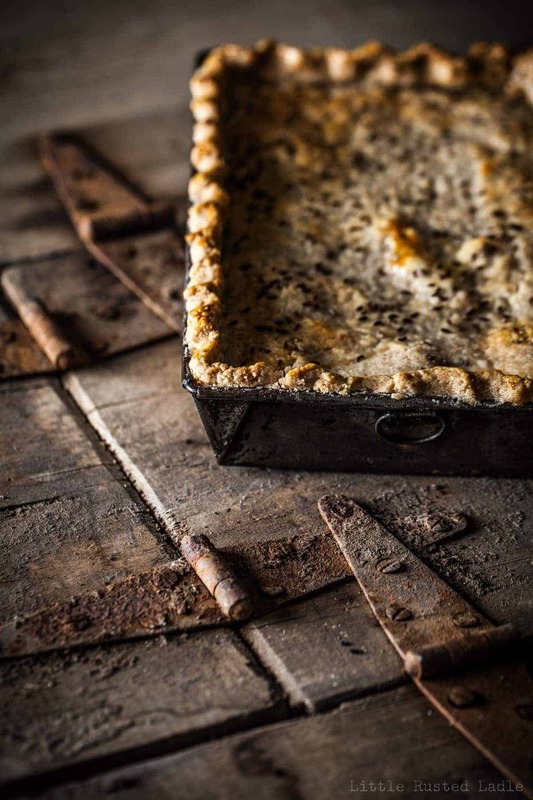 Sprinkle remaining caraway seeds on dough and lightly roll over dough, allowing seeds to be pressed into dough. Spoon cooled filling into dough lined pie pan. Place remaining dough circle over filling and roll in edges to top of pan. Crimp edges with your fingers. Transfer pie to a foil lined baking sheet. Make small holes in pie for venting. Bake in oven preheated to 350 degrees for 45-50 minutes or until crust is golden brown. Remove from oven, let cool for about 5 minutes, then cut into pieces and serve. For a fun alternative, cut pie dough into shamrock shapes and spoon about ½ cup of filling onto one shamrock. 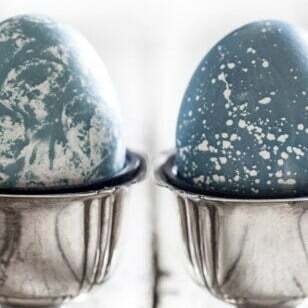 Brush edges with egg wash, then top with another shamrock. Press to seal. Bake for 2--25 minutes. Finding a healthy snack to keep you going during the day can sometimes be difficult. You can only eat so many almonds before you start feeling more like a squirrel than a person. What about dark chocolate you say? Oh sure, pounding down one or two dark chocolate peanut butter cups is pretty awesome. Right up until the sugar rush wears off and you find yourself needing a blankie and a nap. You can’t be napping when you’re in a killer Fit Bit step challenge with your girlfriend, who happens to be high energy and very motivated. What you need is not just two great tastes that go great together, but maybe eight great tastes that happen to also be very good for you and give you lots of energy. 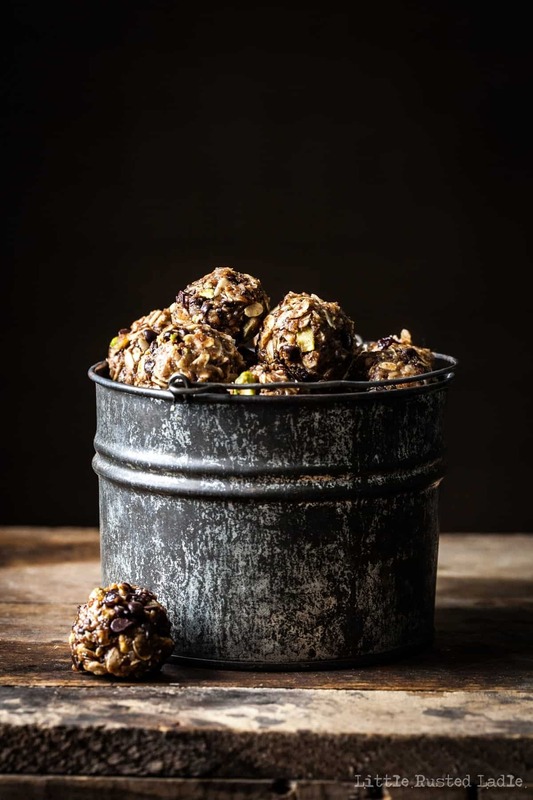 We’re talking Energy Bites. 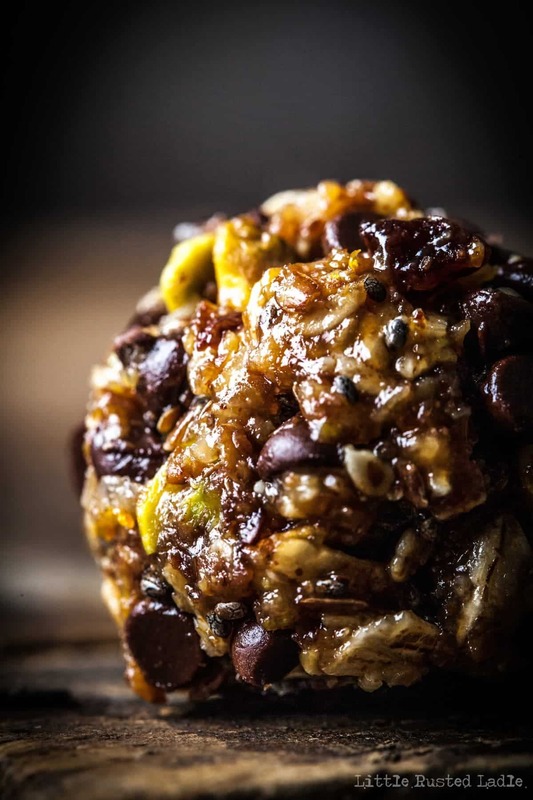 A protein packed combination of old fashioned oats, almond butter, dried cherries, pistachios, orange zest, toasted coconut, honey, mini dark chocolate chips with some chia seeds and ground flax meal for added protein. 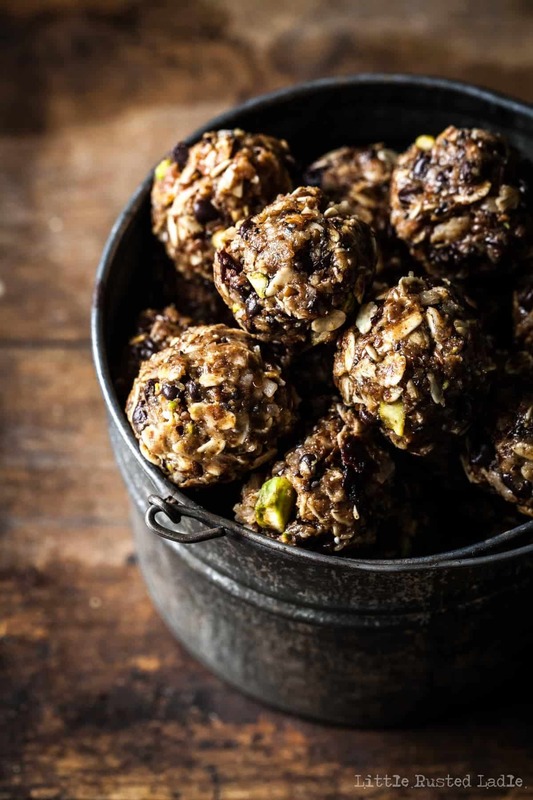 These tasty bite size balls taste delicious, and are guilt free. They’re also very easy to make. 15 minutes from start to finish. As a matter of fact, I was craving some while writing this article, so I went down to the kitchen, made a batch and ate two before coming back up to finish writing this article. Want a healthy snack for the kids? Check. 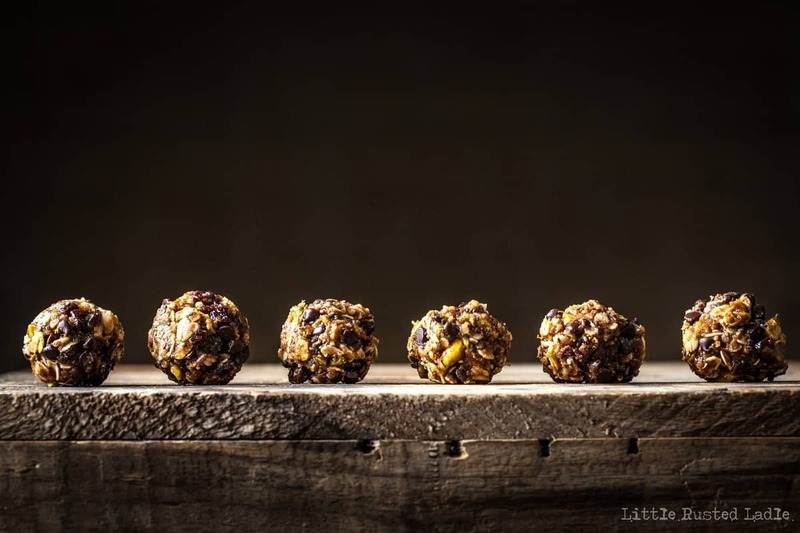 want some homemade energy bars for your next camping trip? Done. Need that boost of energy to get you to 10,000 steps so you can keep up with your motivated girlfriend? Got it. Don’t thank me, thank the ancient grains. Because once again they came through in the clutch. See you next week, when we’ll show you how to use that leftover oatmeal with a popular herb to help rid your body of heavy metals. Until then, remember to cook with love and live to cook. 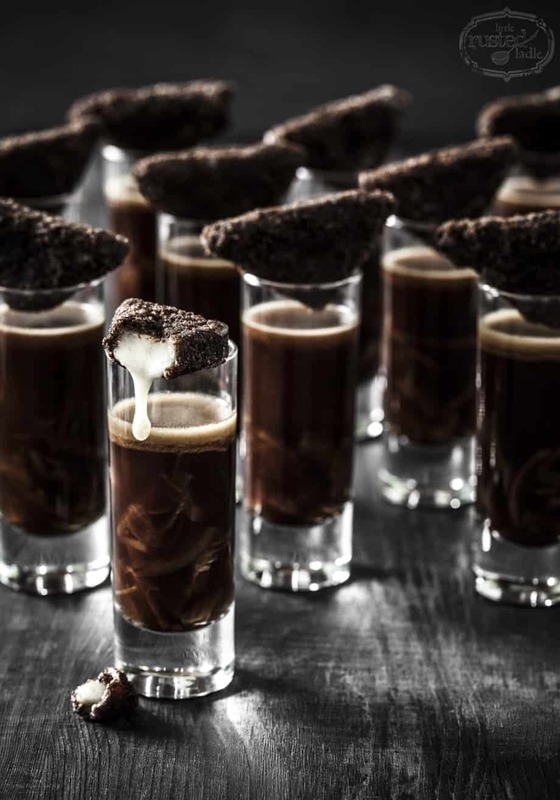 These powerhouse bites of yumminess will recharge your battery and tantalize your taste buds at the same time. Combine oats and next seven ingredients in a medium size bowl. Add almond butter and honey and stir until all ingredients are combined and the mixture can be formed into a ball. Refrigerate for 30 minutes or until chilled. 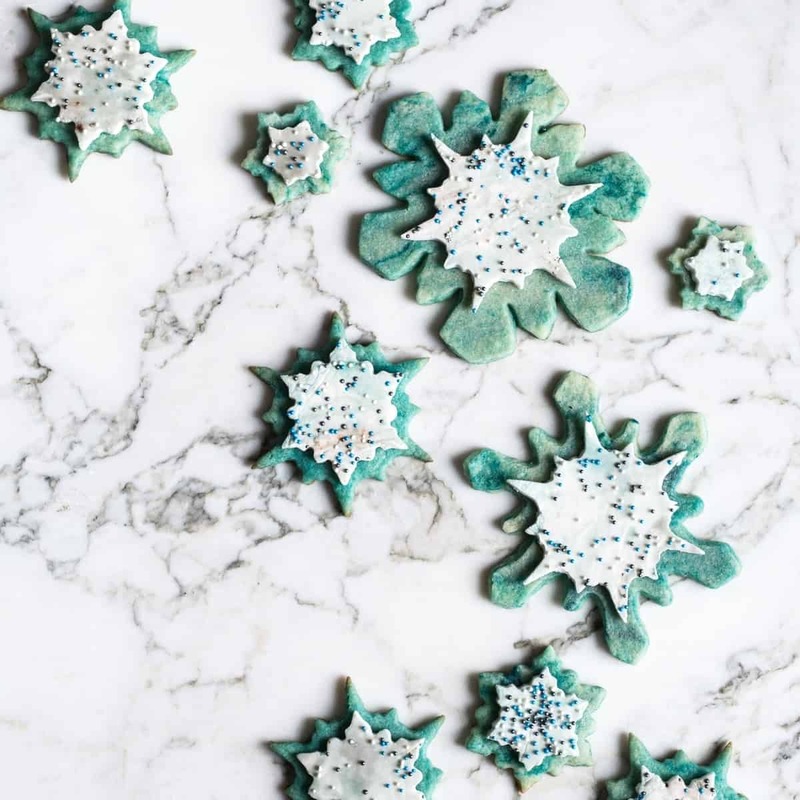 Form into balls and place on a wax paper linen cookie sheet. Refrigerate until firm. Store in a sealed container in the refrigerator for up to 2 weeks. Feel free to substitute sunflower or pumpkin seeds for the pistachios if desired. 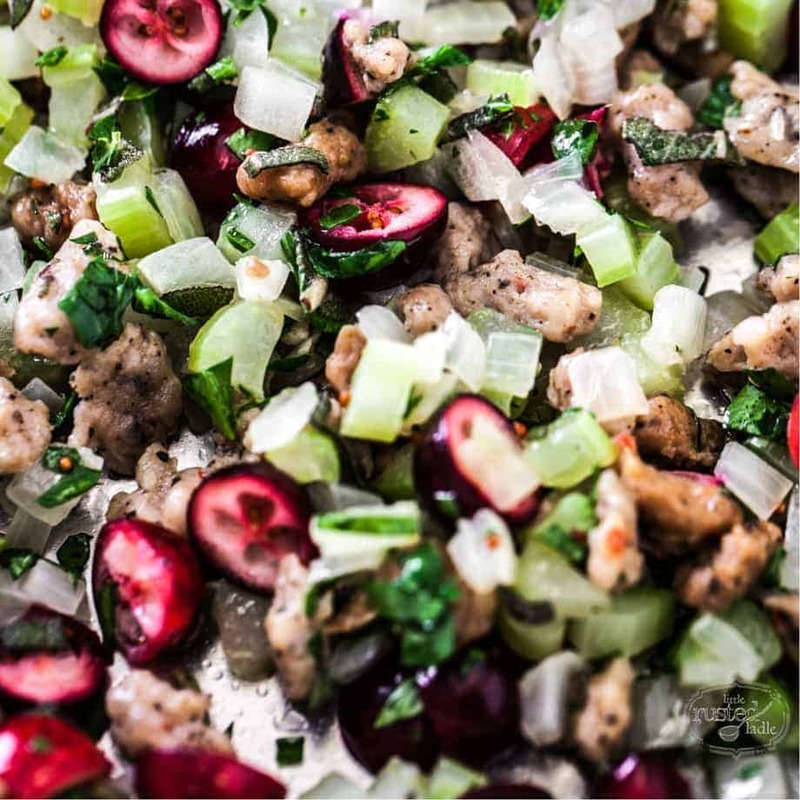 You can also omit the cherries or replace them with dried cranberries or chopped dried apricots or raisins. It’s week two of ancient grains month, and for this week we are showing a few examples on how to use that leftover ancient grain meal you made last time. 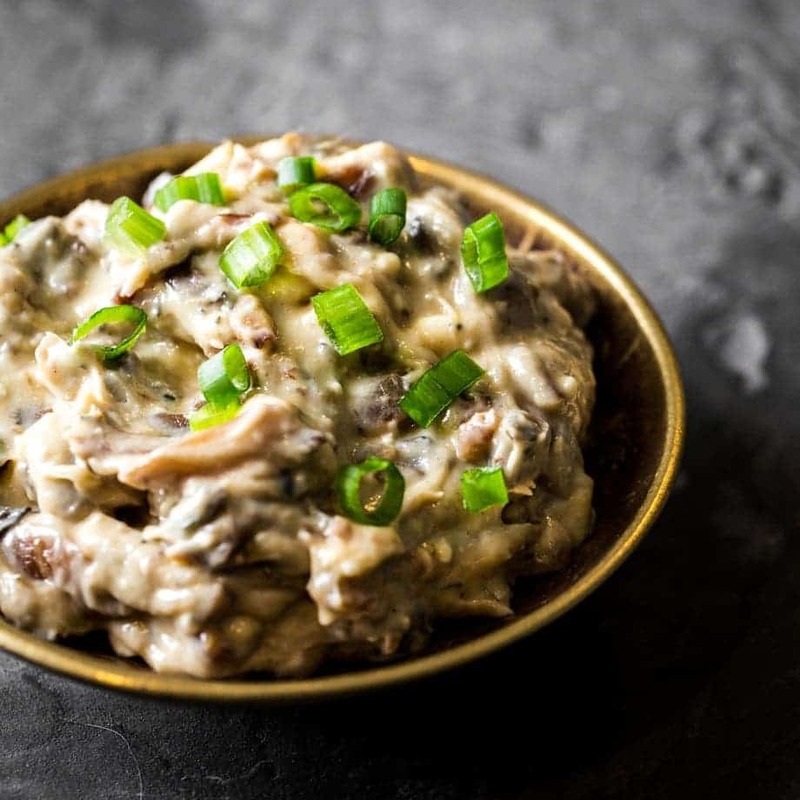 In case you forgot, we discussed how easy it was to add some basic ingredients to a slow cooker before you go to bed and by morning, you have creamy quinoameal, oatmeal or buckwheat meal. I made some buckwheatmeal recently by mistake and found out it tasted pretty darn good. 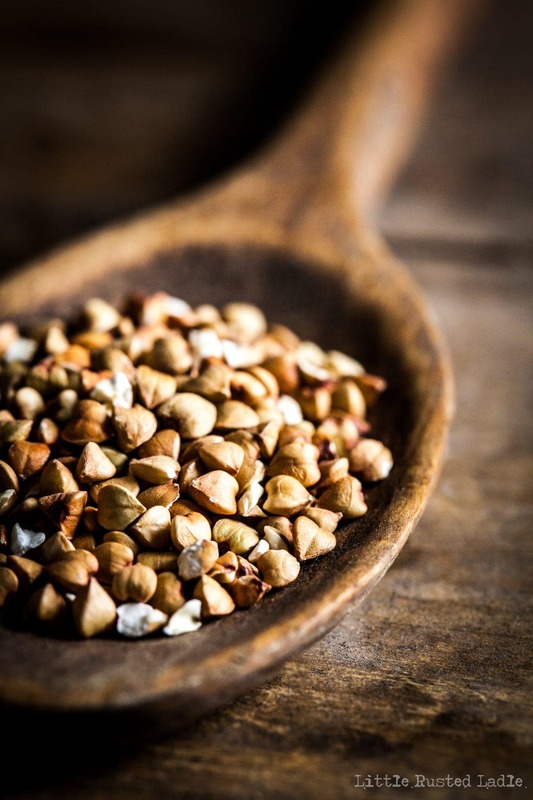 Buckwheat groats, when cooked like oatmeal, has a very hearty and nutty flavor. It’s also very filling. So I wasn’t surprised when I had some left in the crockpot. Leftover buckwheat meal does not reheat very well. 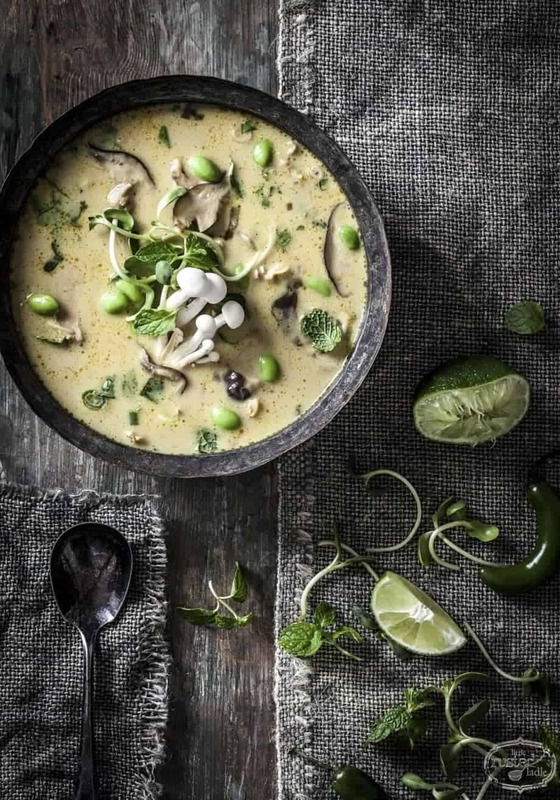 Once it cools, your more likely to have success using it as mortar for building a house, then enjoying a warm, creamy bowl of it. 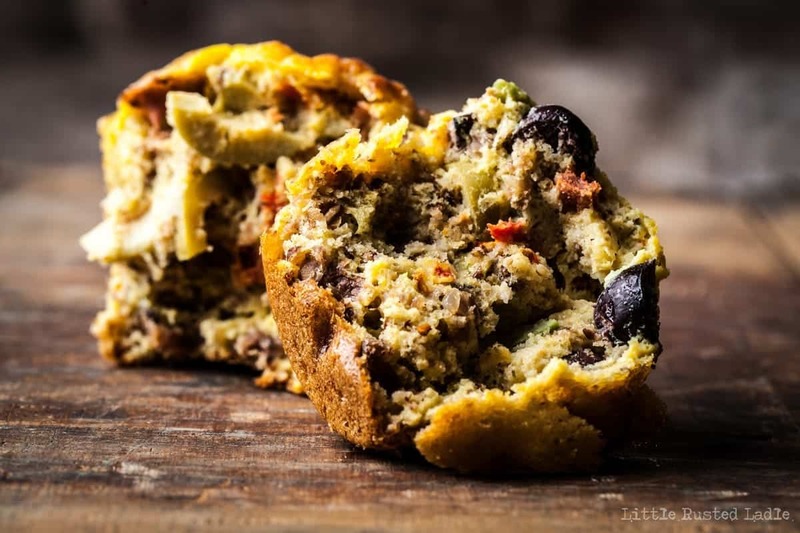 I was just getting ready to throw it away, when I thought to myself “self, why not add some eggs, and a few other ingredients, and make little soufflés with it?” A filling, healthy breakfast again sounded like a great idea. Especially since the outside thermometer was showing 5 degrees above zero. In the past, I would prepare individual egg strata’s for the kids in the winter. They are leftover cubed bread, eggs, cream, cheese, sausage and bacon. The mixture gets baked in small soufflé cups, then drizzled with maple syrup. They are in no way healthy. 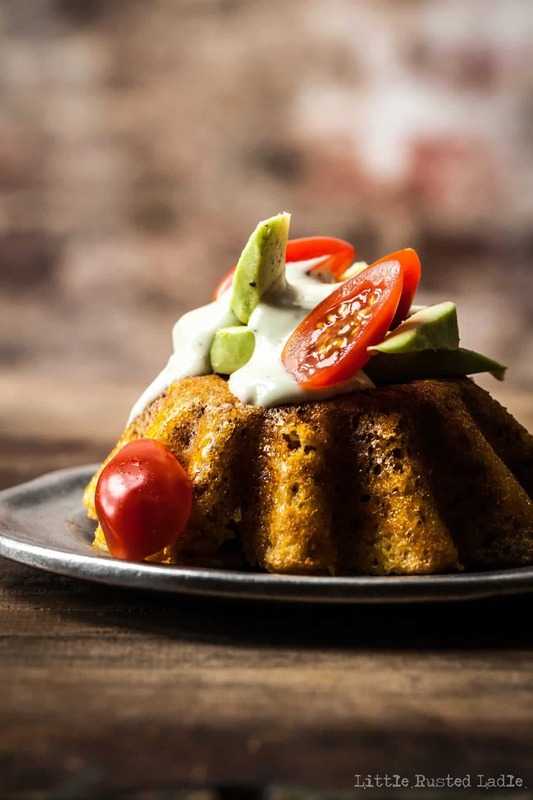 But what if the bread, cream, cheese, sausage and bacon were eliminated and replaced with ingredients such as brown rice flour,a little baking powder and a few other items that would give these updated stratas flavor without the fat or calories? Jena and I experimented with a few versions. We used ingredients like olives, fresh basil and sun-dried tomatoes for an Italian version. Green onion, cilantro, green chiles, pepper jack cheese and Mexican seasoning for that south of the border flair. Canadian bacon & pineapple for a Hawaiian treat. Generally, you can put anything you want in this mix, and it will workout. 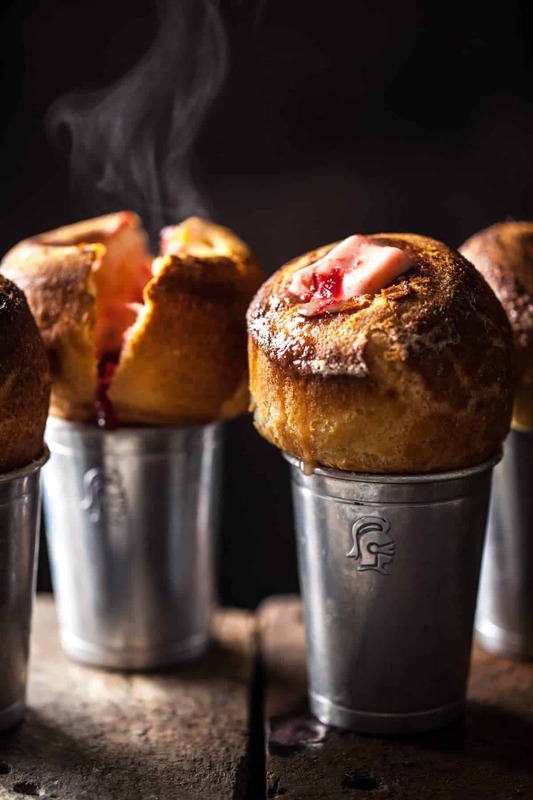 Spoon the mixture into well greased muffin cups or molds, then bake them in a 350 degree oven for about 20 minutes or until puffed and golden brown. Top with assorted coniments and enjoy. 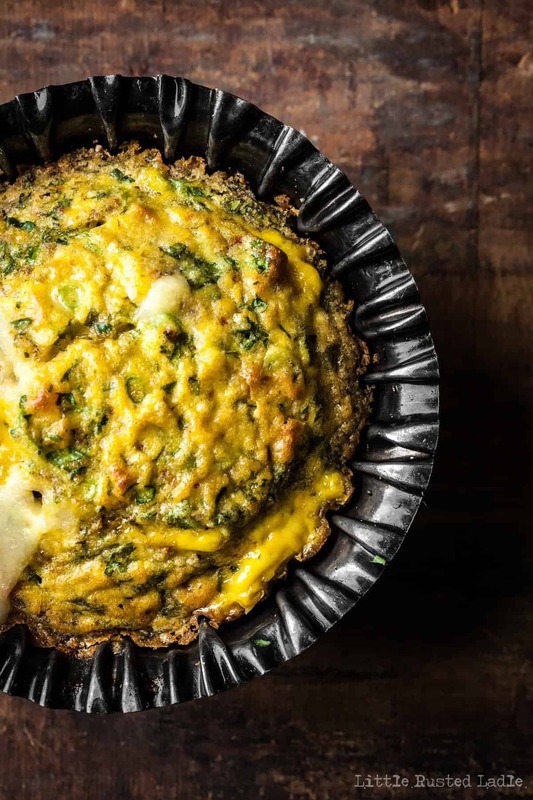 Sometimes, it just takes a little thought to turn a cardiologists nightmare into a healthy, satisfying and inexpensive breakfast or brunch treat that will keep your whole family full and happy. We’ll be back next week when our ancient grains go into snack mode. Until then, cook with love and live to cook. 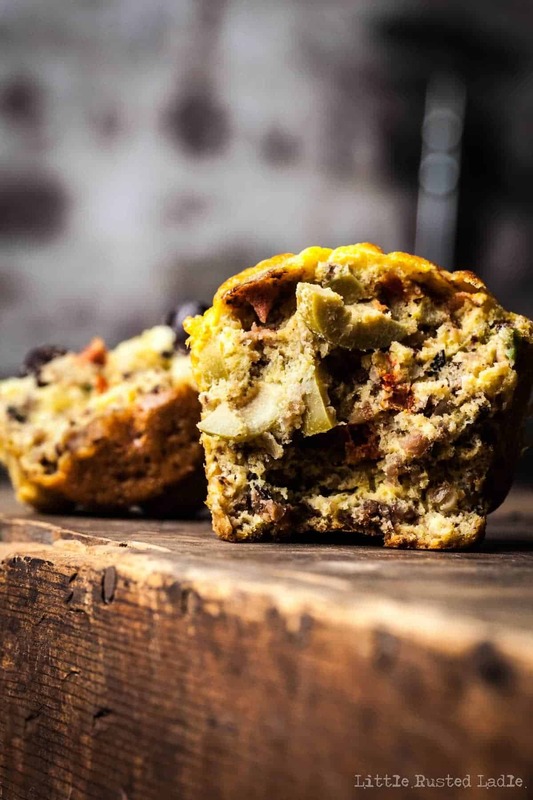 These protein packed egg soufflés are similar in texture to muffins, but without any gluten. It's a great way to use up leftover oatmeal or any grain meal you have leftover. Pre-heat oven to 400 degrees. Combine leftover meal and eggs in a medium bowl until well blended. Stir in rice flour, baking powder and salt until well blended. 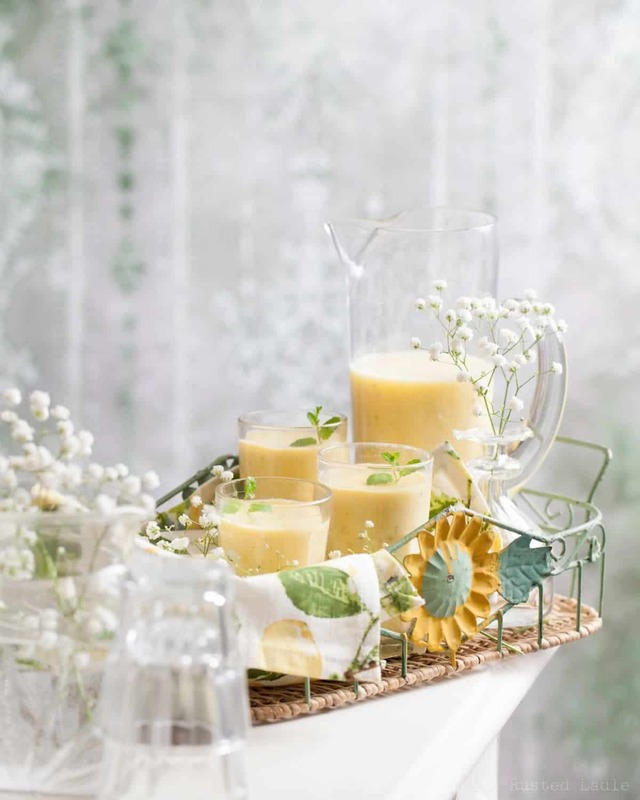 Pour mixture into well greased molds, soufflé cups or custard cups until half full. Add desired ingredients such as cheese, meat, veggies, herbs, or seasonings to each cup until almost full. 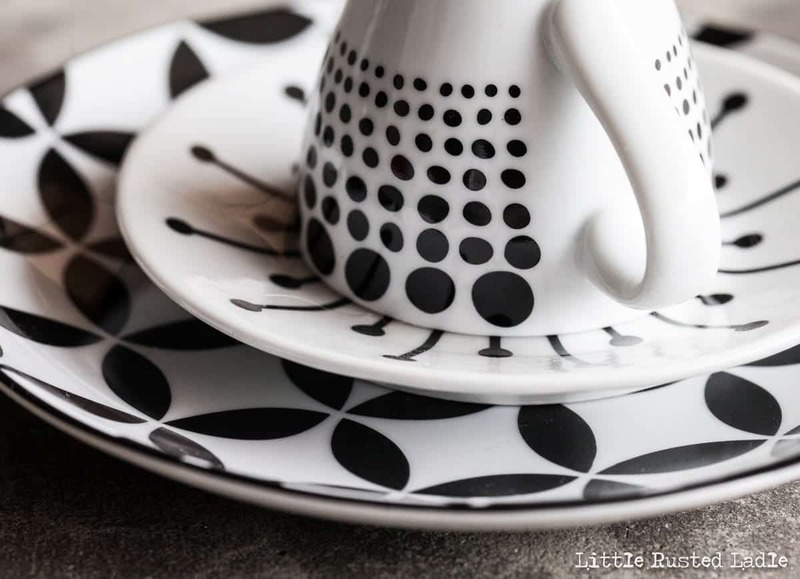 Place filled cups on a baking sheet and bake for 20-25 minutes or until cooked through and golden brown. Remove from oven and let cool until cool enough to remove. Run a knife around the edge if they stick. Serve. These can be made in advance, cooled and frozen until needed up to two months ahead. 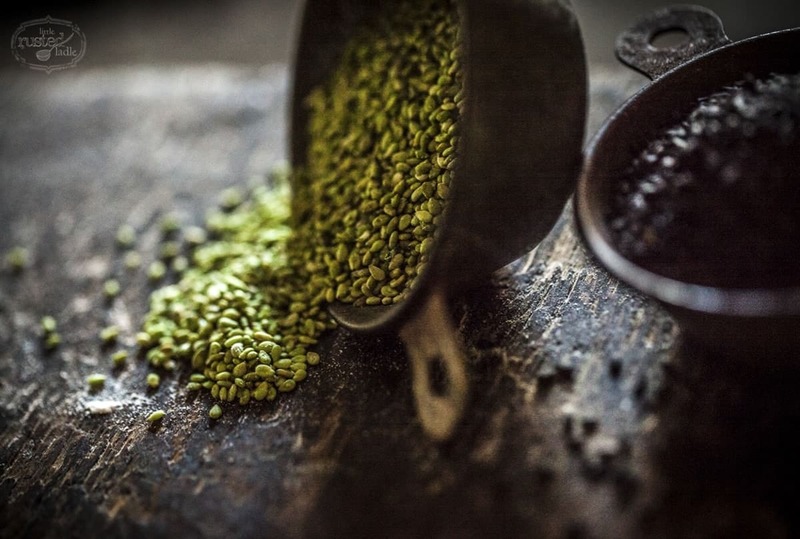 Ancient grains have been around a long time. I’m sorry, but that’s funny; of course they’ve been around a long time. You don’t get the title,“ancient grains,” unless you’ve been around a few hundred millennia. Those words have been showing up a lot lately. 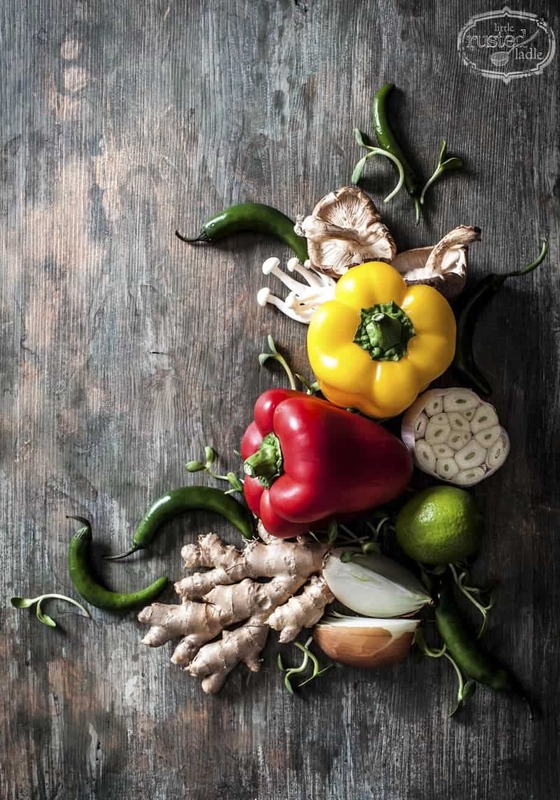 It’s kind of the new “all natural.” Food companies are throwing those words onto their products as a way of attracting those consumers who are looking for healthy options in the grocery store. 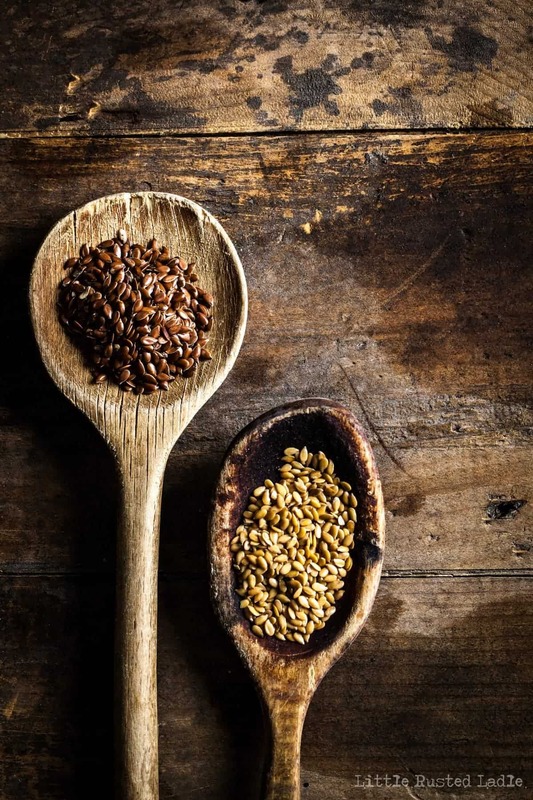 In order to understand whether “ancient grains” are good for us, we need to look closer at what is considered an ancient grain. 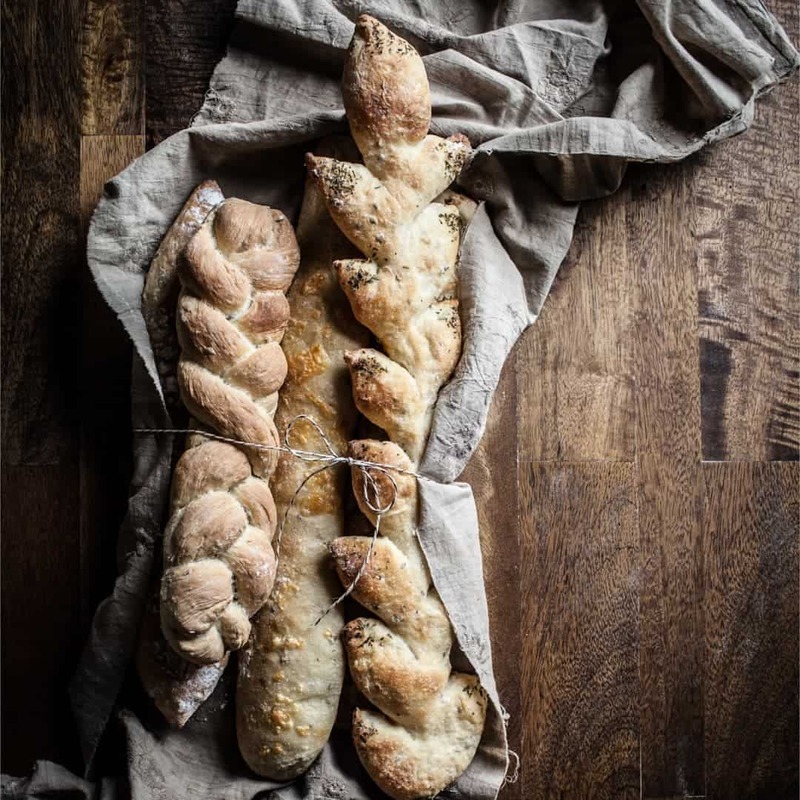 Basically, any grain that has gone unchanged for hundreds of years can be considered “ancient.” For example, einkorn wheat is considered ancient, but the wheat we get in products today is not because it has been bred, changed and altered over the years. 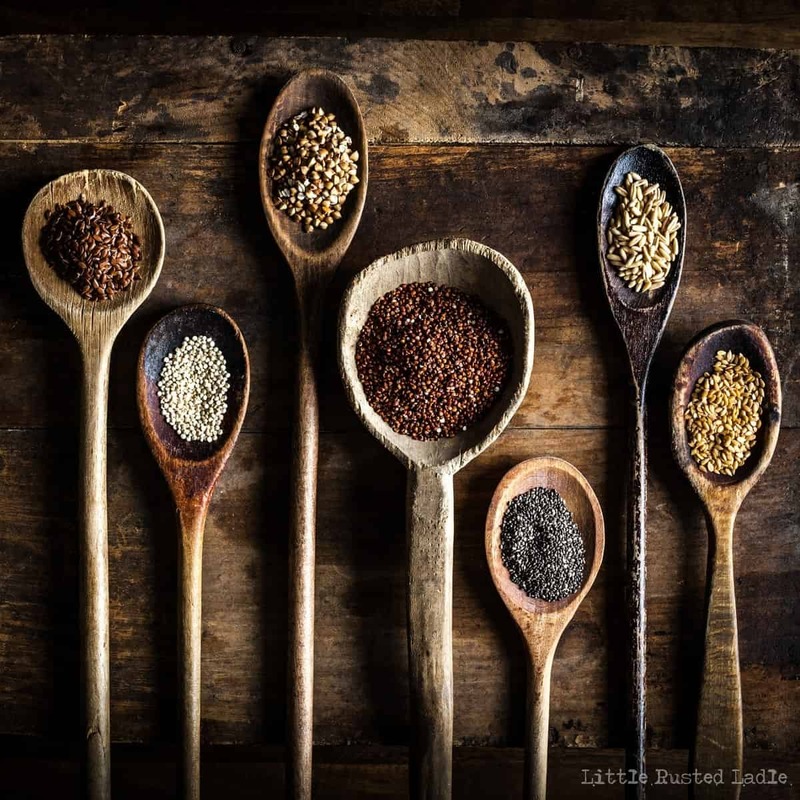 So, in general, things like barley, millet, amaranth, buckwheat, quinoa, oats, black, red and wild rice, farro, kamut, teff, and a few others are all considered ancient. Well, Jena and I decided to highlight a few of these ancient grains this month. Since many people out there, including myself, are supposed to be eating a more healthy diet due to those annoying New Year’s resolutions, we should of course be interested in these grains. Funny, I don’t remember seeing any ancient grains in those blood orange margaritas or the Chicago style hot dog I had last week during my week of food debauchery. Oh well, I’m sure they were there or I wouldn’t have ordered them. We are starting the month of February off with a basic recipe for crockpot oatmeal that I’ve been using for about two months. I love crockpot oatmeal, because you put all the ingredients in a small slow cooker at night, before you go to bed, and when you wake up, you are greeted with the wonderful smell of fresh oatmeal and everything you decided to embellish it with. Personally, I like apples, cinnamon, maple syrup and walnuts. It tastes like apple pie. Yummy!! Because it takes about seven hours to cook completely, it becomes necessary to plan this in advance. I’m not always big at planning and sometimes just want to eat. I came up with a good alternative: using quinoa instead of oat groats (the whole version of oats) for the oatmeal. I guess you could call it quinoameal. 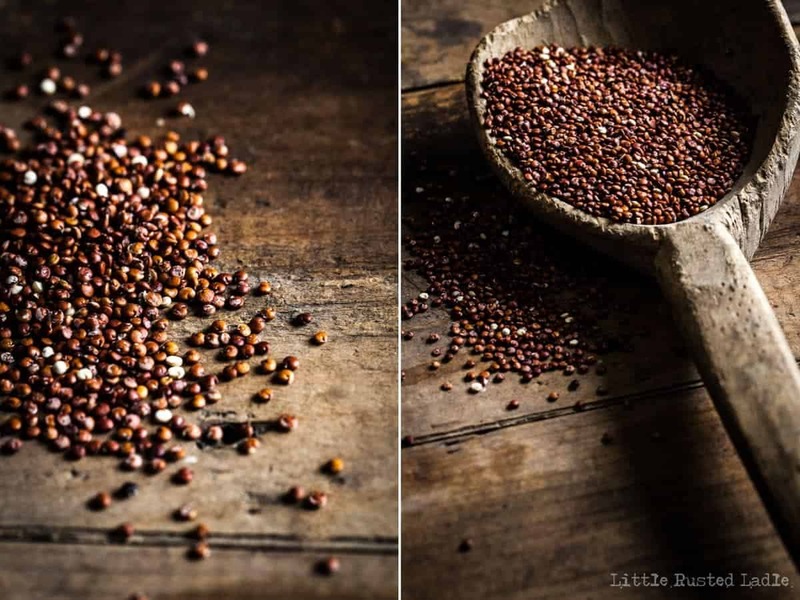 Quinoa, which comes from the Incas in India, cooks quicker than oat groats or steel cut oats. In fact, it cooks similar to cous cous, another ancient grain, which cooks in about five to ten minutes. We used a Bob’s Red Mill Tri-Color Quinoa, which has a nice color and taste to it. Feel free to use whatever quinoa you prefer though. 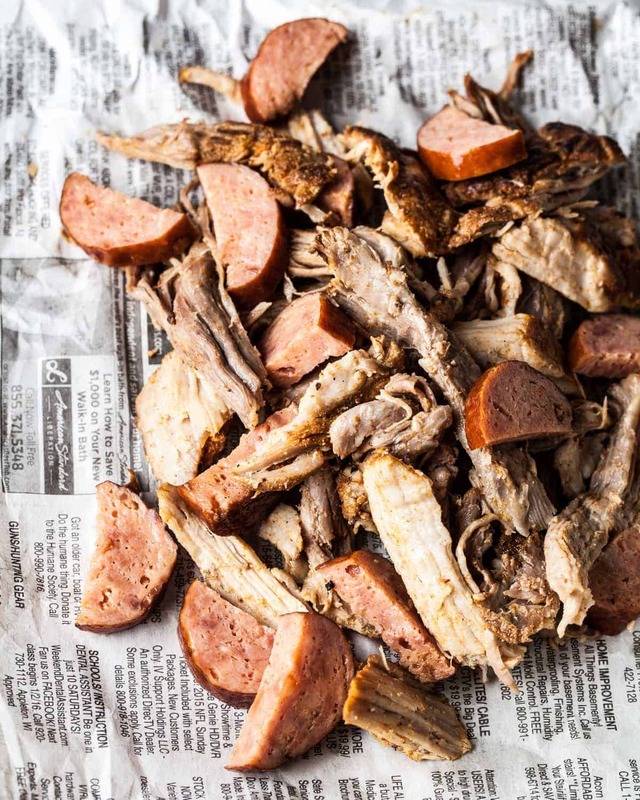 Simply add all your ingredients to a small crockpot. One part quinoa, two parts liquid. I used a combination of almond coconut milk, water and apple cider because I love apples, and dairy is not nice to me. However, you can use water or regular milk instead. Maple syrup, cinnamon, a pinch of sea salt were added, as well as some chia and flax seeds to boost the protein. I skipped the nuts, but feel free to add almonds, pecans or walnuts. They are all tasty. Stir up the mixture with a spoon, cover and cook for about one hour on high or until the quinoa has been soaked up and is cooked through. One last stir and you have a delicious alternative to oatmeal. 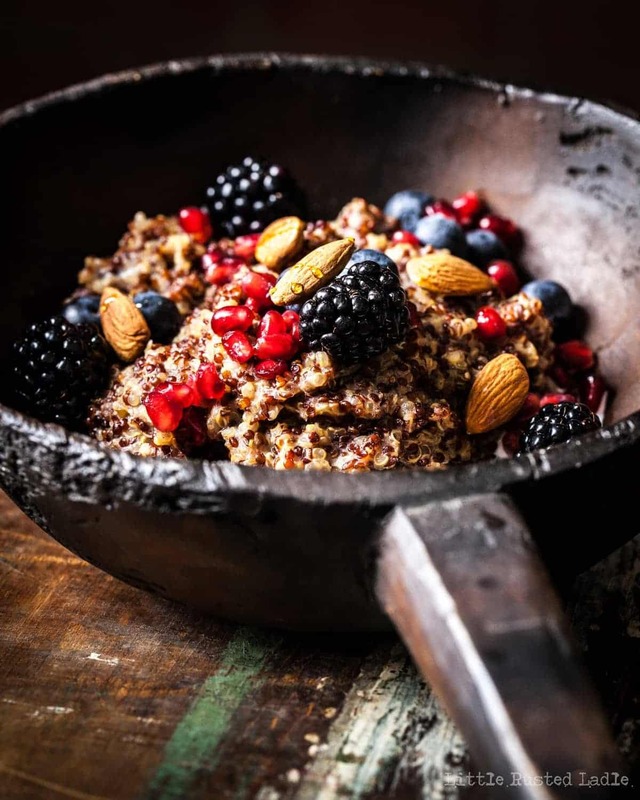 Top with fresh berries, a little cream and a drizzle of honey or syrup and a few pistachios and you’ve got a delicious, healthy breakfast that took you five minutes to make and cook as long as it took me to write this article. Thanks to being a hunt and peck kind of typist, that means about an hour and some change. Of course you can make it much quicker if you make it on the stove top or in the microwave. That’s your choice; don’t sweat it. So you say you don’t like quinoa? No problem, the recipe below works with oats and buckwheat too. There, now you can say you know how to cook with ancient grains. It will make you sound smart in front of your kids and friends. 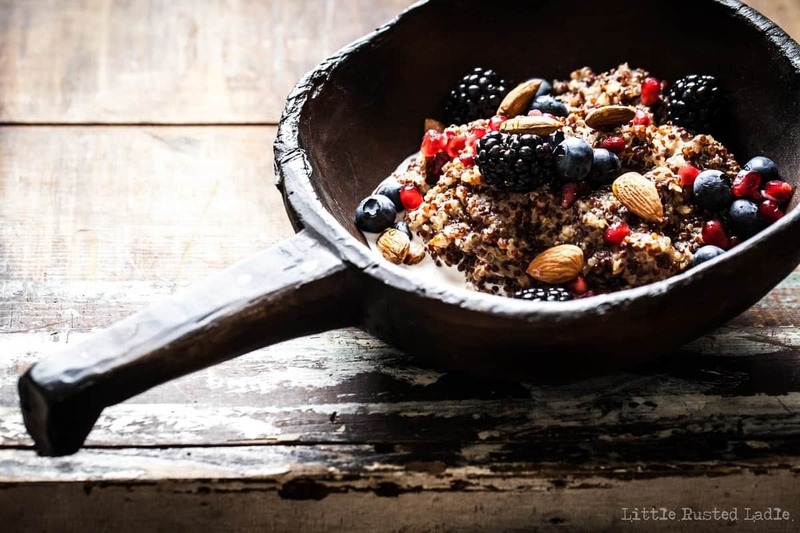 Plus, it will make you feel better following that night of chicken wings and beer with a nutritious breakfast of ancient grains, fruit and nuts. See you next week, when Jena and I will show you what to do with that oatmeal/quinoameal/buckwheatmeal you have left over from this week. Enjoy and don’t forget to cook with love and live to cook. 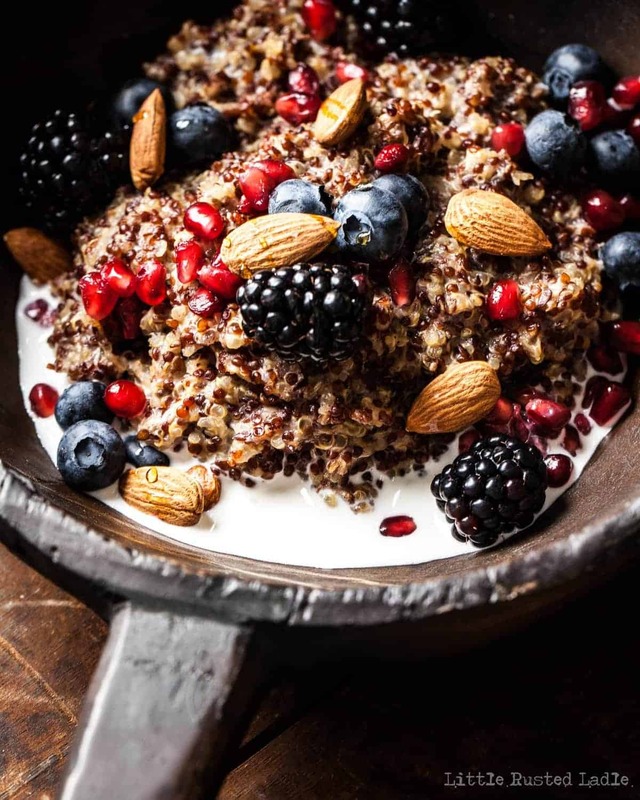 This slow cooker quinoa recipe is great for those looking for a healthy breakfast, but might be sick of oatmeal. Combine all ingredients in a 2 qt. slow cooker. Stir to combine. Cover, then set cooking level knob to low. Cook for 7 hours or overnight. Stir mixture. Spoon into bowls and sprinkle with fresh fruit, nuts or a little cream, a drizzle of honey and butter. Serve. 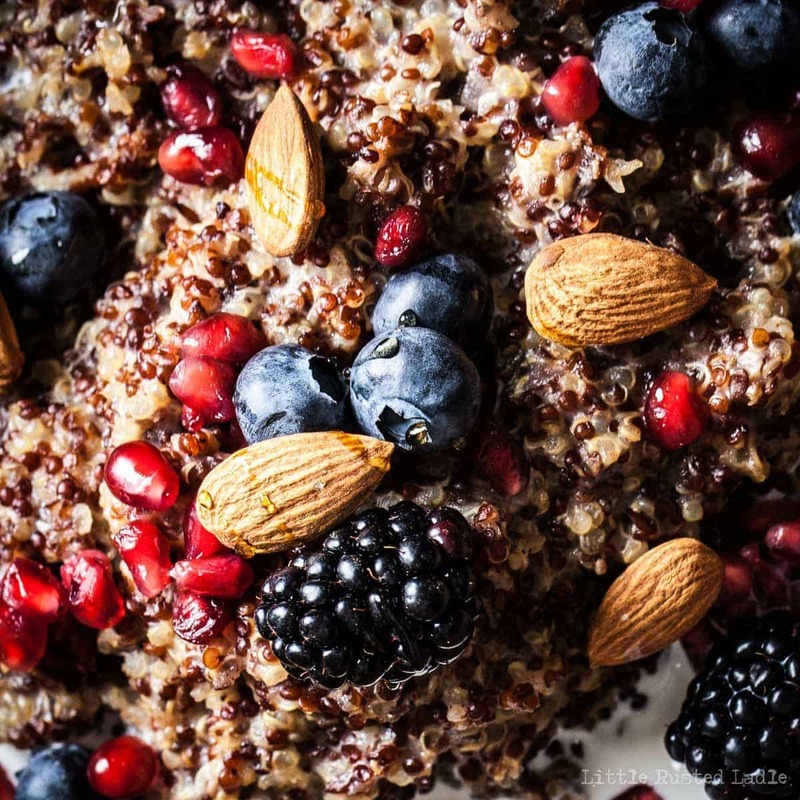 You can substitute oat groats, steel cut oats or buckwheat groats for the quinoa. Brown sugar, raw sugar or maple syrup can also be drizzled on top. Parsnips are so great that we decided to do another article about them. That and maybe we’re feeling a little guilty that we haven’t been posting recently. Also, we have this really cool gadget that we are giving away. 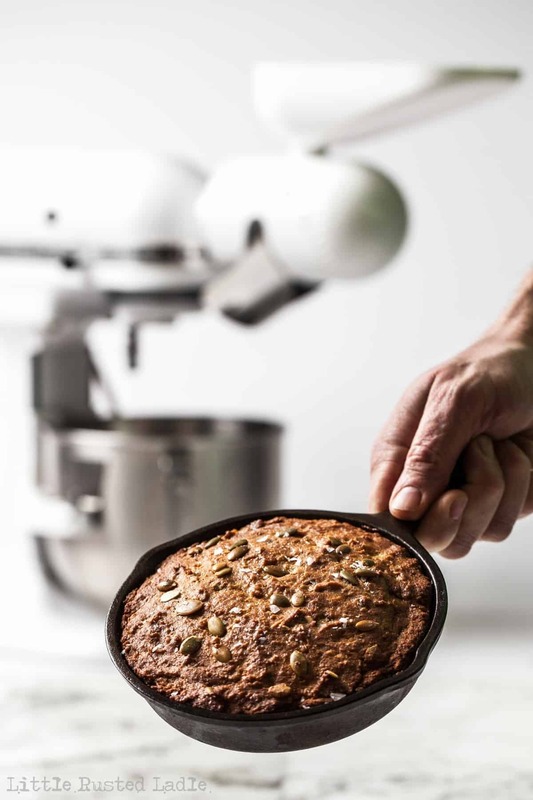 Since you have probably already looked at the photos(I would too), I guess I can discuss the fancy gadget we used for this articles parsnip recipe, which is parsnip and pumpkin seed bread. Awhile back, I started eating healthier and began thinking about getting a grain mill for grinding my own flour. Since most of the flour today doesn’t contain much nutritional value, and even store-bought products labeled “whole grain” usually aren’t, I thought I’d look into it more. A client of mine grinds his own wheat, and said the quality of bread made with flour ground from whole wheat berries is far better than any commercial bread. About the same time, the wonderful people pleasanthillgrain.com asked if we could review a new product they carry called the Mockmill for Kitchen Aid mixers. Mockmill is known for making very high quality grain mills. It sounded like a match made in heaven. I was looking for a grain mill and they had one to review. The best part is that this new product attaches to a standard Kitchen Aid mixer. Simply attach the mill to the front, add wheat berries, corn, rice, etc.. to the hopper on top and turn on the mixer. Out comes your own home ground flour. You can also adjust the size of the grind from coarse to fine. Milling my own whole wheat flour made me feel like an amish farmer. Next thing you know Jena and I will be wearing straw hats and riding in a horse drawn buggy. O.K., maybe not, but the Mockmill is easy and fun to use. I experimented with the mill by making cookies, crackers and bread. What I found out was there is a learning curve with using fresh ground flour that takes some time to get used to. It’s a little too technical for this article, but maybe in the future we can do an article just on home milled grain. Regardless, I’m very happy with my new Mockmill for Kitchen Aid. It’s great knowing where our food comes from. Flour was one of those ingredients that you just never know. Until now that is. Would I recommend a grain mill to grind your own grain? You bet. I bought twenty pounds of Einkorn wheat berries to prove it, which are the first plants to be domestically cultivated, dating back over 10,000 years ago. How awesome is that? 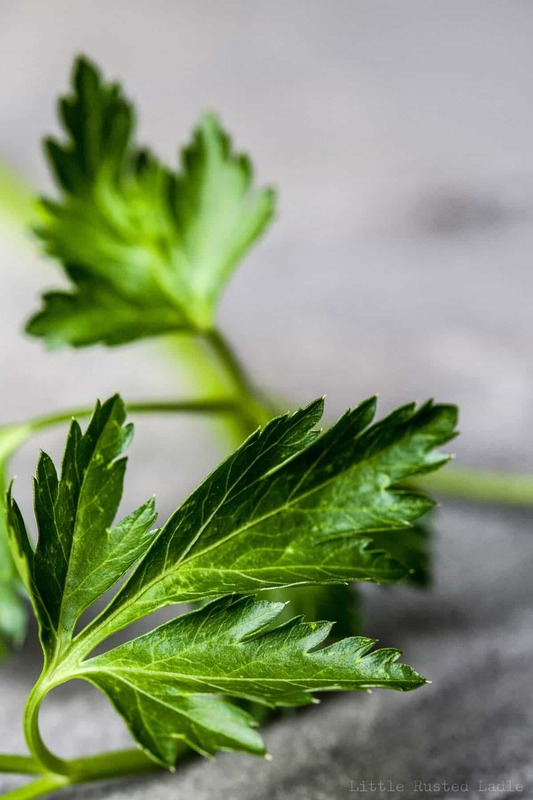 The recipe chosen for the second part of our parsnip and parsley root series is a delightful parsnip bread. Sweet parsnips, brown sugar, eggs, yogurt, carrots, and of course whole wheat flour are the foundation. I decided to make it and substitute some whole wheat flour that I ground in the Mockmill. The bread is sweet like banana bread, but has a nice nutty, full flavor from the whole wheat that diffuses the sweetness. Added pumpkin seeds gave it a nice crunch, while the addition of a little sea salt and melted butter on top really made it all come together. I used 2 cups of cooked parsnips that we used to make the soup from our Parsnip and Parsley Root Bisque article a couple of days ago. It’s a great way of doing the prep for two recipes at once. Cooking the parsnips in the milk and broth gave added flavor to the soup, and the liquid also flavored the parsnips better than cooking them in water. Since Jena and I like to mix it up a little, we decided to make the bread in a cast iron skillet. Feel free to use any kind of pan you’d like. Remember, it’s a quick bread, which uses baking soda instead of yeast to make it rise, so it works in just about any kind of pan you want. We even made some in small mason jars that were cute as a button. 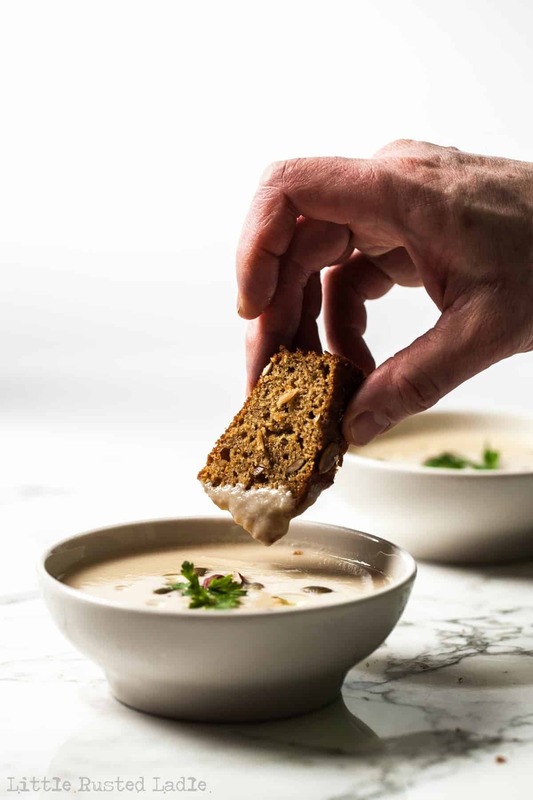 I love parsnips and I’m sure after trying this bread and our soup, you will too. As far as the Mockmill goes, I find it very useful and fun, as well as being a great way of Getting added nutrients to my food. It’s so fun, I’m headed to the kitchen to get some more bread going. Now for the fun part. 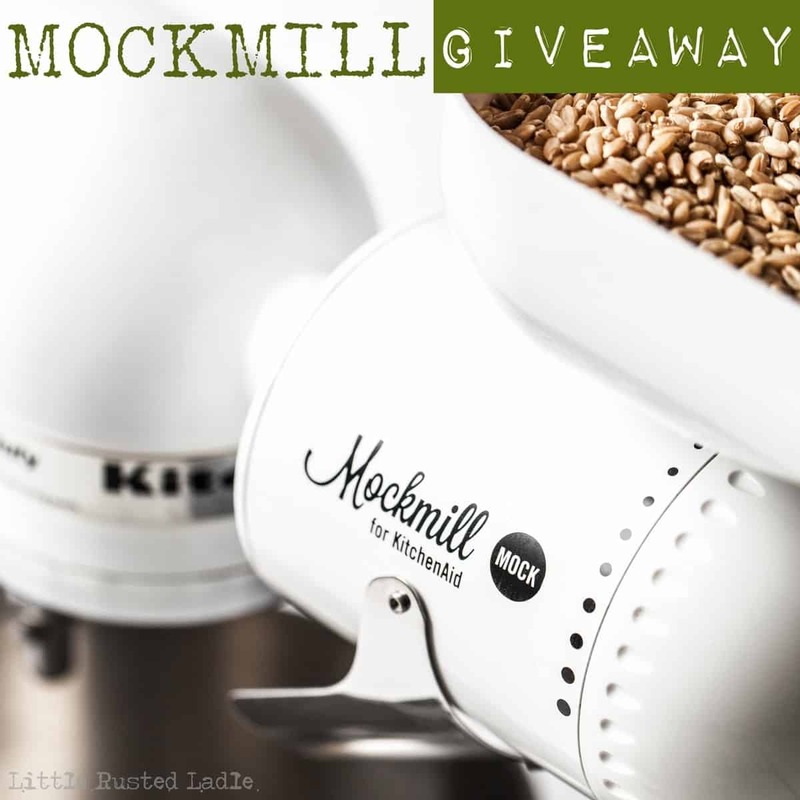 Here’s your chance to win a Mockmill of your own thanks to Pleasant Hill Grain. Simply fill in the entry form below by Friday January 15th. One winner will be chosen, and you will be sent a new Mockmill valued at $199.00 free of charge. It’s January, which means diets and exercise. Adding home ground flour to your cooking will give added flavor and nutrition to your breads, polenta, and custom flours. Until next time, remember to cook with love and live to cook. This wonderfully sweet quick bread gets a lot of it's sweetness from parsnips and carrots. Using fresh ground whole wheat flour adds a great full, nutty flavor that really balances the bread nicely. Pre-heat oven to 350 degrees. Spray a large bread loaf pan with non-stick cooking spray. In a large bowl combine flour, sugar, salt and baking soda. In another medium bowl, combine butter, yogurt, eggs, parsnips, carrots, and pumpkin seeds. Add wet ingredients to bowl of dry ingredients and gently stir until combined. Spoon batter into greased pans and sprinkle with additional pumpkin seeds if desired. Bake for 50-55 minutes or until a toothpick inserted in center comes out clean. Brush with melted butter if desired and sprinkle with coarse sea salt. Serve with parsnip and parsley root soup. 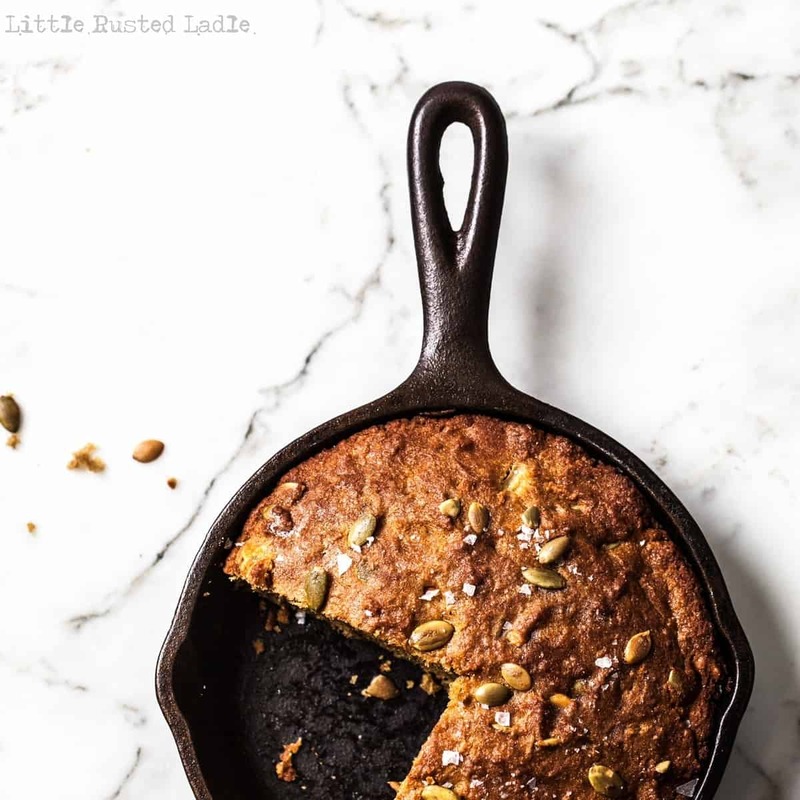 For a different twist, batter can be spooned into small cast iron skillets, or small mason jars. Reduce baking time if the pan used is smaller than a bread loaf pan. These Vegetable Chips can’t be Beet! You either love em or you hate em. That seems to be the reputation with beets. I was a hate em kind of person, then when I got older and suddenly loved them. I must have swapped out taste buds and the new ones were not told to hate beets. Maybe it was because they became a trendy vegetable. 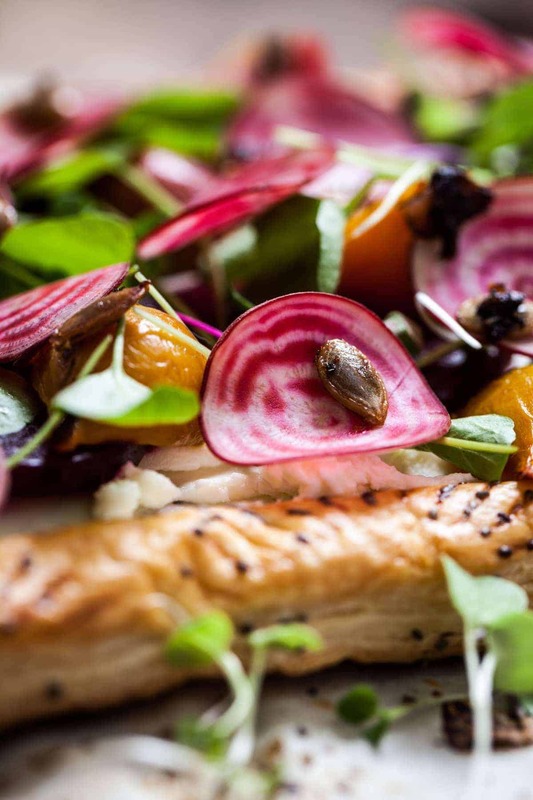 It seems every restaurant in America has a salad with beets and goat cheese these days. Little Rusted Ladle is all about being trendy (slight chuckle), so I thought I’d do my part and give them another try. Low and behold, I liked them. Of course, when paired with goat cheese, greens and nuts, it takes the pressure off the beets to be yummy on their own. There are many health benefits to beets that may sway some of you beet haters, who shall remain nameless, into giving them another go. For one, beets are great at detoxifying the body and purifying the blood, which is a great way to battle those pesky hangovers. They are also a really great source of naturally occurring nitrates, which help lower blood pressure. 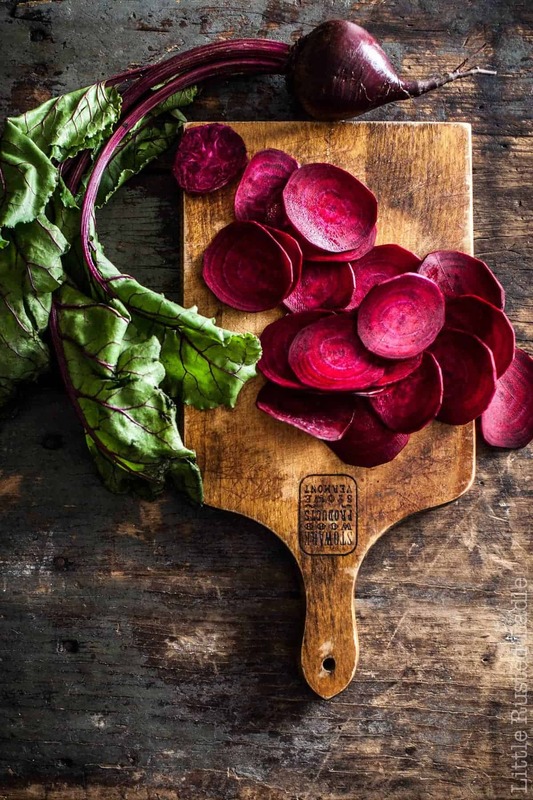 Beets also help increase stamina, and have been considered an aphrodisiac for centuries because of this fact. They also help fight inflammation and have cancer fighting properties, so in a way, beets can’t be beat. There are many ways of preparing beets. Beets can be boiled, steamed, baked, roasted, grilled or sautéed. 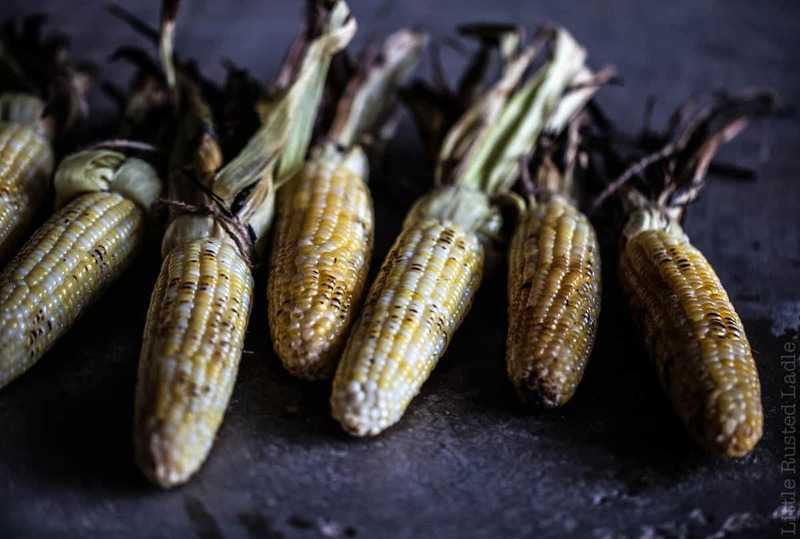 One of our favorite ways to prepare them, like corn on the cob, is to simply cook them in simmering hot water, peel them and cut them into pieces and toss them with some butter and salt and pepper. 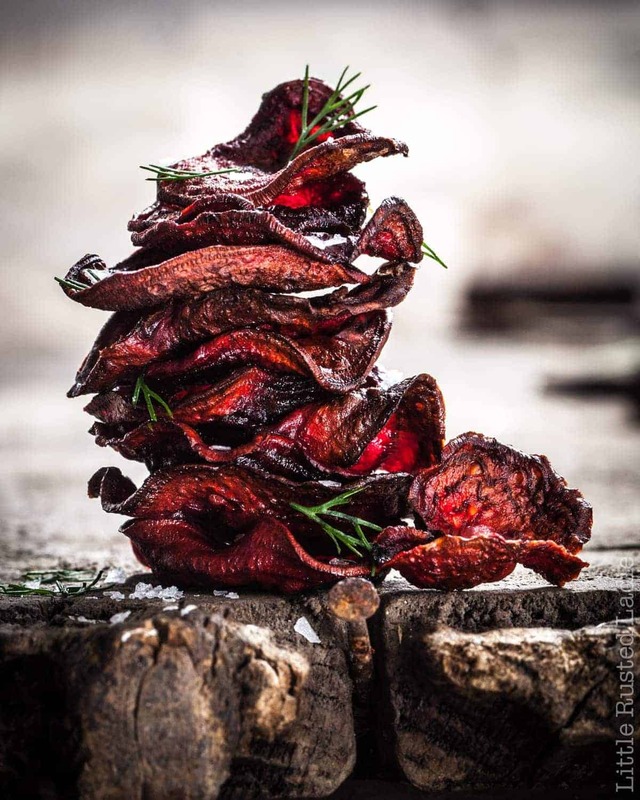 However, another very basic way of preparing them is to make beet chips. Thinly slice them on a mandolin, but make sure to use a safety guard, or you’ll end up with shorter fingers. Toss the slices with a little olive oil and sprinkle with salt. Place them single layer on cookie sheets lined with foil and bake them for about 40 minutes or until crisp. Sprinkle them with some chopped fresh dill and you’re good to go. The end result will be a beautiful pile of tasty chips that are tasty and good for you. Enjoy and remember to cook with love and live to cook. 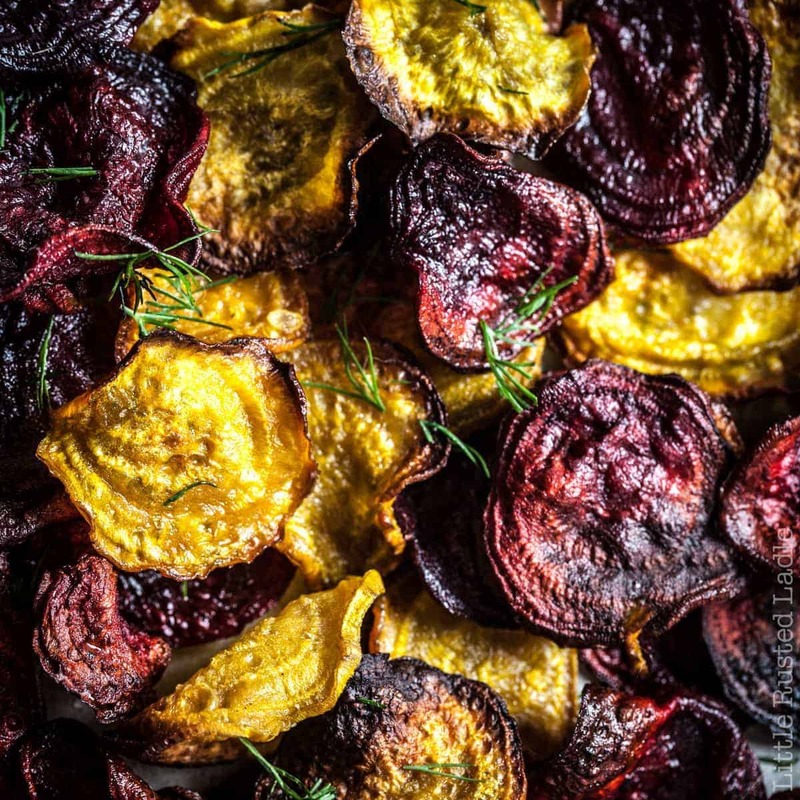 Traditionally prepared beets may not turn you on, but these beet chips may do the trick in more ways than one. 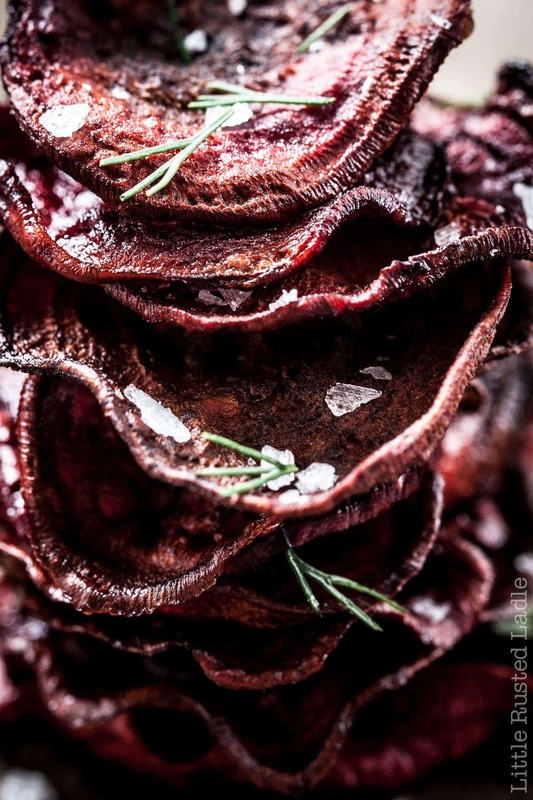 Place beets in a single layer on foil lined cookie sheets. Drizzle with olive oil and sprinkle with coarse sea salt. Bake for about 20 minutes, then turn beets over and bake another 20 minutes or until crisp. Transfer to a rack and cool completely. Sprinkle with chopped dill and serve. For a fun play off of the classic soup borscht, serve them with seasoned sour cream or greek yogurt. The perfectly lined up rows of golden kernels shimmer in the afternoon sunshine like pearls, as I peel back the squeaky green husks exposing the ever familiar site of sweet corn. Hidden behind the green husks and silk that gives these golden gems life are more than just small nuggets of sunshine. They’re a reminder to me of everything that is good. 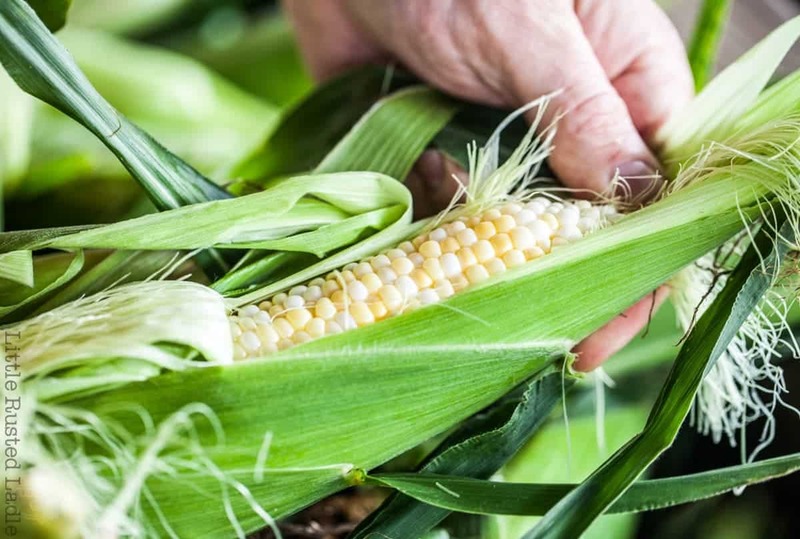 Childhood memories of eating ear after ear of fresh picked sweet corn at the family dinner table with my mom, dad, sister, aunt and uncle, invade my thoughts like a kid waiting for summer break. You see, sweet corn season was not just another vegetable that we ate during it’s peak, it was usually the main course. My dad would get 4 or 5 dozen ears of corn picked early in the morning from the field. He would cook them in a large kettle of boiling water, then pile them high on a huge platter in the center of the table much like a turkey on Thanksgiving Day. Everyone would look at the platter, visually picking out the ear they most wanted. This was usually the same for all of us. We wanted the ears with the smallest kernels. These young ears tend to be the sweetest. Many people overlook these small-eared gems, instead, going for those with the big kernels. Amateurs! Our corn eating ritual was unique. We would each have a paper bag next to us on the floor to drop the empty ears into. The sound of an ear falling into the bag was a reminder to the rest of us that someone would be grabbing another prime ear of sweet summer. It was not uncommon for us to go through six to eight ears of corn a piece. 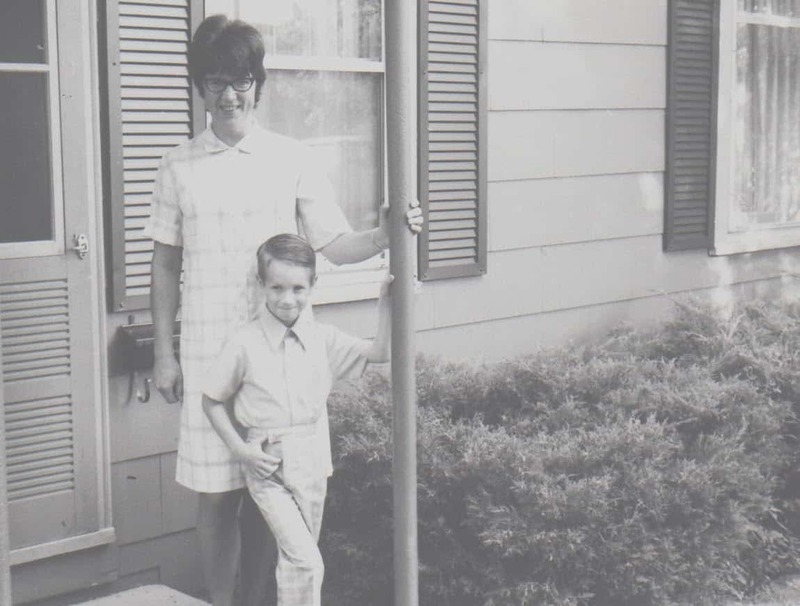 My personal best was 11 – not as impressive as my aunt Cille’s record of 13, but not bad for a teenager. Of course, there also were those other wonders of summer at the table, but when there was fresh sweet corn, everything else was viewed as a “side.” Brats, burgers or sliced round steak made their way to our plates, along with fresh sliced tomatoes from the garden and cucumber salad. No store-bought deli items found their way onto a table in our house. Summer meant enjoying the bounties from our own garden. Corn was the exception, because we were not able to grow it, but it didn’t come from a grocery store. As I grew up and started raising my own kids, I often wondered where was I going to get corn as good as dad got every year. Then, on a trip back home to visit my parents, I got my answer. The sign by the side of the road said “Skelly’s”, with the words “sweet corn” next to it. I had friends tell me it was good, but being a pro corn eater, I knew what “good corn” was really like. Much to my amazement, it was actually better than I remembered as a child. The flavor was so sweet and the kernels were so tender. Plus, unlike my memories as a child who had to “shuck” his fair share of corn, there were no worms on the ends. There was nothing worse then opening up an ear of corn and finding worms crawling around the kernels. It often would ruin the mood so to speak. Recently, Jena and I took a trip to Skelly’s and talked to Scott Skelly about what makes their sweet corn so good. Scott’s family has been farming in the Rock County area since the mid 1850’s. 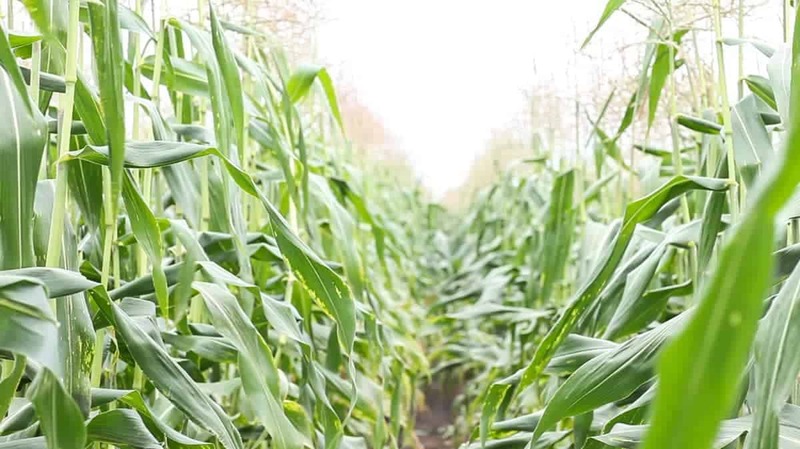 Their venture into growing sweet corn started by planting a few rows near their farm house as a way for the kids to make a little extra money for college. The corn was sold at a vegetable stand out front like many rural farms do. However, it sold so well, they needed to plant more each year. 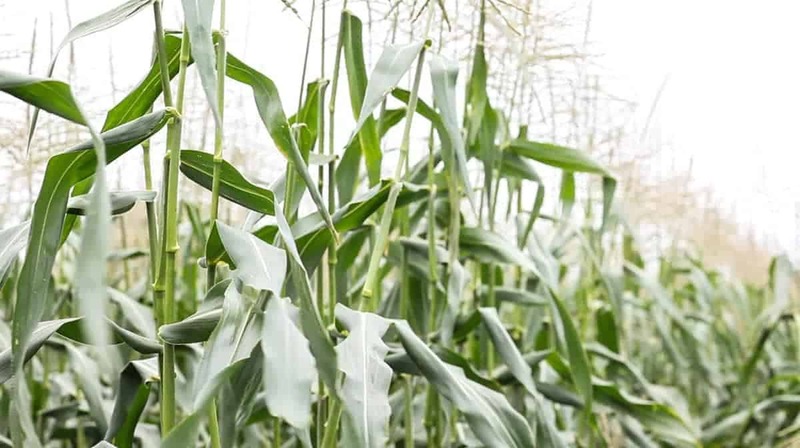 The sweet corn business is so successful today that their corn crop alone takes up over 100 acres of land. That’s a lot of corn. 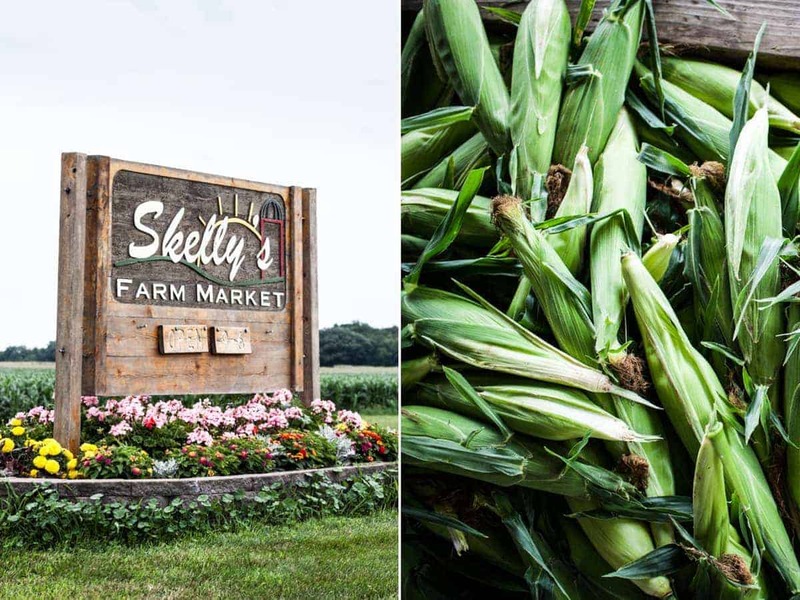 To see where Skelly’s corn, as well as their other wonderful produce are sold, check out their website Here. They also have killer products like apple cider doughnuts and cider coming up soon. Skelly’s test plants dozens of varieties every year. From these test plants, the family chooses the best ones. What’s really great about Skelly’s corn and many small local farms like them, is that they don’t skimp on quality. 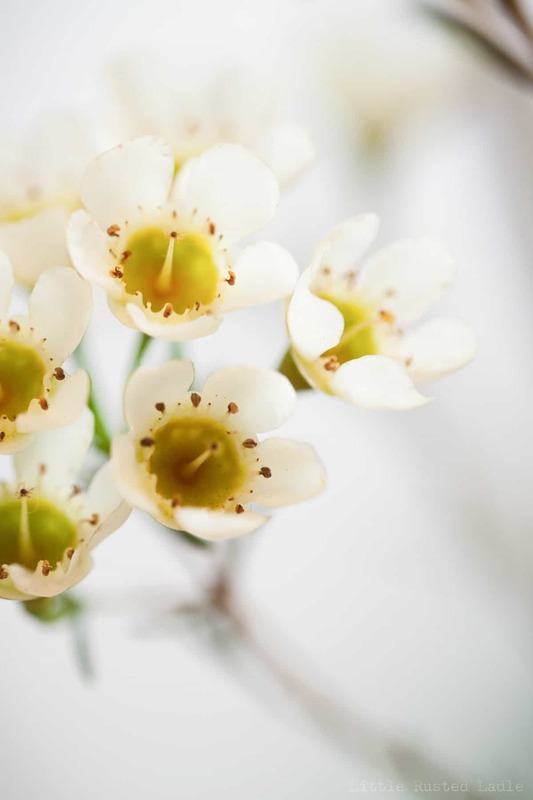 They would rather grow the most tender and sweet varieties instead of choosing varieties that stay fresh longer, but lack tenderness. 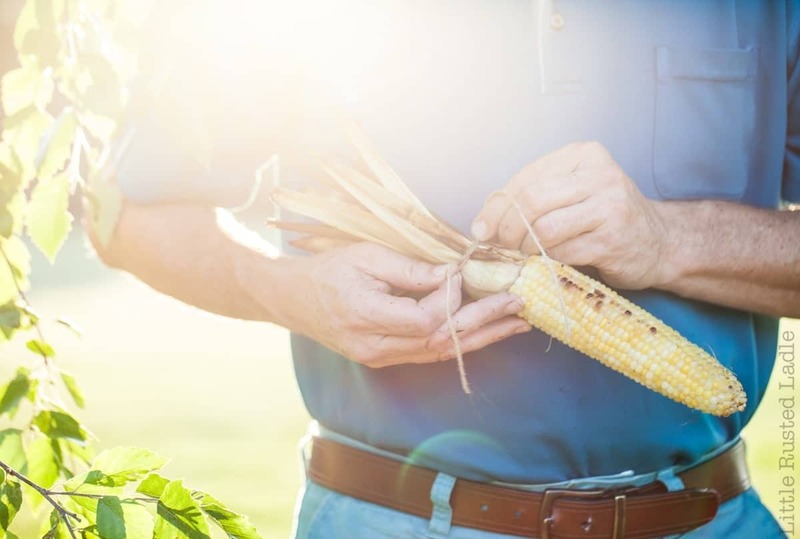 Much of the sweet corn you find in the grocery stores, especially corn found in the offseason, comes from distant farms, and has a tougher kernel. 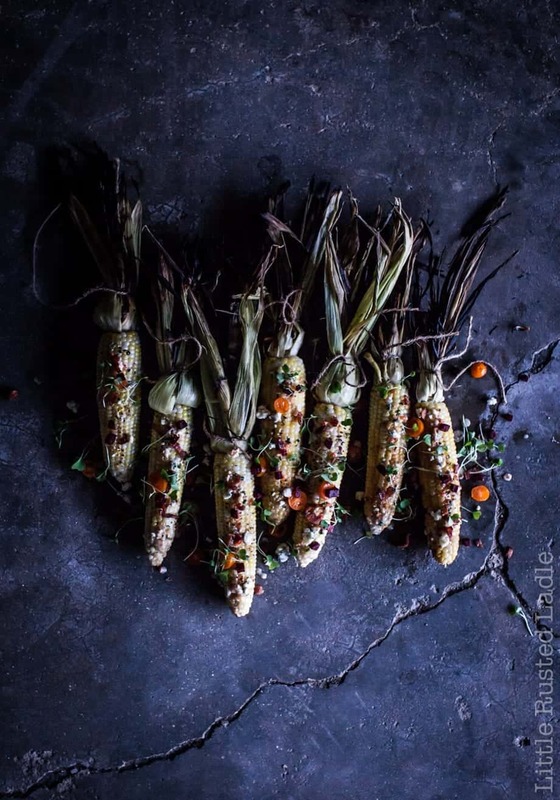 How tender is Skelly’s corn? 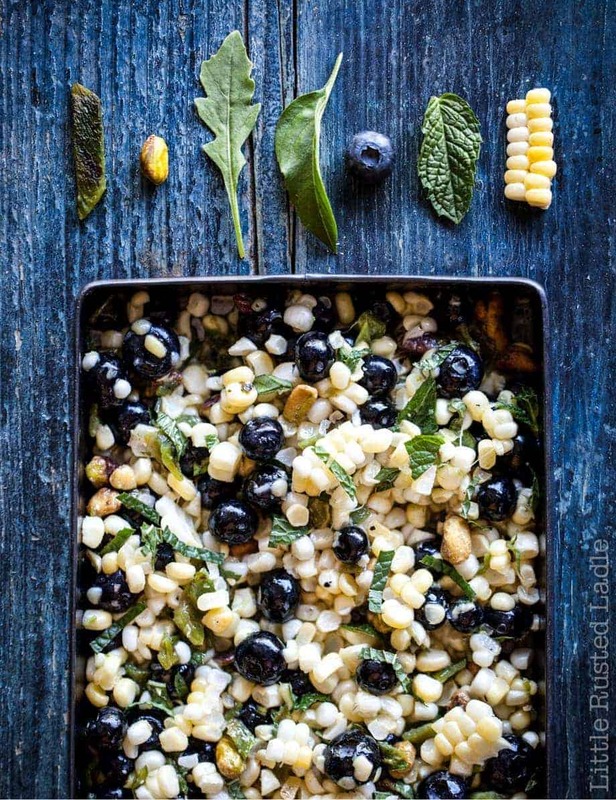 Well, the blueberry corn salad we’ll be posting next week is made with uncooked corn. It’s so sweet you don’t need to cook it. I think what I enjoy so much about sweet corn season, is the fact that you need to get your hands into the action when preparing it. Grabbing a bag and husking a dozen ears of corn reminds me of where it came from. A plant, grown on a family farm much like Skelly’s. Notice how peeling back the husks entices your sense of smell. Feel the bumpy kernels as you peel off the layers. See and appreciate the perfect yellow and white rows. Listen to the sound of the corn hitting the grill or the boiling water as the ears are lowered into the pot. All these sensory stimuli prepare us for the final experience; eating it. I envision my ancestors from generations past doing the same thing. It’s a good feeling. 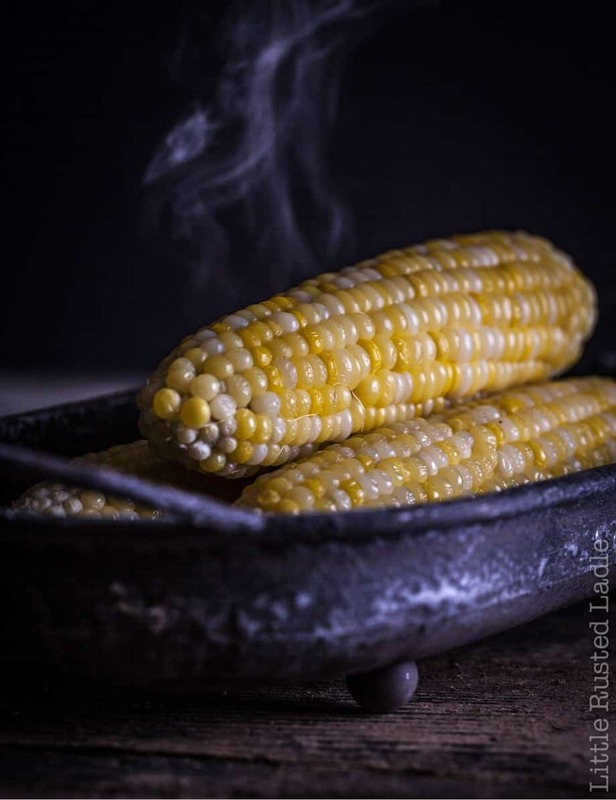 The recipe shown in the video is pretty tasty for an occasional change, but my favorite way to enjoy corn on the cob is probably the simplest way…with butter and a touch of salt…just like back in the day. As always, remember to cook with love and live to cook. 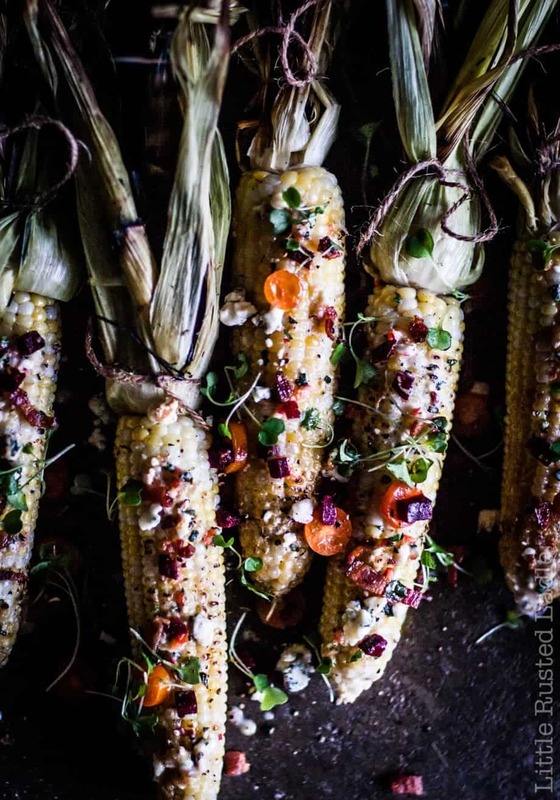 Sweet corn gets a major overhaul with this recipe with the addition of a flavored butter, bacon, tomatoes, beets micro greens and a drizzle of pistachio oil. You may not look at corn the same way. 7 ears sweet corn, most of husks and silk removed then tied closed with string. Soak tied corn in a large pail or pot of cold water for 1-2 hours. Meanwhile, make sweet blue butter by following directions in the recipe below. Drain corn well and pat dry. Place on preheated grill, cover and cook for 15-20 minutes over medium heat, turning every 5-7 minutes. 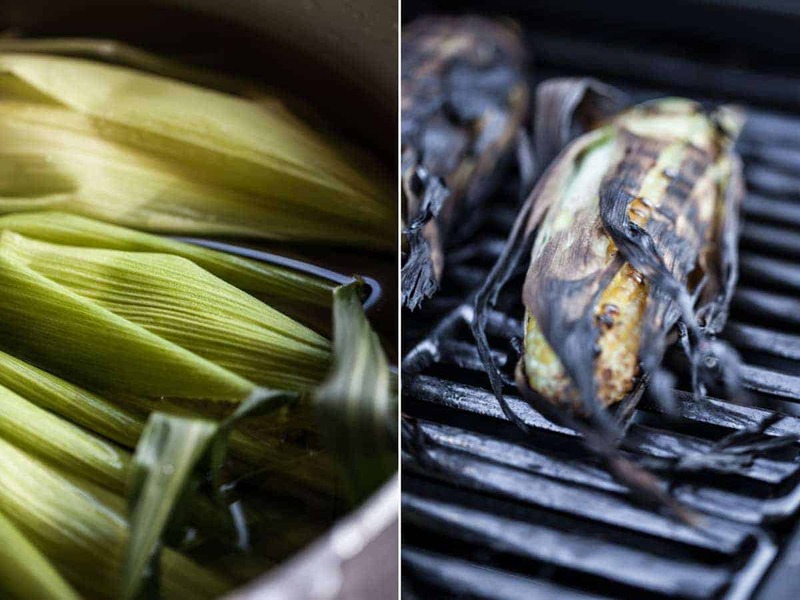 When husks are charred and corn is cooked, remove from grill, and carefully pull back husks and tie with string. You may want to use gloves because the corn will be hot. Transfer corn to a platter or tray and sprinkle remaining ingredients over the corn. Serve. Corn husks can be removed after cooking if desired. 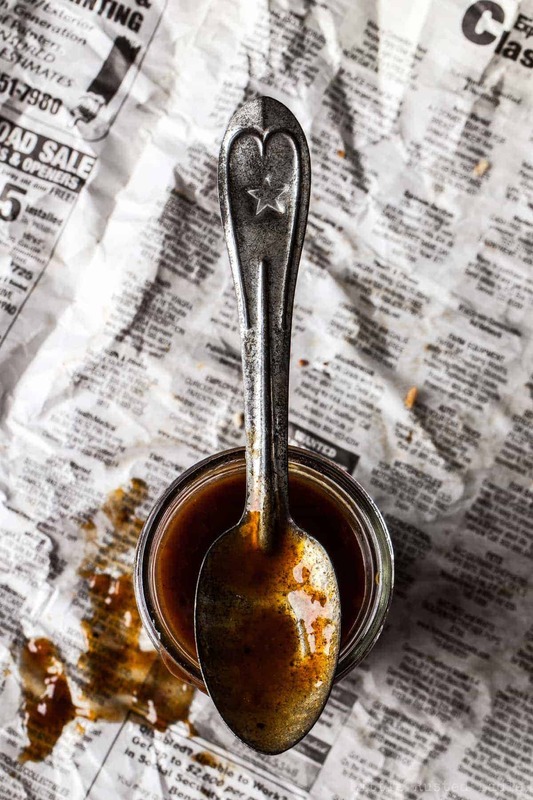 This sweet and savory butter gets much of it's flavor from a local spiced chutney. 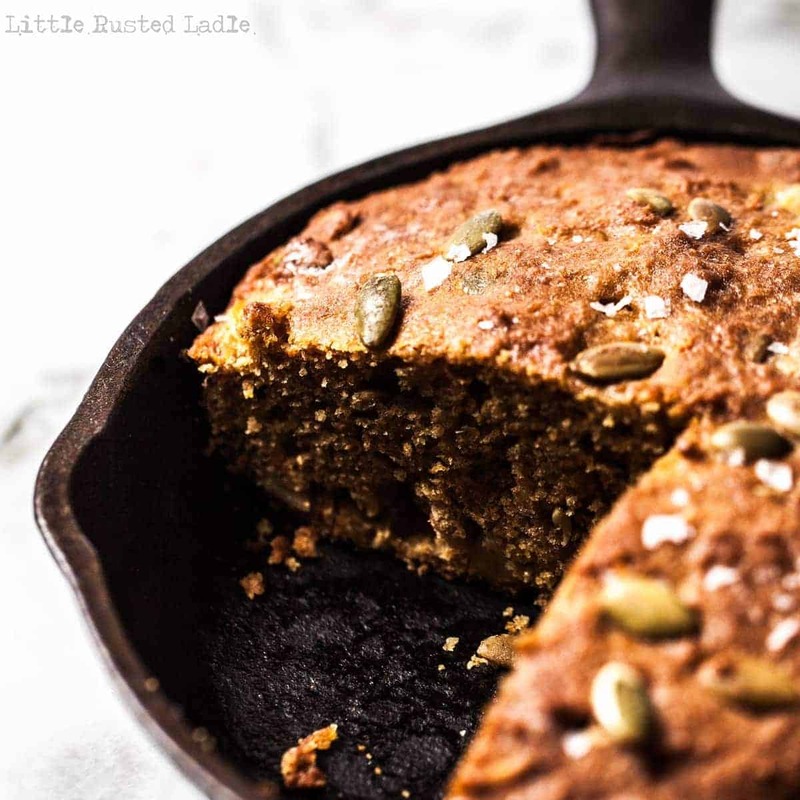 It goes well on almost anything, but it shines on corn or cornbread. Combine all ingredients in a medium size bowl. Beat on medium speed with a hand mixer until creamy and well blended. Use on fire roasted corn recipe above, or refrigerate until needed. You can substitute mango chutney for the Sa Braai chutney if desired. The pot pie has had many transformations over the 10,000 plus years since it made its first appearance. In 9500BC it was made with only oat, wheat, rye and barley, and flavored with honey. 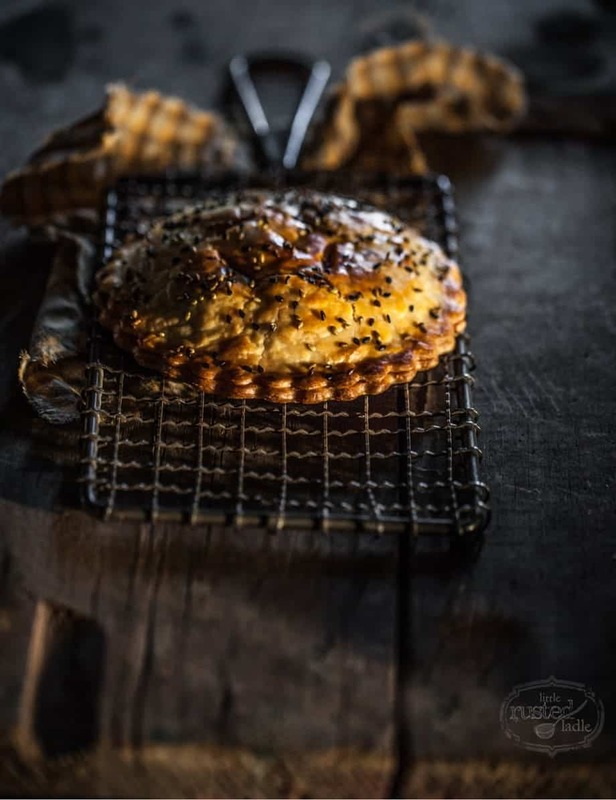 Savory meat pies made their way into the mix during medieval times, and were called “coffins”. I’m not sure whose idea that was, but if Swanson tried using that one, they would have gone out of business a long time ago. Since the crust was actually used as the actual baking dish (apparently Pyrex and Le Creuset had not been invented yet. ), it wasn’t actually edible. The name has changed over the centuries from coffins to pyes to magpies, etc. Many cultures gave it a go, learning from the previous version and putting their own spin on it. Then as usual, the French and Italians made them better by refining the pastry into a flaky pastry made with butter, which confirms once again that just about anything is better when made with butter. These flaky pastries filled with meat and vegetables made their way to other countries, where they were tweeked to fit their own cultures. 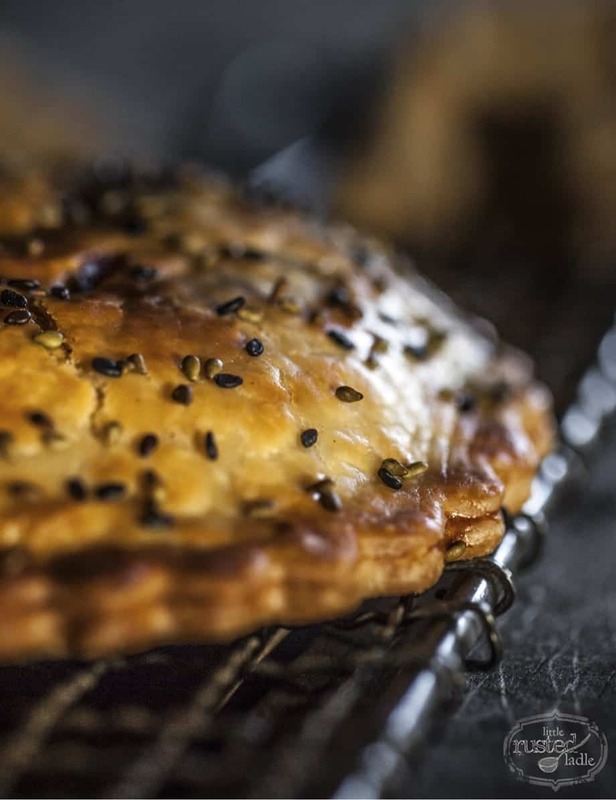 They were given names like steak pie, tourtiere, Jamaican patty, fatayer, samosa, empanada, and of course, the pasty, which made its way into my childhood memories thanks to my mom’s Upper Peninsula Michigan ancestry der don’t cha know. 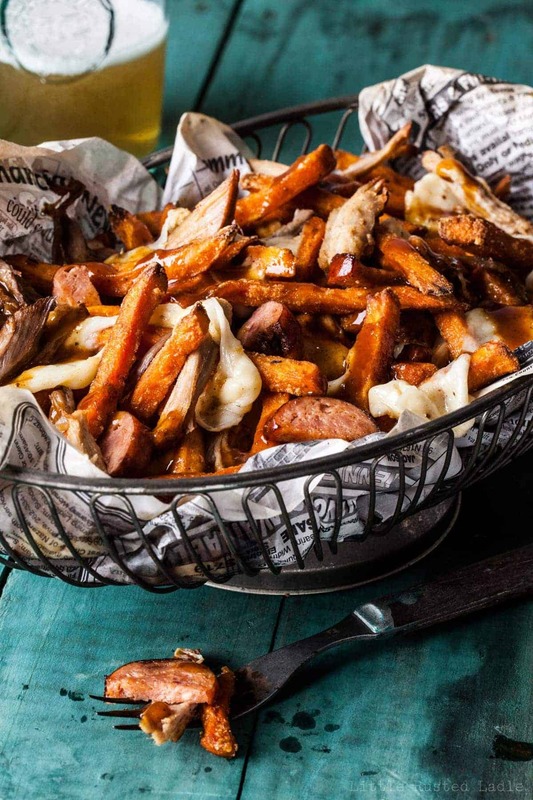 Sorry, even writing about those Cornish beef and potato filled treasures makes me write like a “yooper”. A dialect used in northern Michigan and Wisconsin. Since Jena and I wanted to do an article on pot pies, we thought we would create some fun variations to the popular chicken pot pie. Our goal was to do four or five different kinds of pies like we usually do and post one every week. However, life sometimes throws curveballs like babies, sickness, work and moving that sometimes alters your intentions. So, “you can’t always get what you want, but if you try sometime, you just might find, you get what you need.” Thanks Mick, we agree with that philosophy. Instead of doing four, we did one good one, and added another video. 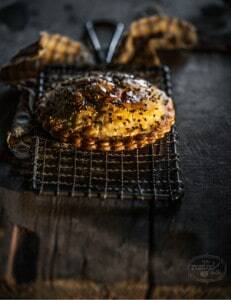 Rather than creating a pot pie big enough to feed a family, we made a delicious hand held version perfect for those who like to eat on the run. 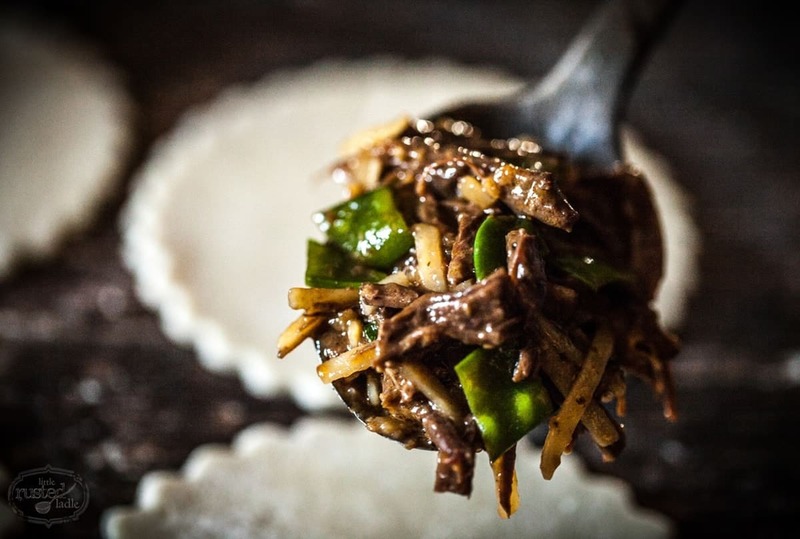 Also, since you don’t see too many pastries filled with meat in the far east besides egg rolls or pot stickers, we decided to do a pot pie version of a Korean beef taco. 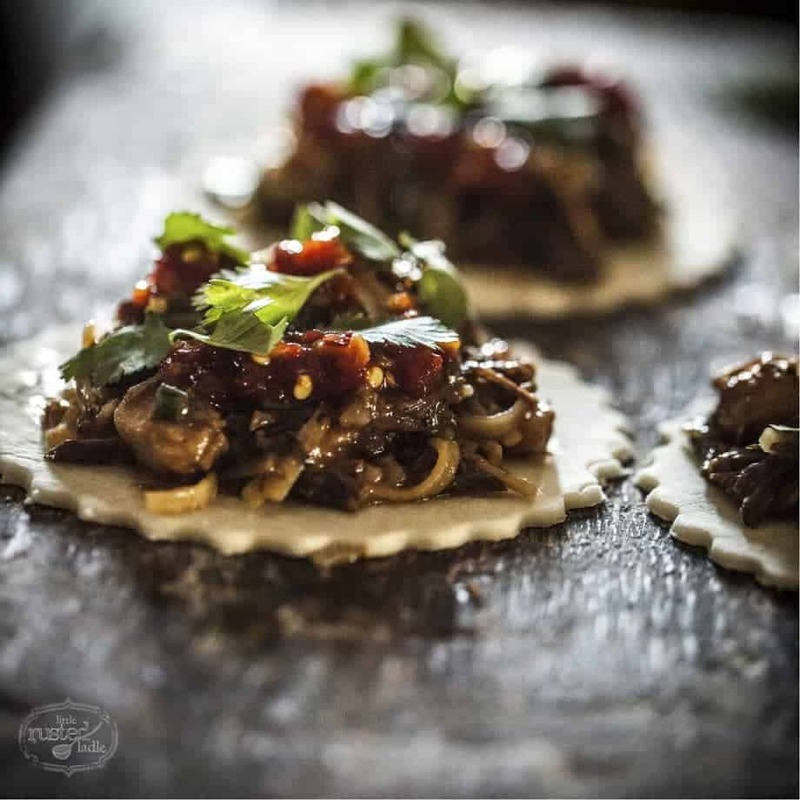 For these Korean Beef Hand Pies, we started with boneless beef short ribs cooked in a pressure cooker with chicken broth, soy, chili paste, garlic, ginger, scallions and mushrooms until tender and juicy. The meat is shredded and then rice noodles and pea pods were added for texture and color. This mixture was cooled, then spooned onto store bought dough rounds cut into four inch fluted circles using a small tart pan. A large tin can like we used for the pound cake can also be used, or simply make cutouts with round paper templates. 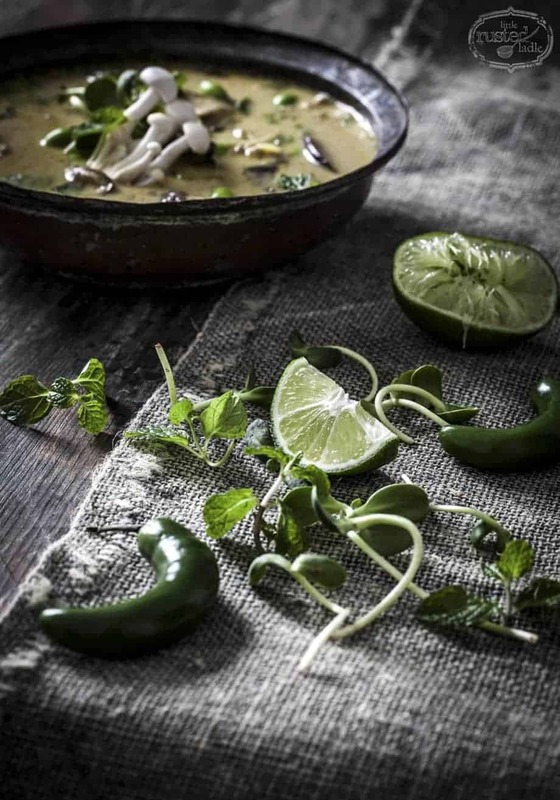 The addition of chili paste and cilantro on top give it a little acid and fresh flavor. Brush the edges with egg wash and top with another four inch pastry round on top that has been rolled a little larger to accommodate the filling. 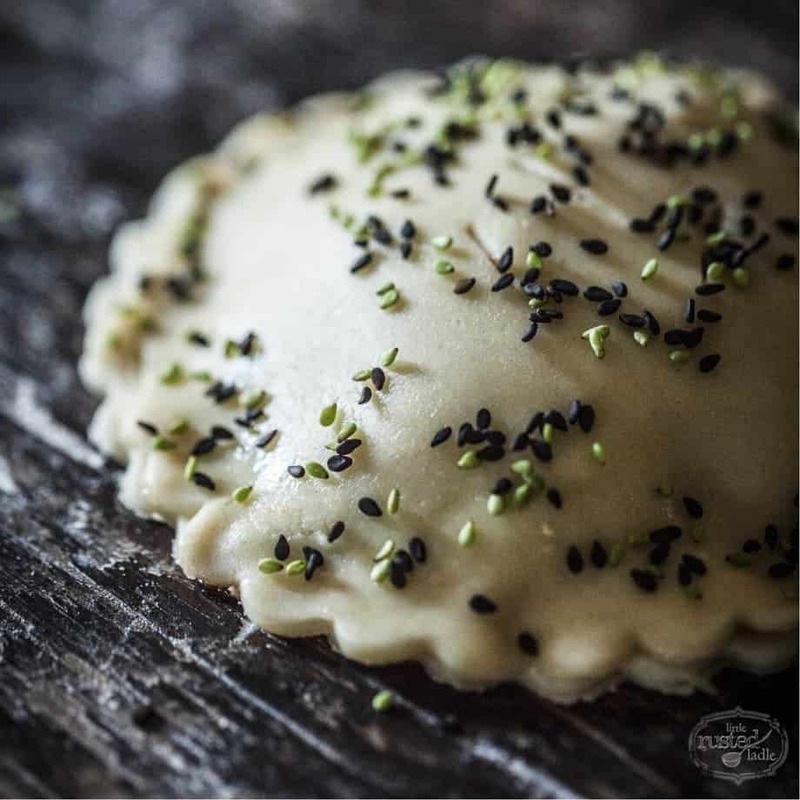 Sprinkle the top with wasabi flavored and black sesame seeds, and bake until golden brown. We loved their cute appearance and the portable nature. The tender short rib meat combined with the savory and spicy juices was a perfect contrast to the flaky, buttery crust. These would be wonderful appetizers for a party if made a little smaller, or excellent as lunch item that can be reheated in the toaster oven or as dinner with a light salad. 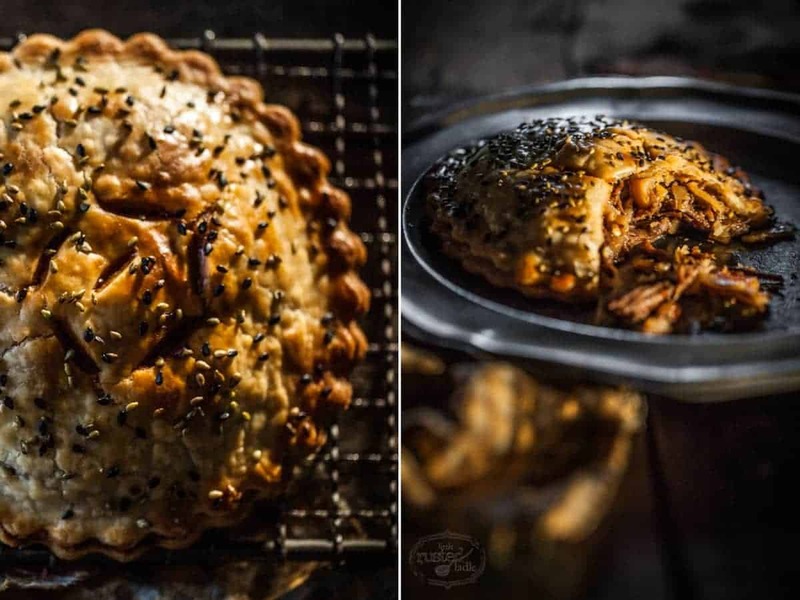 So the next time you’re thinking about whipping up a chicken pot pie, think a little outside the box, or should I say pie? For a spring time treat, add some asparagus, fresh morel mushrooms, tomatoes and cheese. See the article we did two years ago on morel mushrooms as an option for the filling. Some pulled pork and jerk seasoning, seafood or perhaps some fresh organic vegetables and tofu if meat isn’t your thing. Regardless of your choice, the time tested pot pie is and will always be a comfort food classic because of it’s very nature. It’s an edible gift filled with wonders that make our tastebuds happy. Until next time, remember to cook with love and live to cook. 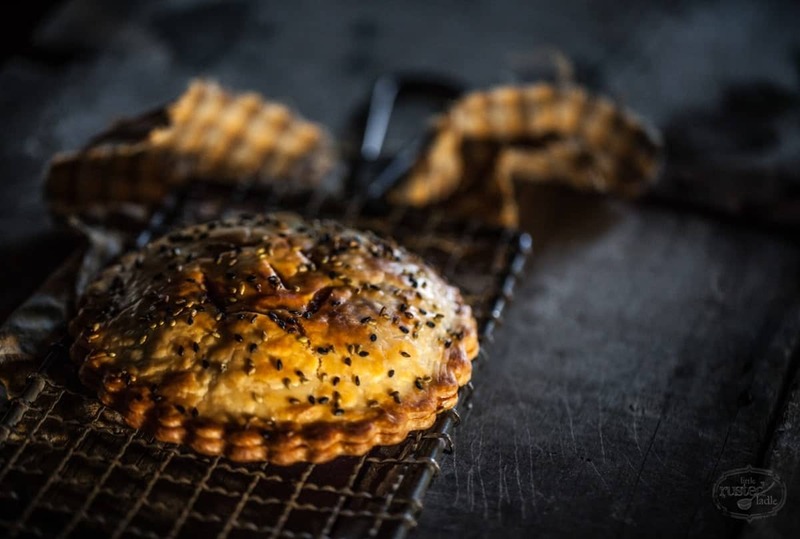 The Pot Pie gets a facelift with this Korean inspired hand pie. They can be made as an appetizer, a snack, as an on the go lunch or as a entree. Place short ribs in a large pressure cooker or crock pot. In a small bowl, combine next 7 ingredients. Pour mixture over short ribs. Move ribs around to coat with sauce. Cover pressure cooker and seal. Place cooker over medium high heat. When pressure cooker seals, set timer for 30 min. Remove cooker from heat and release pressure until top can be opened. Transfer meat to a plate and shred with 2 forks. Meanwhile, skim off fat from remaining cooking liquid. Break rice noodles into 2" pieces and add to cooking liquid. Cut pea pods into 1" pieces and add to cooking liquid. Add shredded beef back to liquid. Fold mixture together until beef is well sauced and ingredients are blended. Refrigerate beef mixture until ready to fill pies. To make pies, cut out 16 / 4" rounds using a can, cutter or a small tart pan. Place rounds on a parchment lined sheet pan. Spoon about ½ cup of beef mixture over 8 dough rounds, leaving about ½" border. Pre-heat oven to 400 degrees. Spoon about a teaspoon of chili sauce over beef, then top with a few cilantro leaves. Brush edges with beaten egg. Place remaining dough rounds on top and carefully press together to seal. Brush tops with egg, then quickly sprinkle with sesame seeds. Bake for 20-25 minutes or until golden brown. Serve.